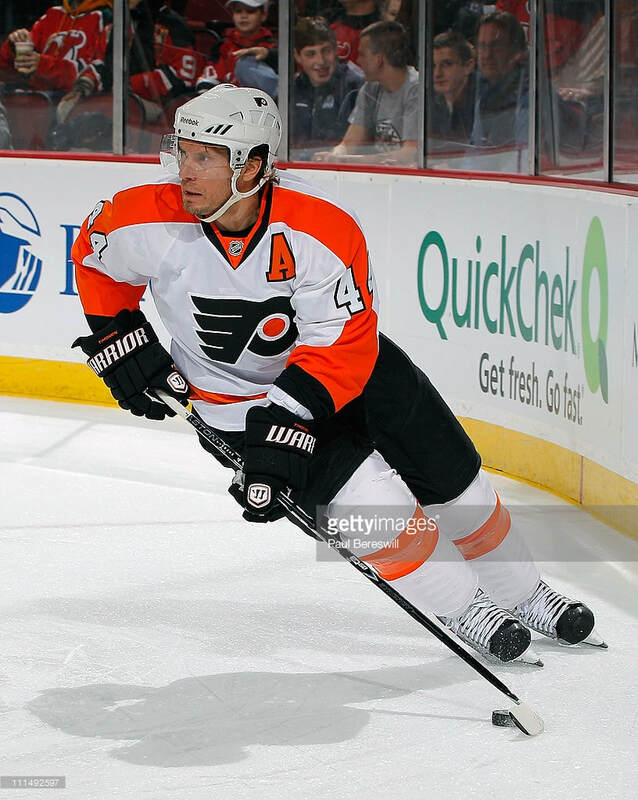 On December 15, 1996, the Philadelphia Flyers acquired one of the most prolific offensive defensemen in the history of the NHL. 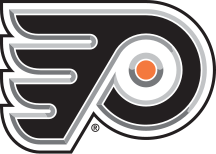 In 94 games in over a season and a half with the Flyers, Paul Coffey compiled 8 goals and 47 assists for a total of 55 points. 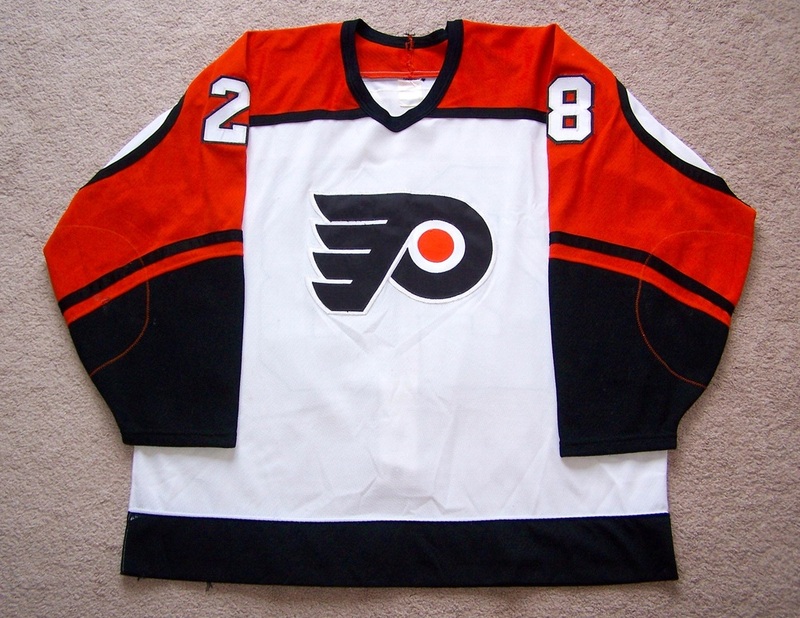 This jersey was worn during either the 96-97 season or the 97-98 season. 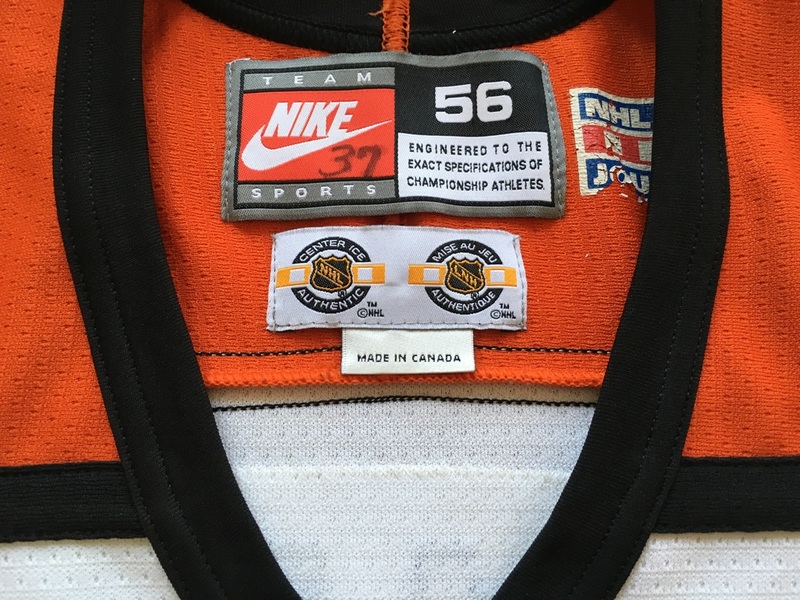 The tagging inside the jersey leads me to believe it was worn during the 97-98 season. 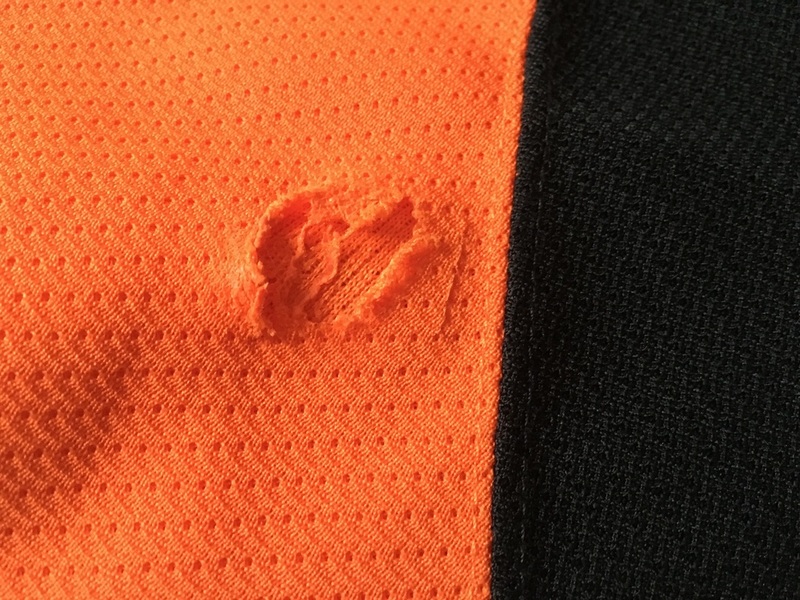 The wear is on the lighter side with the front of the jersey showing a 2" black mark to the right of the crest, three slash marks through the crest, a small fabric pull above the crest, and a 1" black mark to the right of the crest. The left arm features two black marks on the inside elbow, staining near collar, small burn in the elbow area, 2 nice board burns in the lower elbow area, and one un-repaired hole in the elbow area. The right arm has staining near the collar and two black markings on the inside elbow. 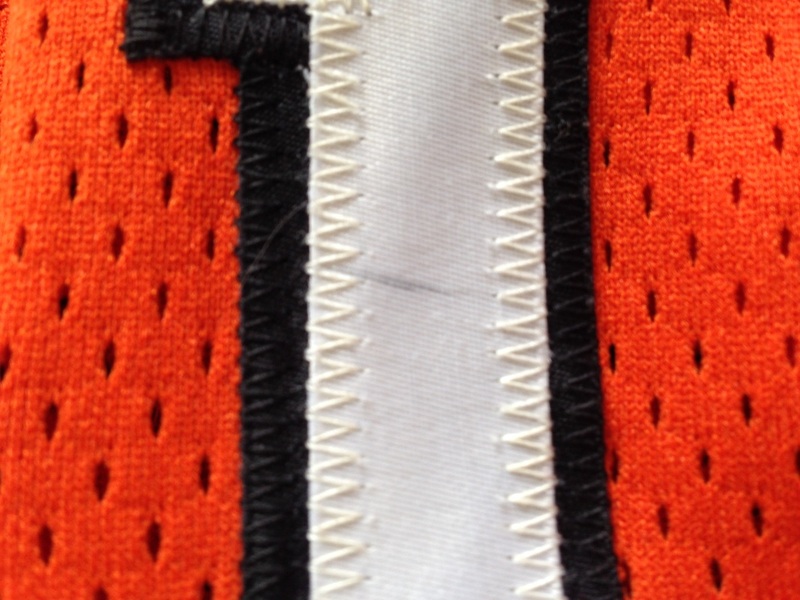 The rear of the jersey shows even wear with some loose threads on the left #7. 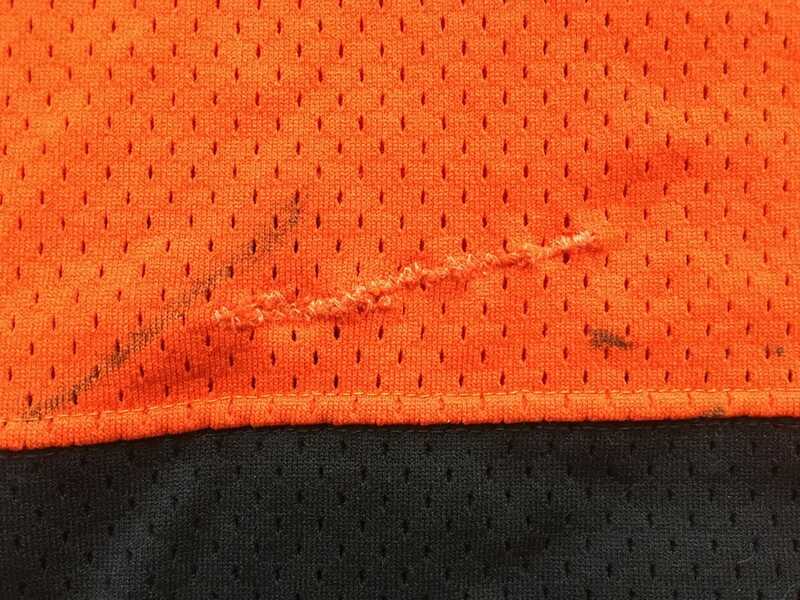 The inside of the jersey has some pilling above the crest and 77 penned on the Nike neck tag in black sharpie ink. 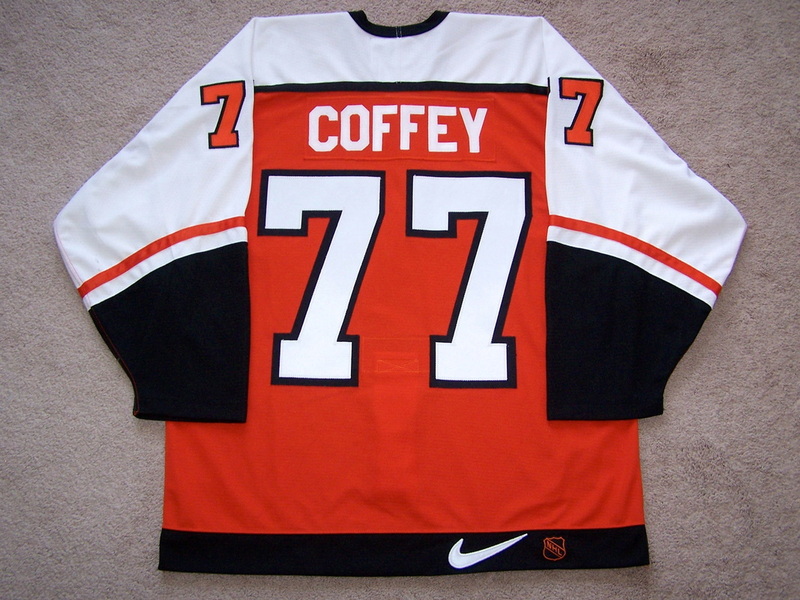 Coffey remains second only to Ray Bourque in all time scoring by a defenseman. 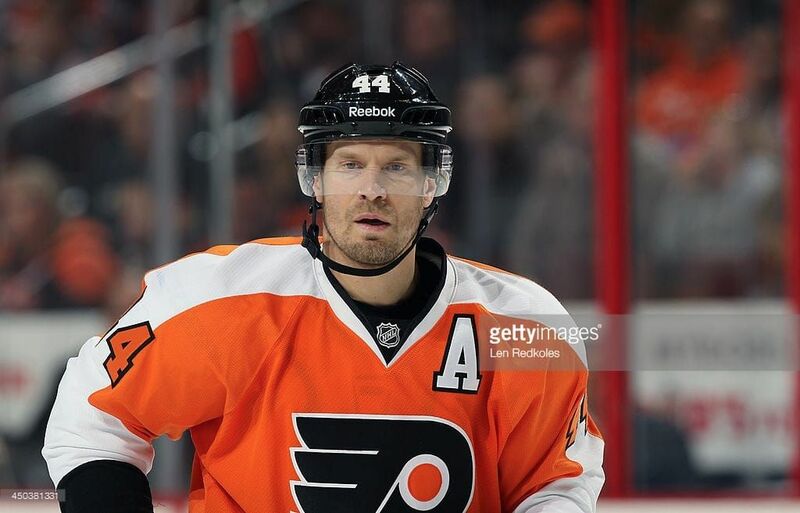 He, however, averaged more points per game than did Bourque (1.09 Coffey / 0.98 Bourque), having played 203 fewer games but lagging only 48 points behind. 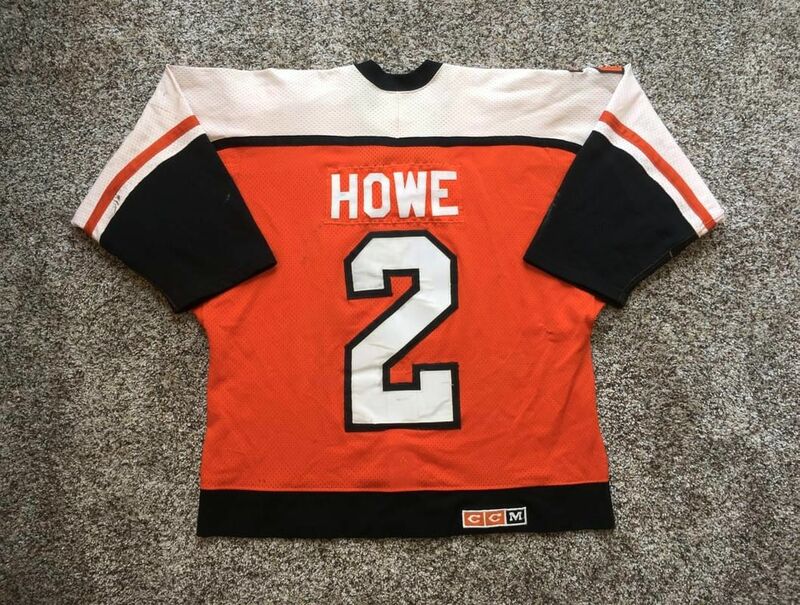 Mark Howe 1986-1987 Road Jersey w/ "A"
This jersey was worn by Mark Howe on the road during the 86-87 regular season. 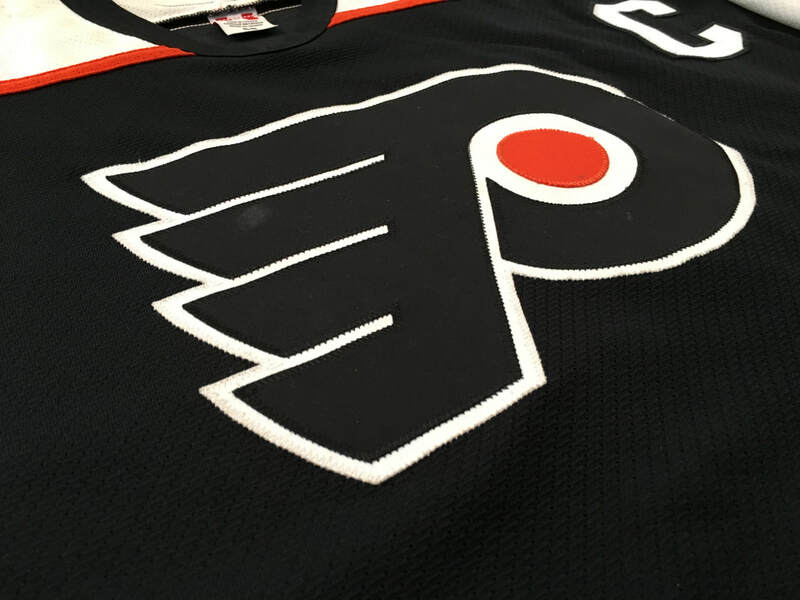 It features moderate wear with the front of the jersey showing a large black stick mark under the Flyers crest, a slash mark on the crest, two 1" repairs on the lower left side, a 1/2" repair on the lower left side, black slash mark on the lower right side, a 3" repair on the lower right side, and the Alternate Captains "A" sewn to the upper left chest. 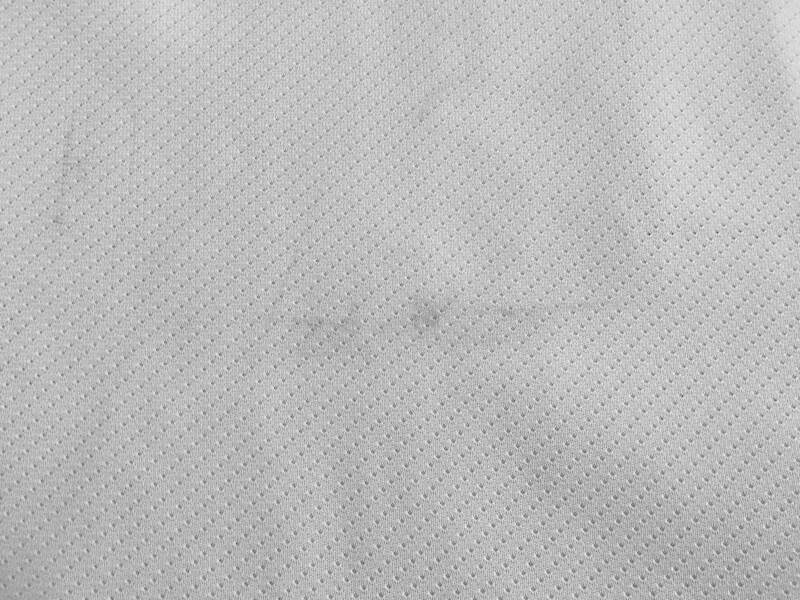 The right sleeve has four black markings, a 5" board burn on the cuff, and two add'l board burns on the cuff. The left sleeve exhibits good wear with a 3" repair, black markings throughout, red board paint under the sleeve #2, and two nice board burns on the cuff. 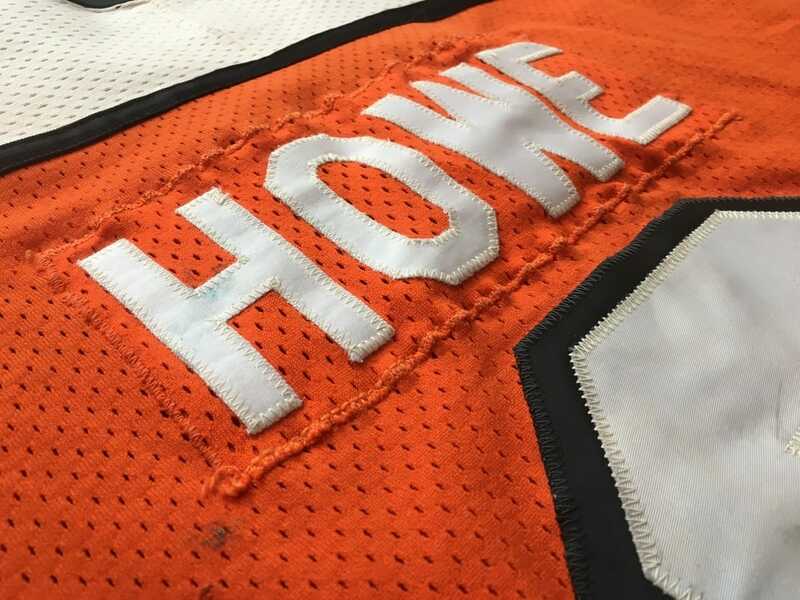 The rear of the jersey shows even wear with black markings on the #2, three areas of stick marks, a 1" loop style repair, blue paint on the H of the Howe nameplate which is sewn on using a matching mesh material. 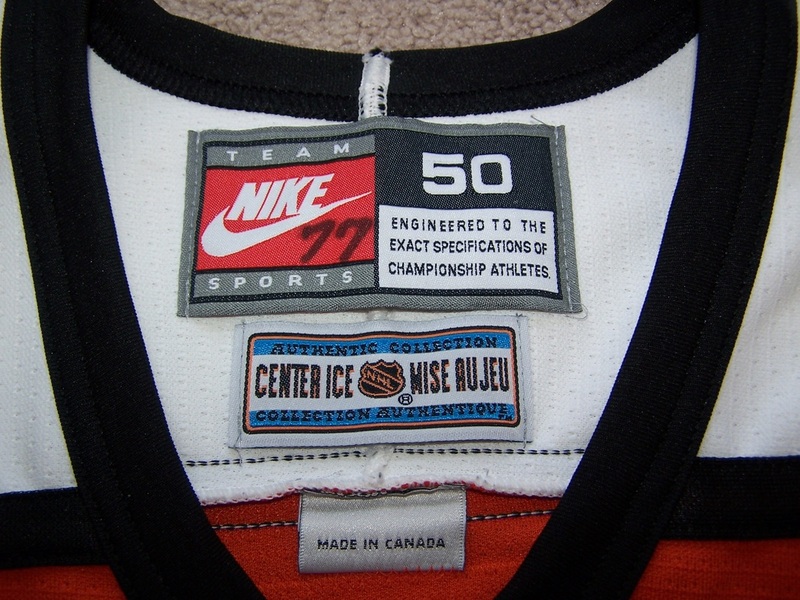 The inside of the jersey exhibits the original fight strap with light salting, 50 penned on the CCM neck tag, and heavy pilling on the left underarm and elbow area. Obtained from former NHL goaltender, Chico Resch, in December 2016. 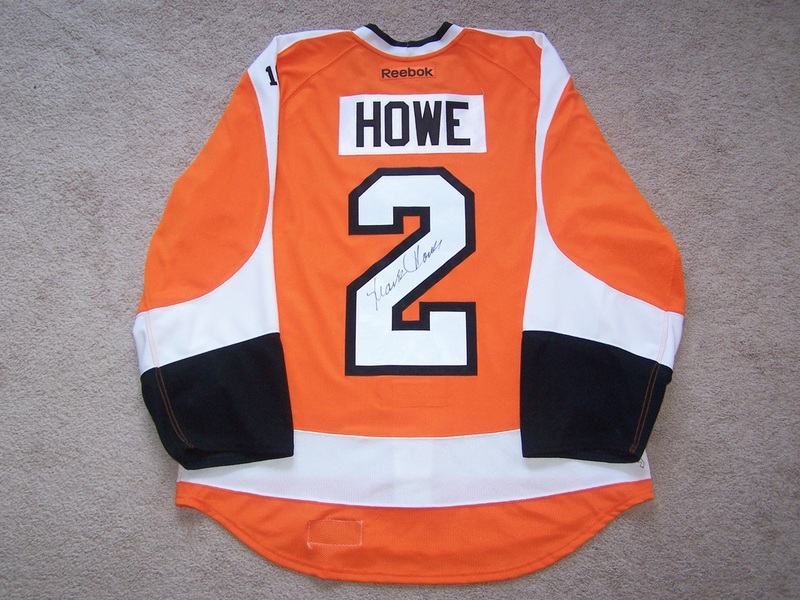 This home jersey was worn by Hall of Famer Mark Howe during either the second half of the 89-90 season or the 90-91 season. 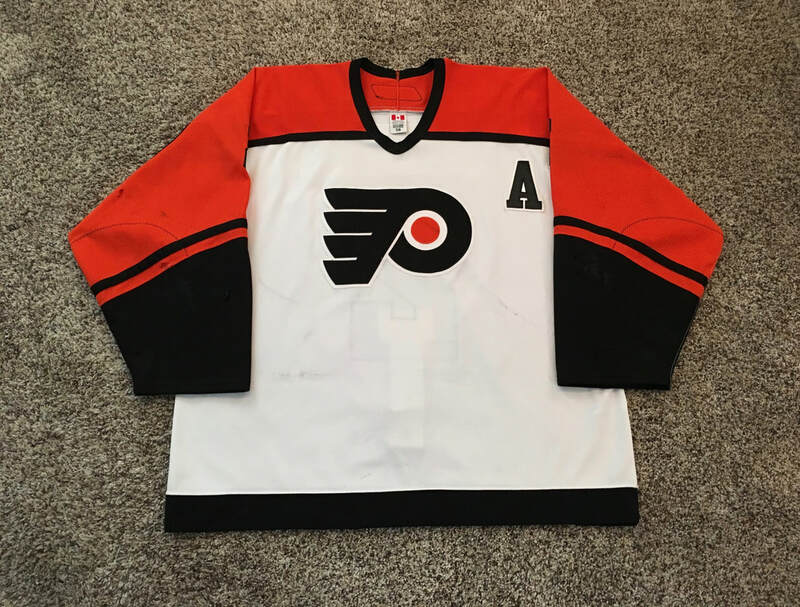 It has nice game use with the front featuring a few slash marks on the Flyers crest, numerous fabric pulls on the lower front, two 1/2" team repairs on the lower right front, and blood staining throughout. 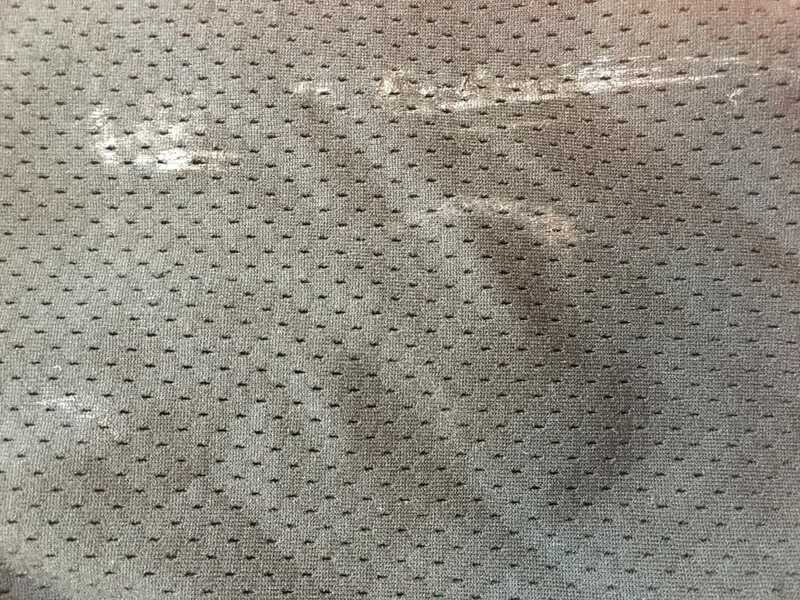 The left arm shows two small board burns in the elbow area, two light board burns in the black cuff area, a white mark with slightly torn material on the upper front shoulder area, a board burn or cut in the middle of the sleeve #2, and a 1" black marking. 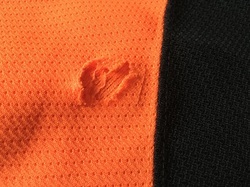 The right sleeve has four light board burns in the elbow and cuff area, heavy pilling on the outer cuff area, an un-repaired hole to the left of the sleeve #2, and a few black markings in the orange sleeve area. 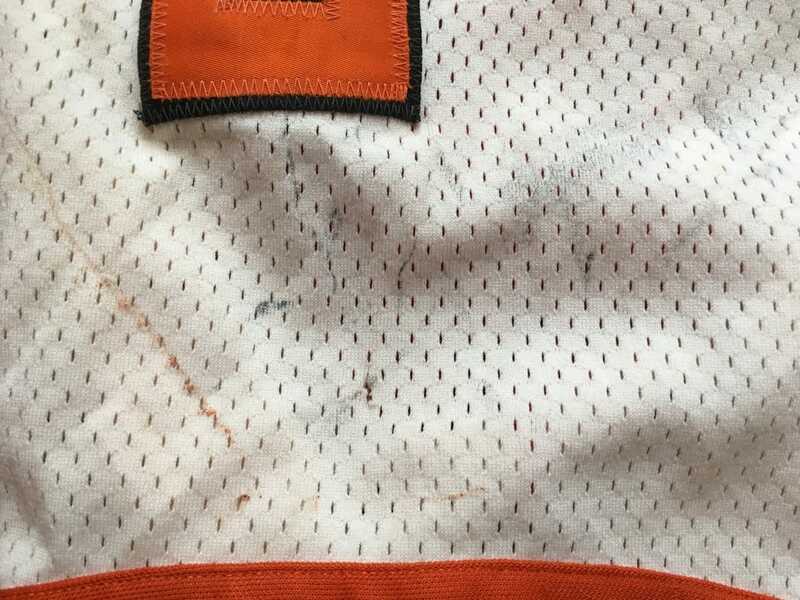 The rear of the jersey shows nice even wear with more blood staining, loose and missing stitching on the rear #2, more fabric pulls, and typical diagonal "Mark Howe" signature on the #2 that was obtained by the previous owner in June of 2003. 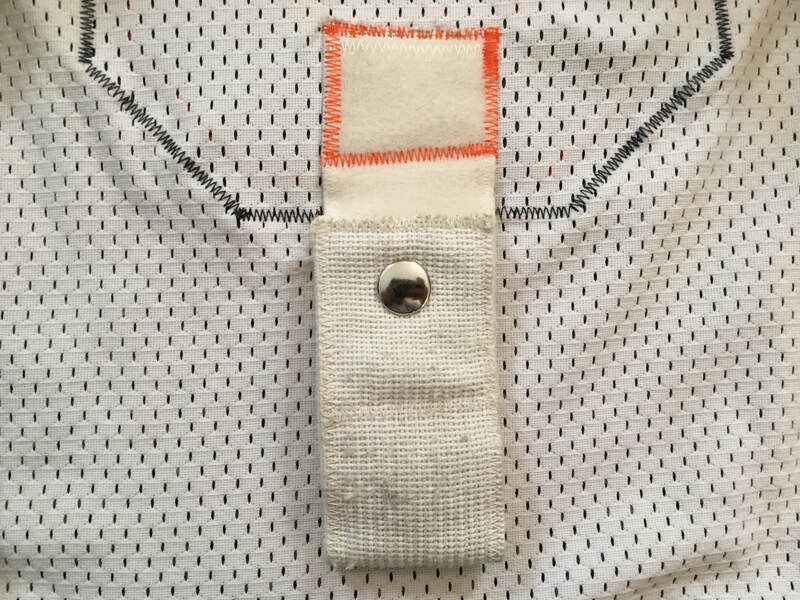 The inside of the jersey features sweat staining, pilling in the right elbow area, pilling on the upper right back area behind the nameplate, and heavy salting to the fight strap buttons. 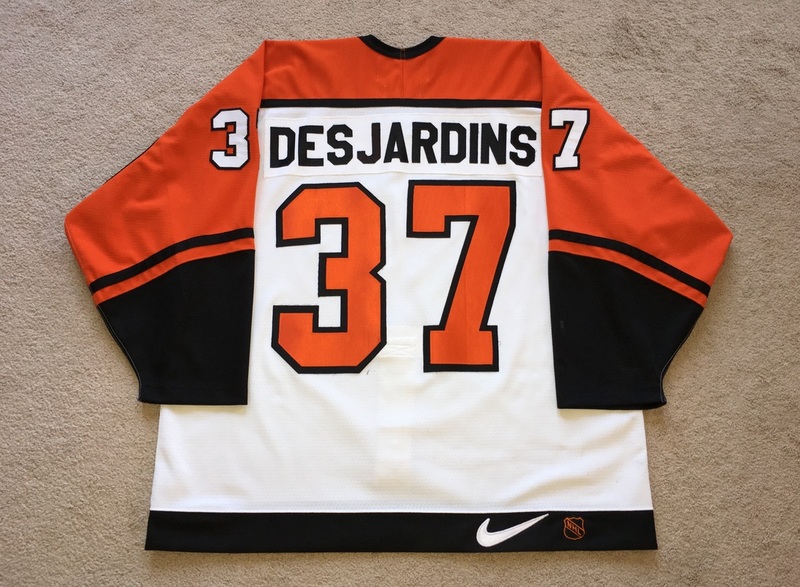 Eric Desjardins 1997-1998 Home Jersey w/ "A"
This jersey was worn by Desjardins during the home games in the first half of the 97-98 season. The jersey exhibits really nice wear throughout. 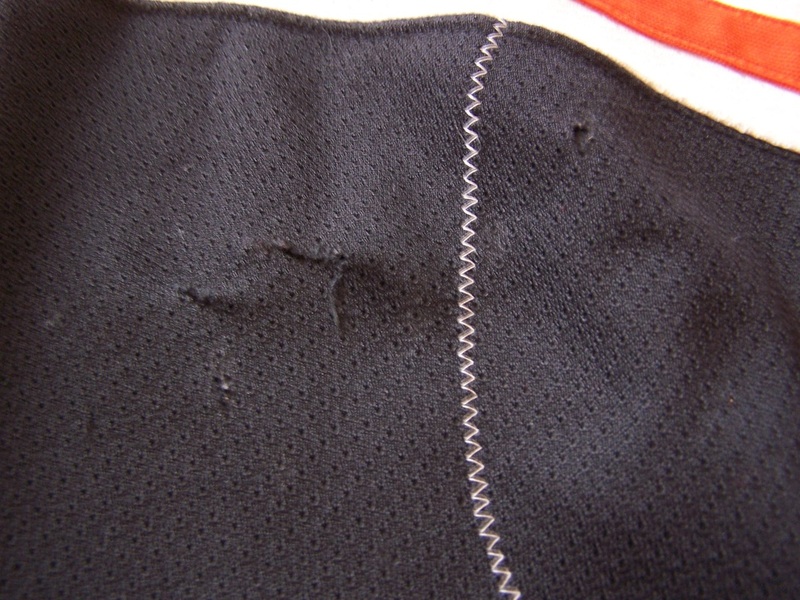 The front of the jersey shows fourteen black markings, fabric pulls, a few scrapes to the crest, and damage to the neck stitching. The right arm has five team repairs, numerous board burns in the cuff area, and four black markings. 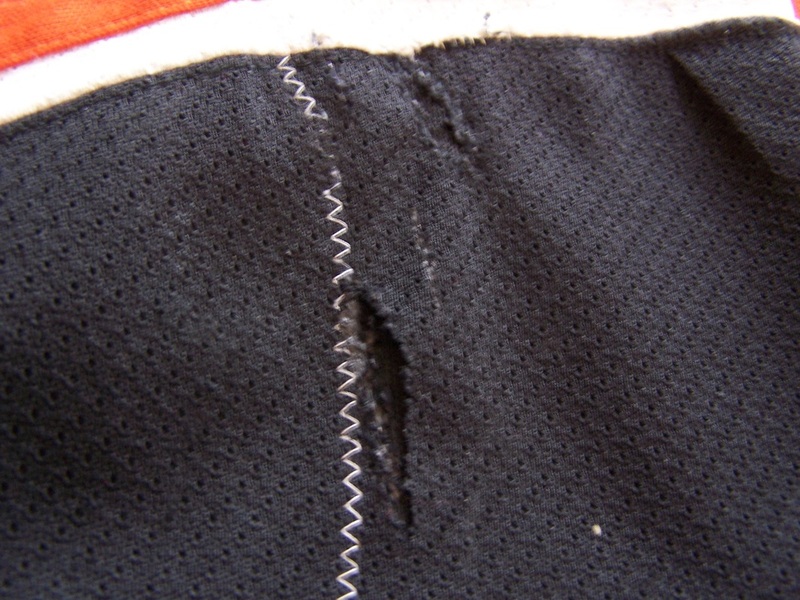 The left arm shows two team repairs, six board burns, fabric pulls, and three black markings. 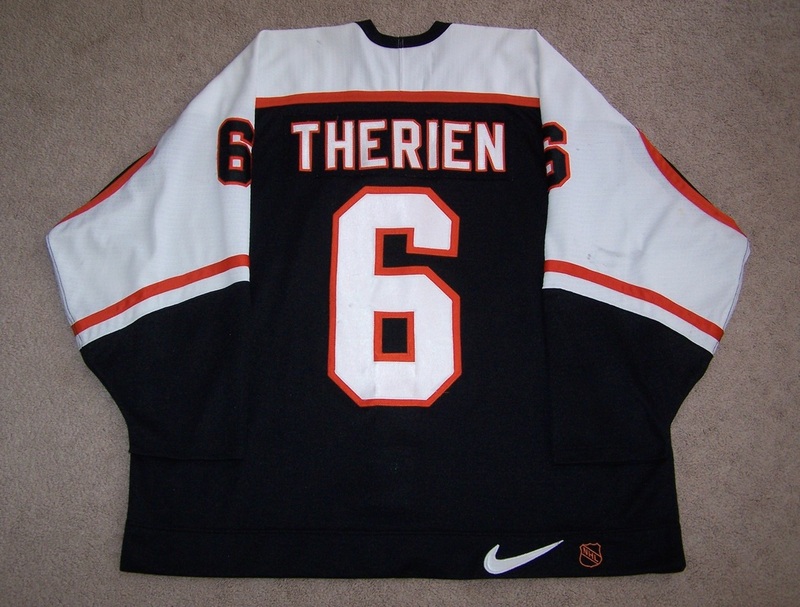 The rear shows nice even wear with fabric pulls, brown stains on the lower right side, red paint on the rear #3, and a nice signature in Desjardins' own hand on the rear #7. 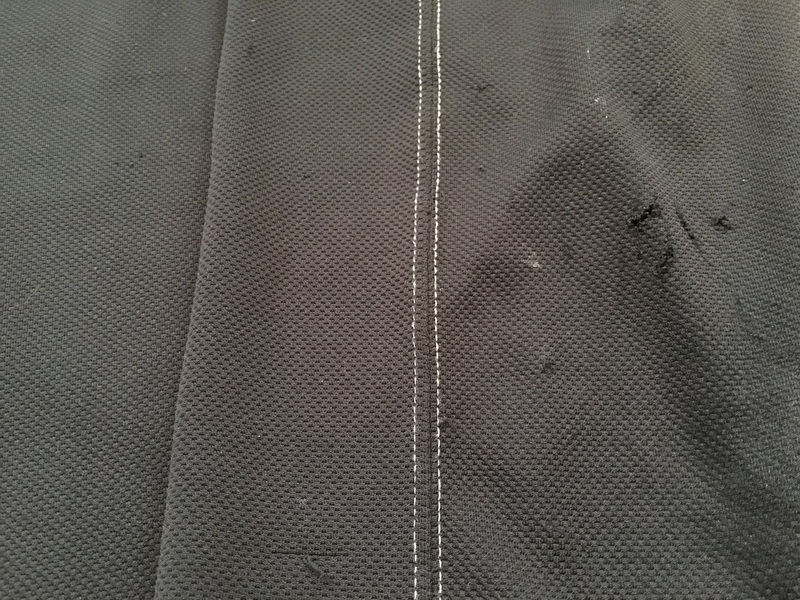 The inside shows evidence of wear in the way of inner fabric pilling on both arms and near the fight strap. 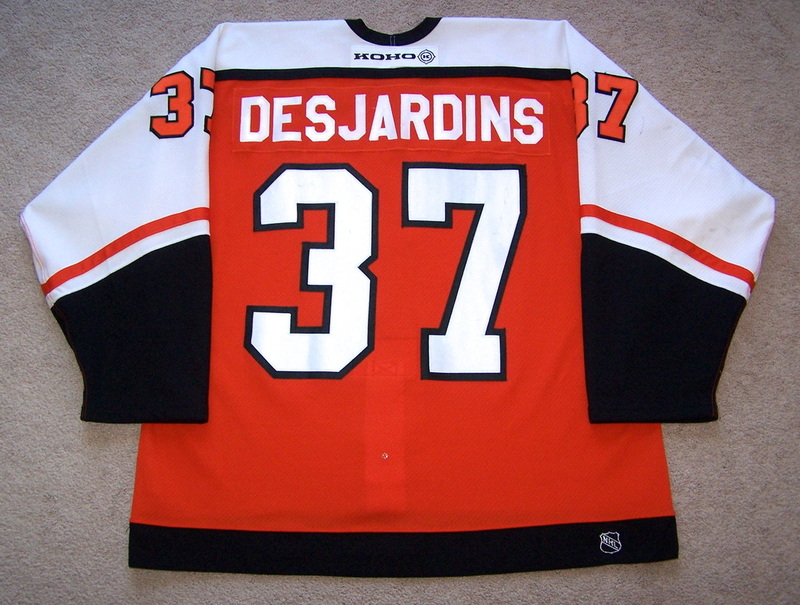 Eric Desjardins 1998-1999 Home Jersey w/ "A"
This home jersey was worn by Rico during the 1998-99 season. 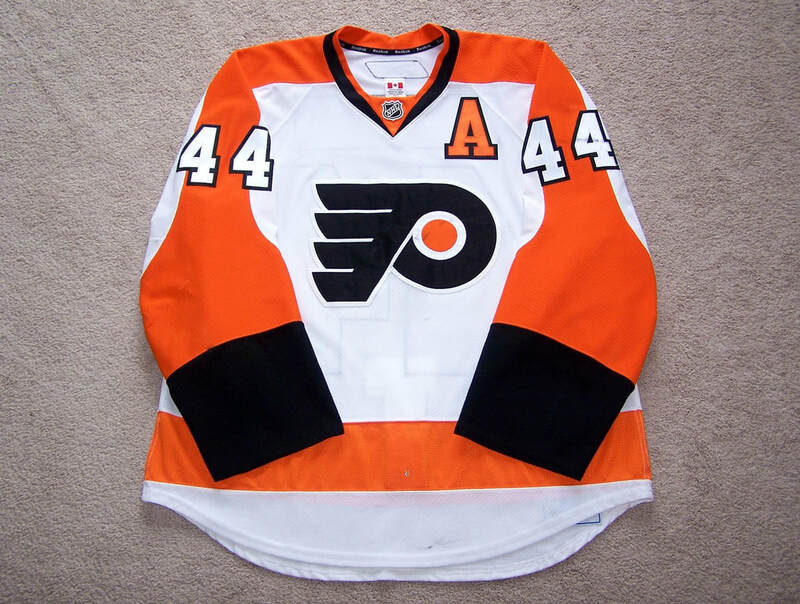 The front of the jersey has numerous black markings, an alternate captains "A" on the left chest, and a slash through the crest. 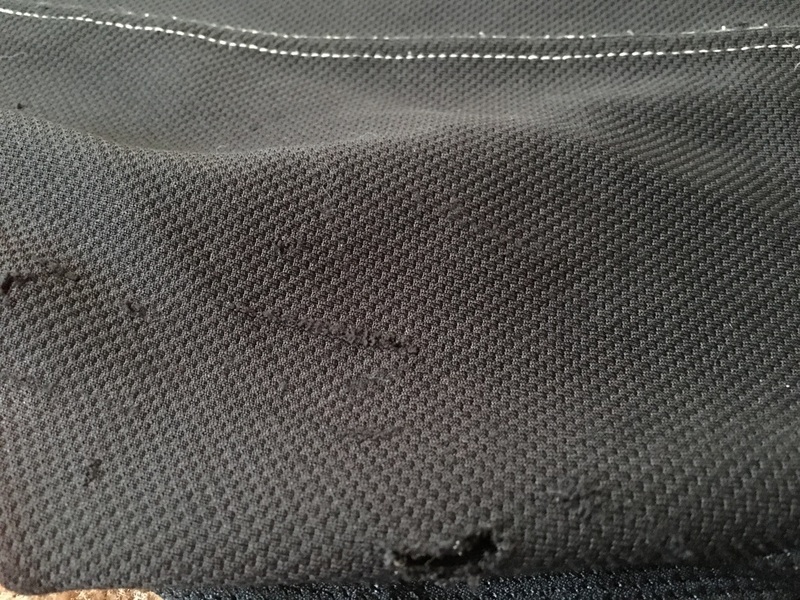 The right arm exhibits a burn hole near the edge of the sleeve #3, six black markings, fabric pulls, two board burns in the elbow area, and three additional board burns in the cuff area. The left arm shows two black markings, one board burn in the elbow area piping, a 2" un-repaired hole in the cuff area, and three board burns in the cuff area. 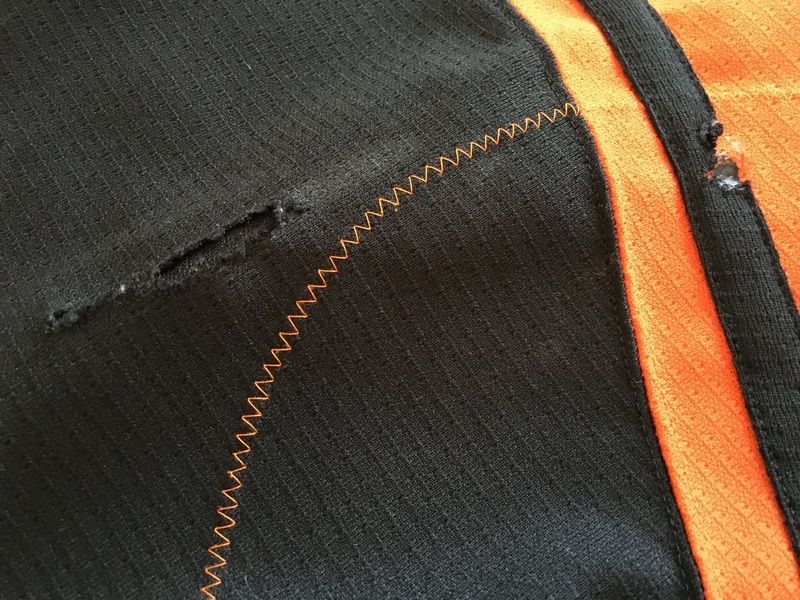 The rear of the jersey has a few black markings. 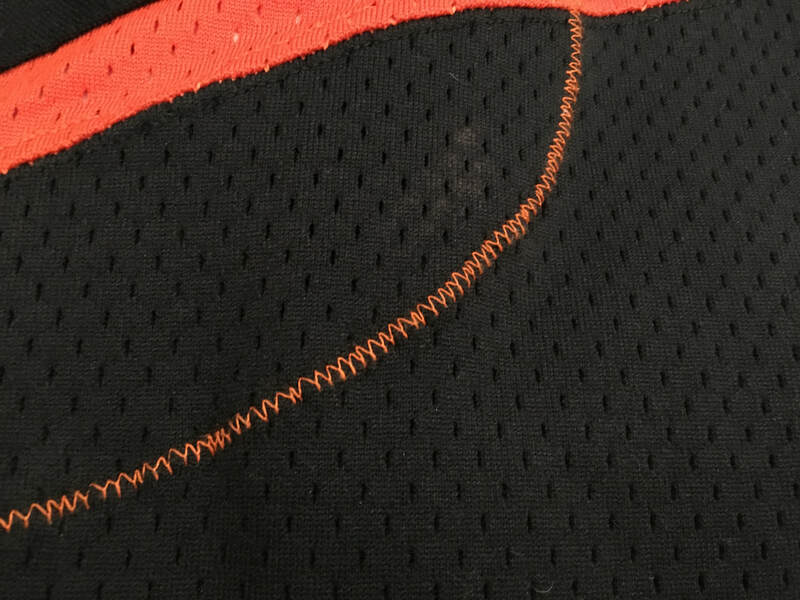 The inside of the jersey has "37" penned in black sharpie on the Nike tagging. 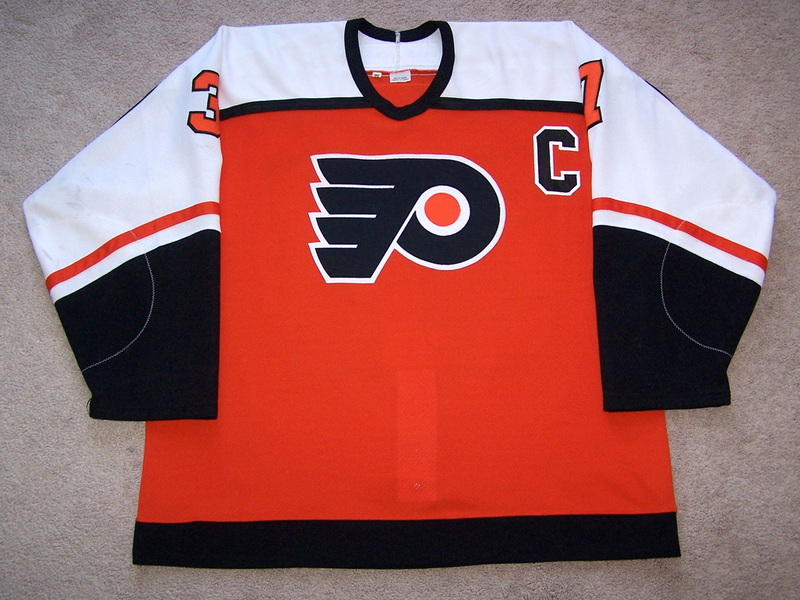 This road jersey was worn by Desjardins during his first full year as captain of the Flyers. 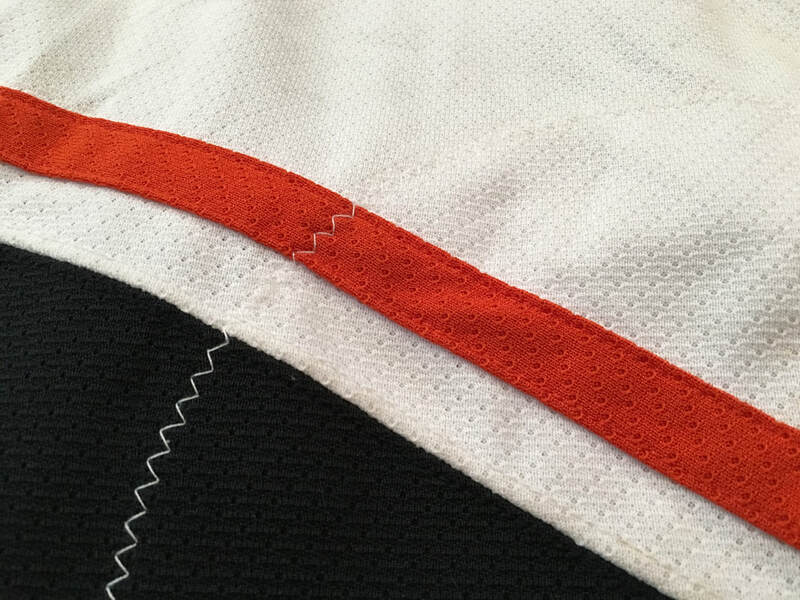 The jersey features moderate wear with a few fabric pulls on the front lower left side and a 2" black stick/puck mark on the lower left side right above the black hem. The right arm shows numerous black markings around the arm numbers and elbow areas and three small board burns in the elbow area. 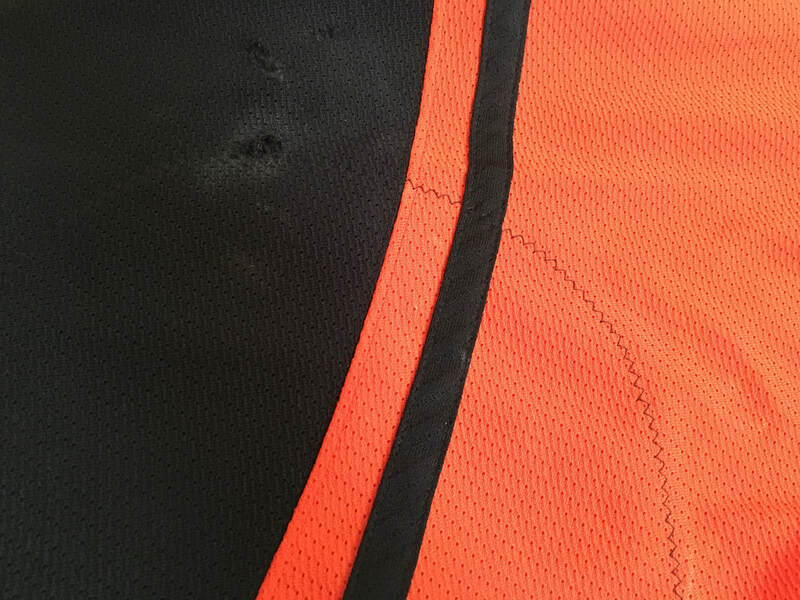 The left arm has evidence of numerous black marks throughout, one un-repaired cut, a board burn mark on the #7, a board burn on the orange piping near the elbow area, and five small board burns on the elbow and cuff areas. 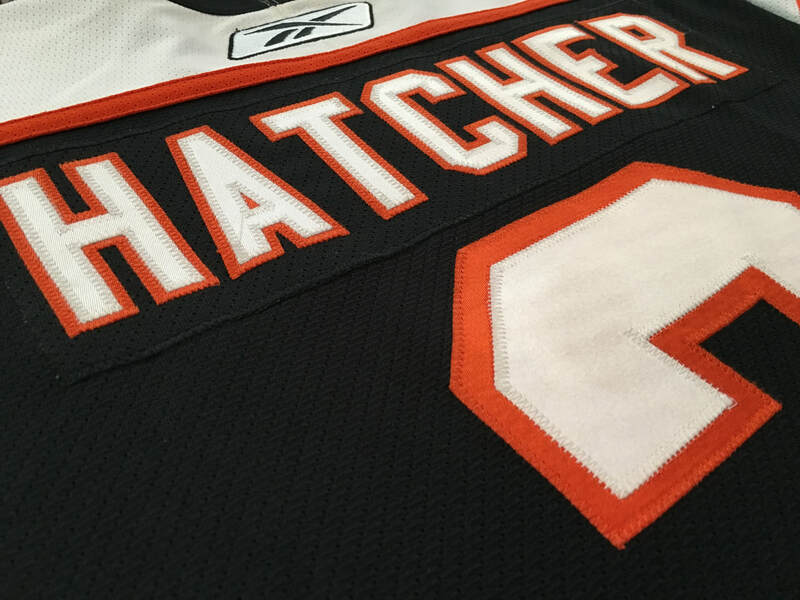 The rear of the jersey show even wear with three black marks on the #3, and a burn on the 'N" nameplate letter. The fight strap shows light salting. 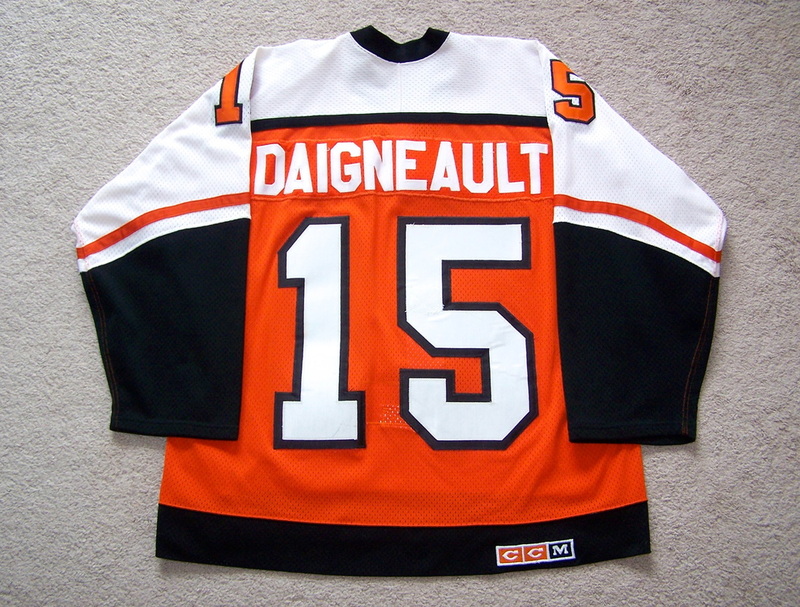 This alternate jersey was worn by Eric Desjardins during the 05-06 season, his last as a Flyer. 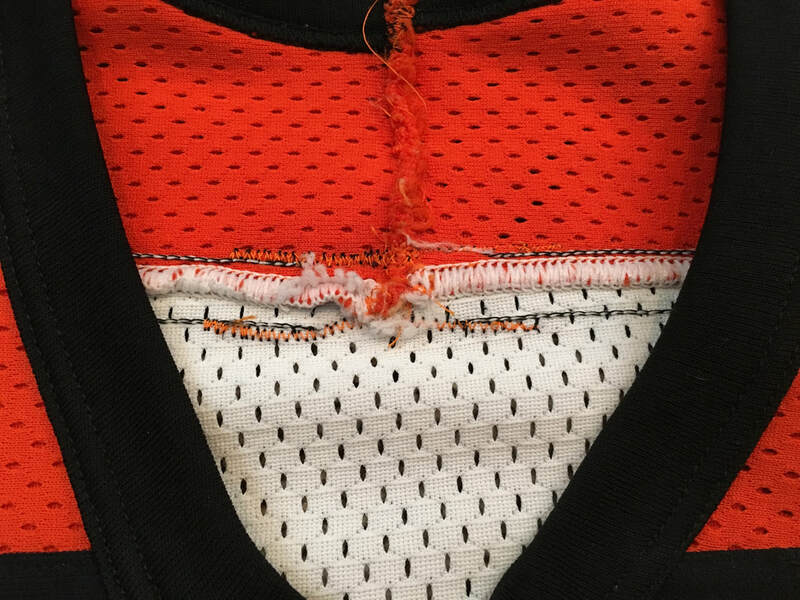 It was worn for 6 games during the second half of the season. 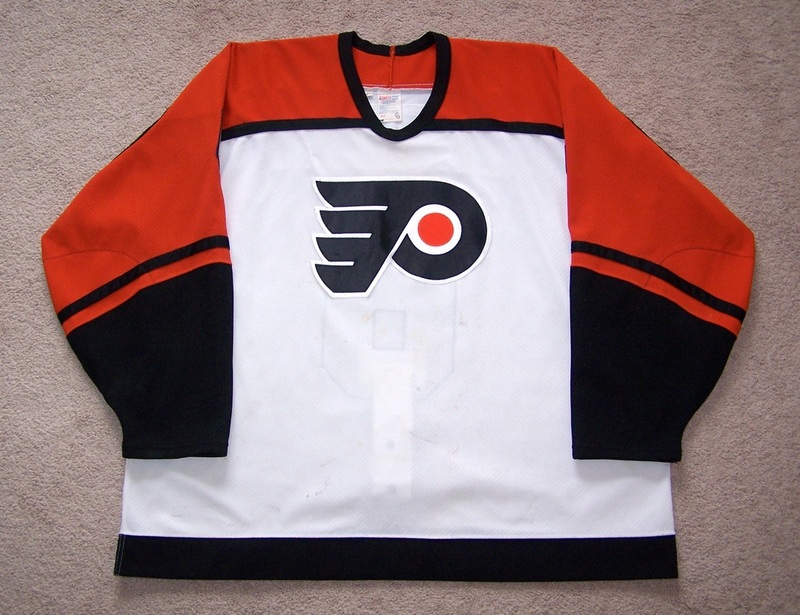 The jersey shows light wear overall with the front exhibiting even wear, a few marks on the crest, and a 3" black stick mark on the lower right side. 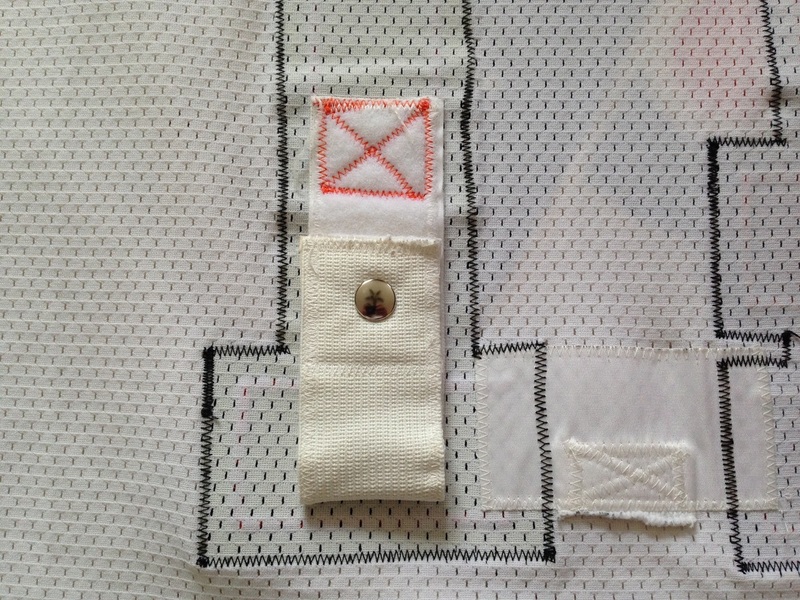 The left arm has a 1" scrape/board burn to the cuff area, and a light board burn in the elbow area. The right arm has two black markings under the sleeve #3, and a 2" black slash mark next to the sleeve #7. 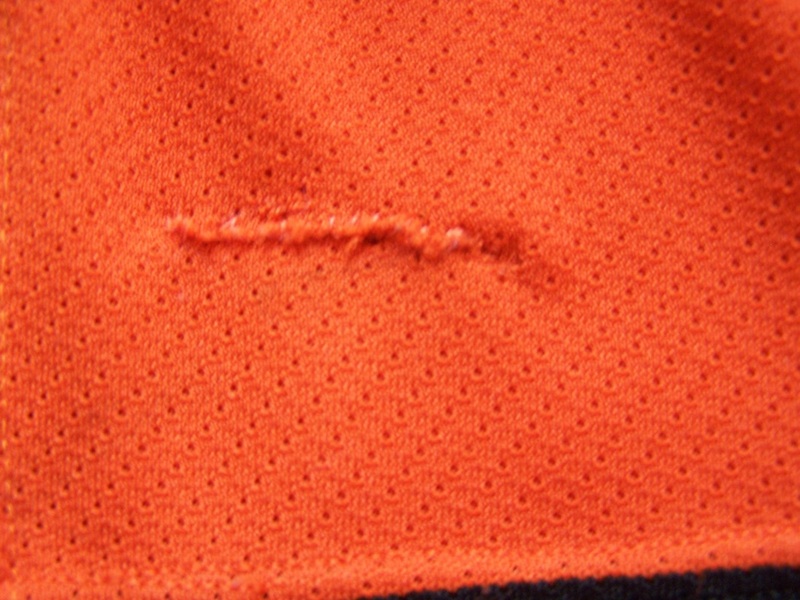 The rear of the jersey exhibits a board burn on the lower right shoulder area just above the nameplate, and a couple of black marks in the white stripe near the hem. 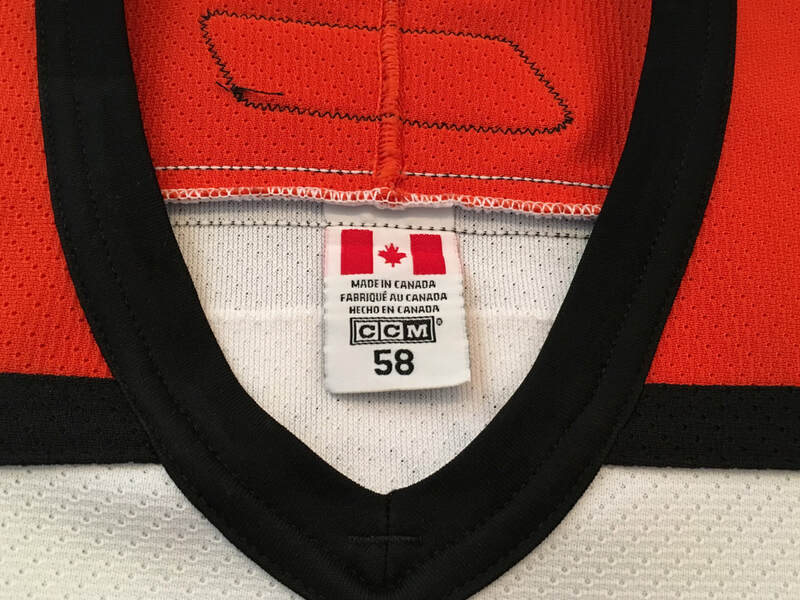 A size 58 neck tag and MeiGray tagging can be found inside the jersey. 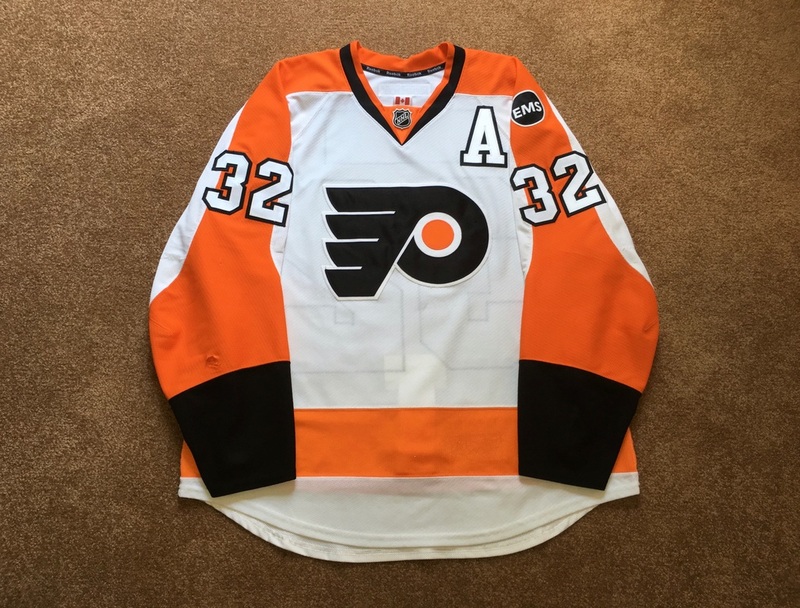 Kimmo Timonen 2010-2011 Road Jersey w/ "A"
​ This white set two jersey was worn on the road by Timonen from 12/28/10 to 4/5/2011. 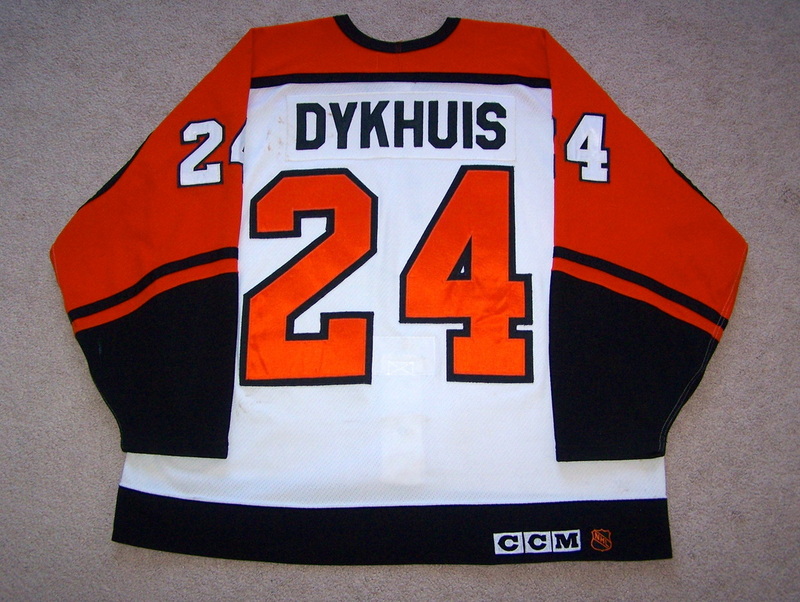 The jersey was worn for 24 games and shows substancial wear. 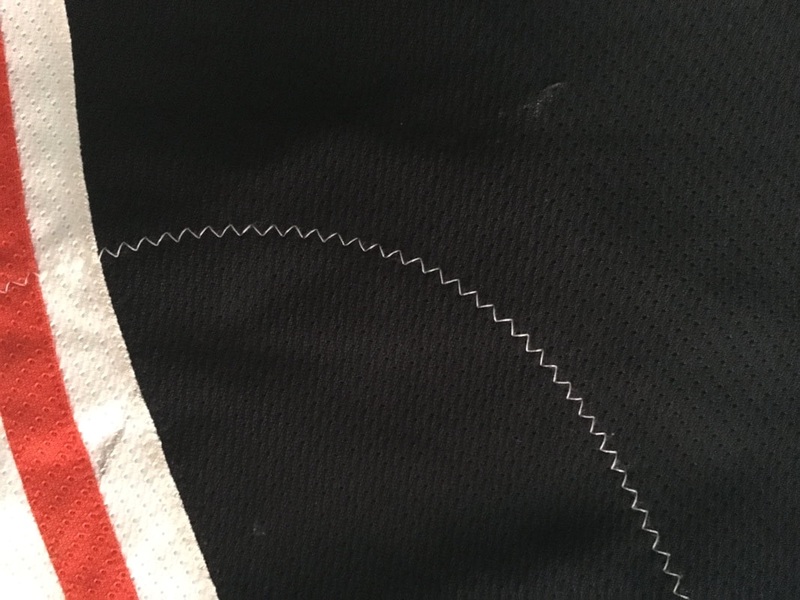 There is a stick mark through the crest and on the rear of the jersey. Both elbows have unrepaired holes and a couple of board burns. 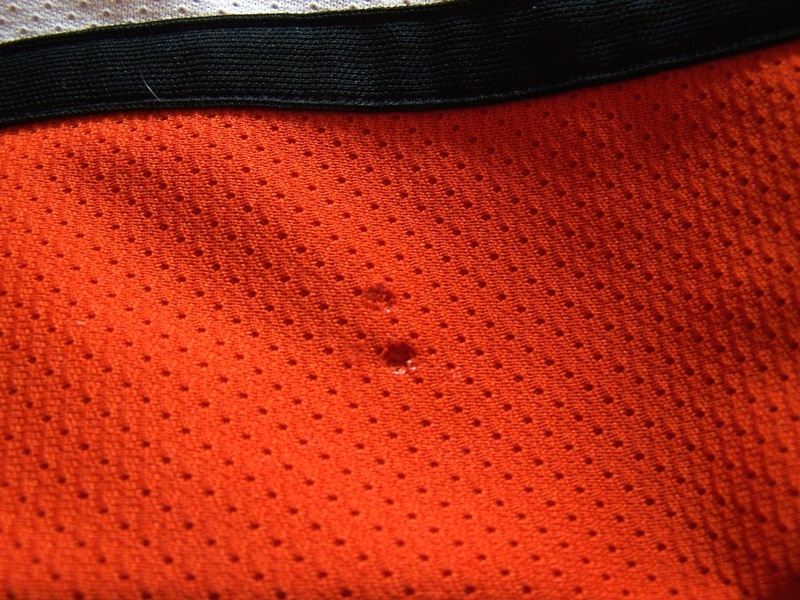 Front of the jersey has several marks from either pucks or stick tape. 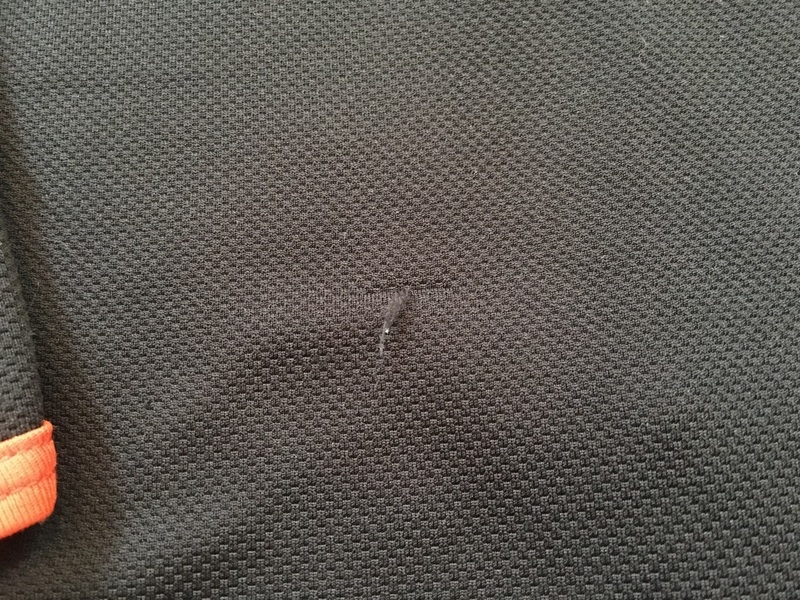 Nice puck mark through left sleeve #44 and the hemming has been riped out of the right cuff. The crest show severe puckering as does the rear numbers and nameplate from a good amount of washings. 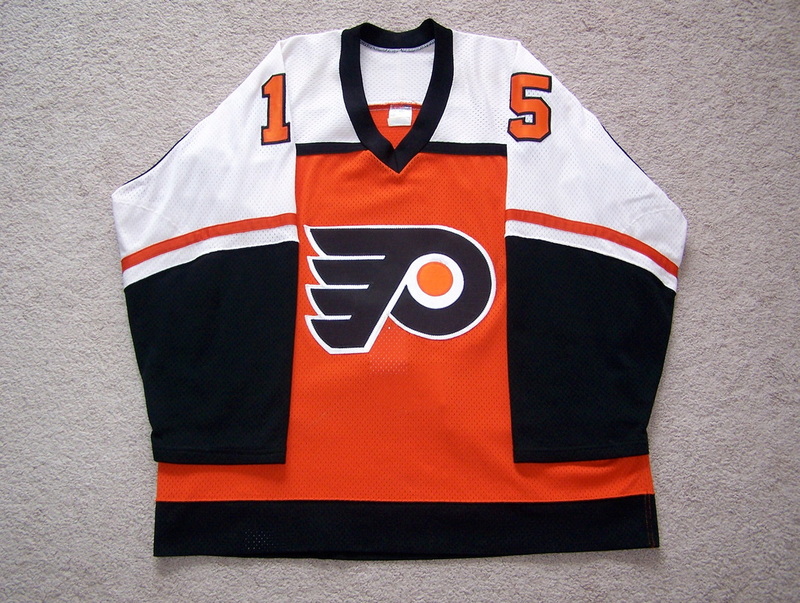 The Flyers went 15 and 9 while wearing this set. 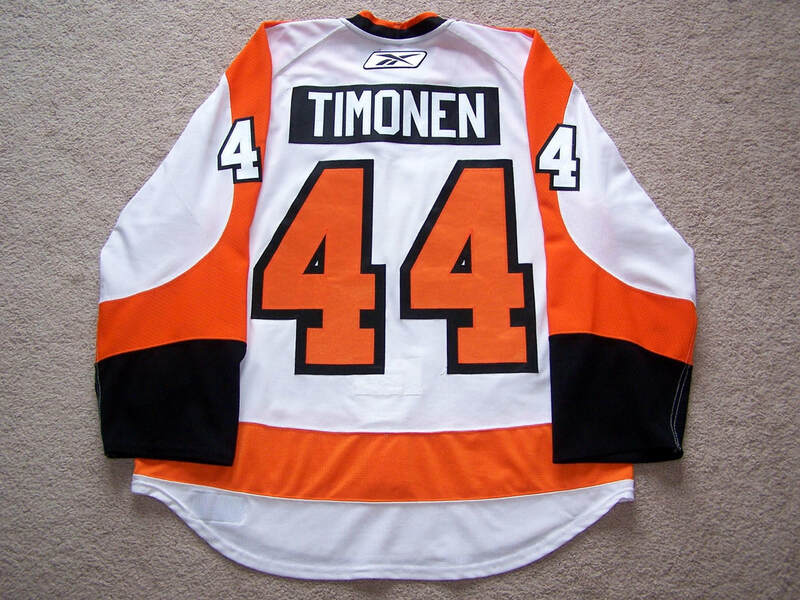 Timonen was +8 with 2 goals (one of which was the shootout winner on 2/15/11 vs TB) and 9 assists for 11 points while wearing this shirt. 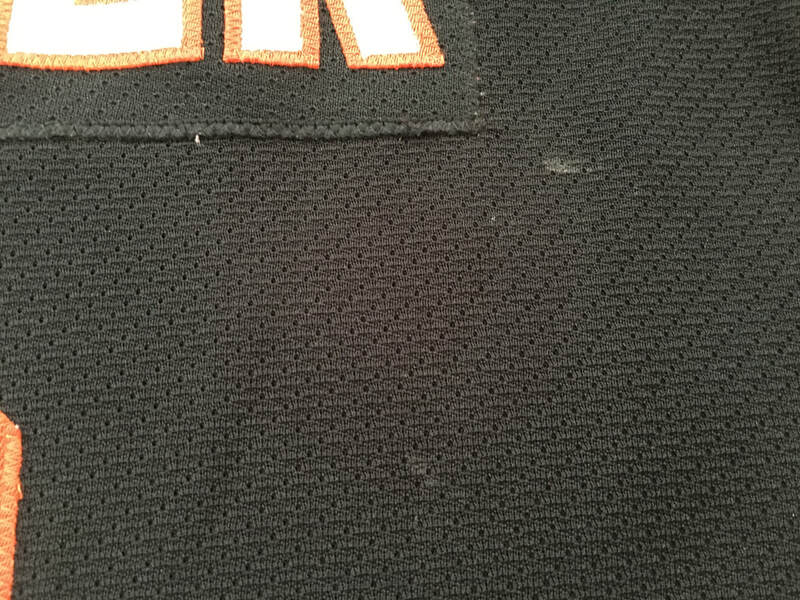 Photomatched to the stick / puck marks on crest. 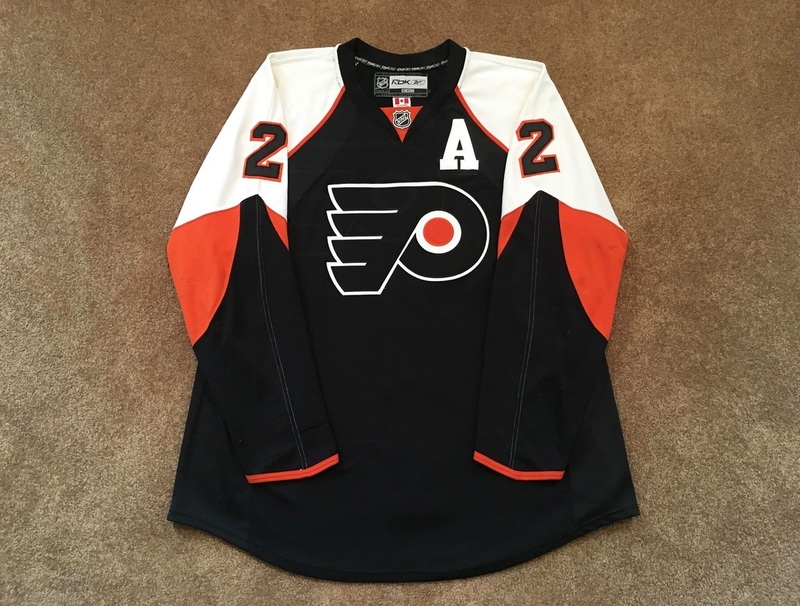 Kimmo Timonen 2011-2012 Home Jersey w/ "A"
This set two gamer was worn by Kimmo at home from 1/17/12 - 4/5/12 which was a span of 20 games. He scored his 500th NHL point on 3/1/12 vs. the NY Islanders while wearing this shirt. 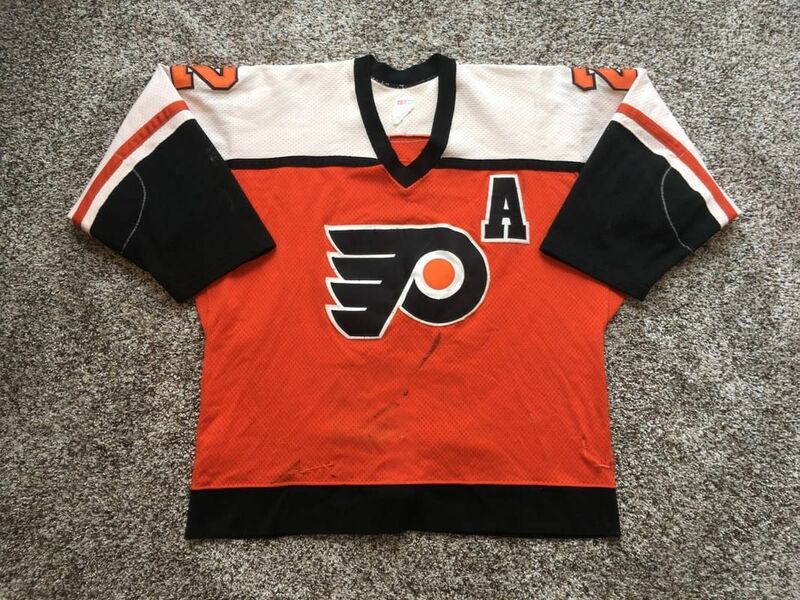 The wear is decent with puck marks on each elbow, red board paint on the right sleeve, slash mark under the crest, inner pilling, and puckering to the crest and rear numbers from numerous washings. He would notch 3 goals and add 9 assists for 12 points in this jersey. 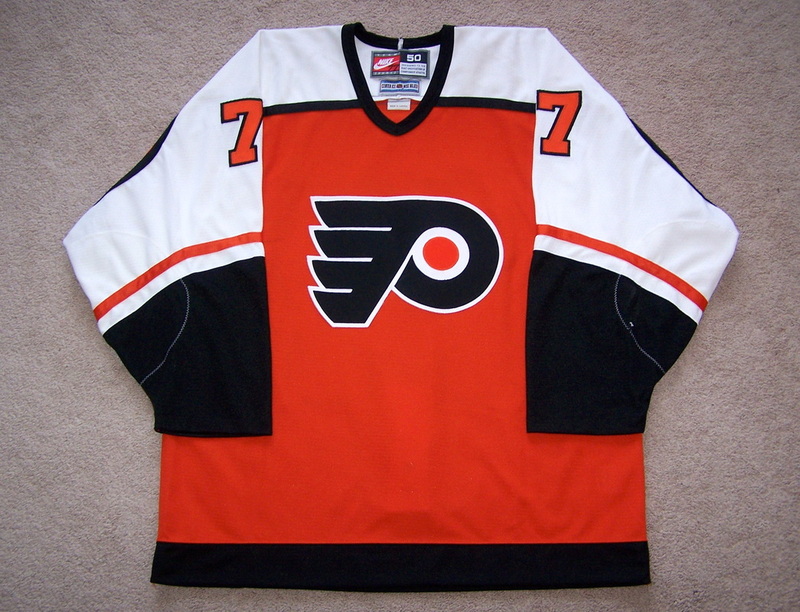 As a team, the Flyers went 10 - 6 - 4 while wearing this set. 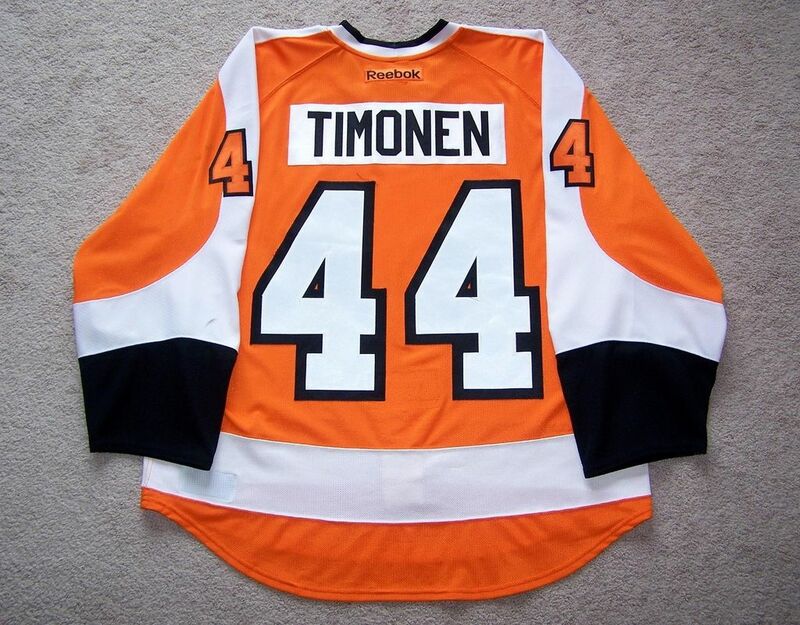 Kimmo Timonen 2013-2014 Home Jersey w/ "A"
This orange set 1 jersey was worn by Timonen at home during the start of the 13-14 campaign. He would score one goal and add two assists for three points in 15 games while wearing this jersey. 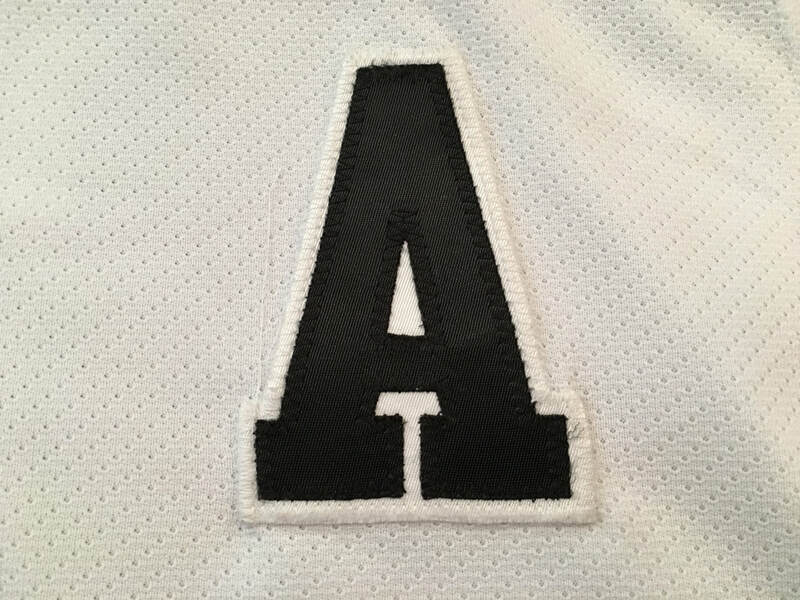 The front shows twelve light black markings, puckering to the crest, and Alternate Captains "A" sewn to the upper left chest. 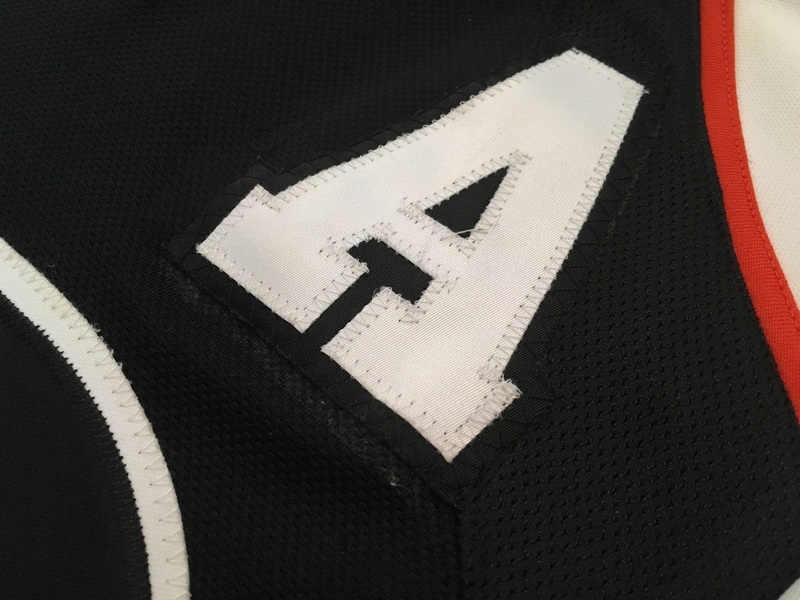 The right arm features nine black markings, 2" blue mark above the sleeve numbers, and shortened and tightened cuff. The left arm has 7 black markings, a small 1/4" un-repaired hole on the forearm area, a 1" un-repaired hole in the elbow area, and shortened and tightened cuff. 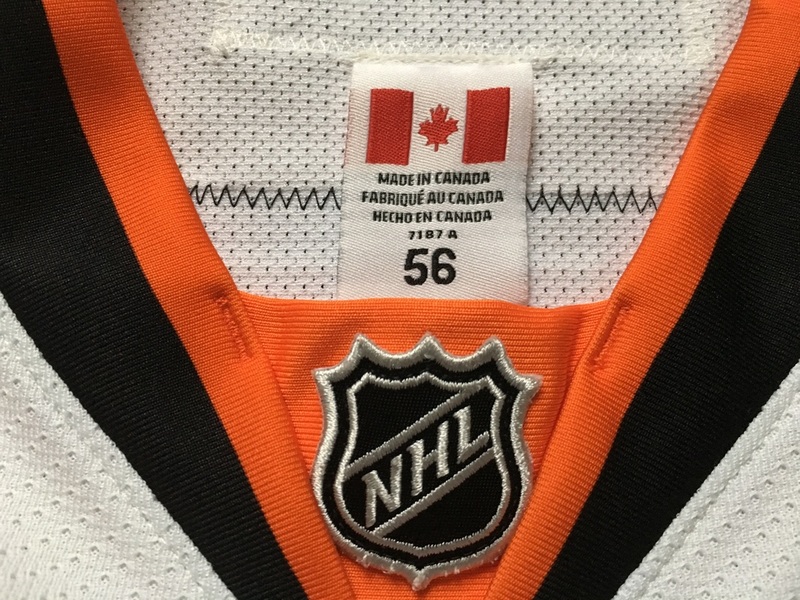 The rear shows even wear with some puckering to the rear numbers, and four black markings along the white portion of the jersey. The inside has a size 56 tag in the neck area, intact fight strap, and pilling in the left elbow and rear tail portion under the fight strap. 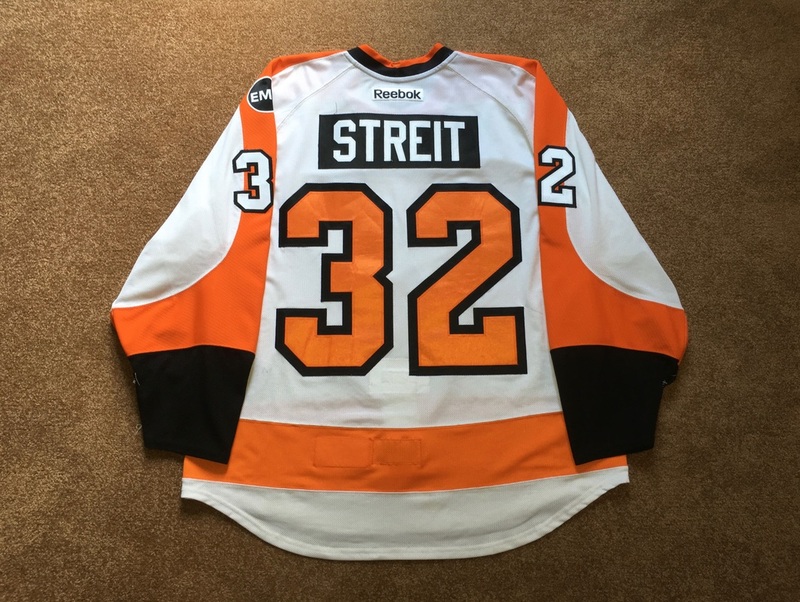 Mark Streit 2015-2016 Road Jersey w/ "A"
​ This white set 3 jersey was worn by Streit from 3/11/16 through the 2016 playoff series vs. the Capitals. 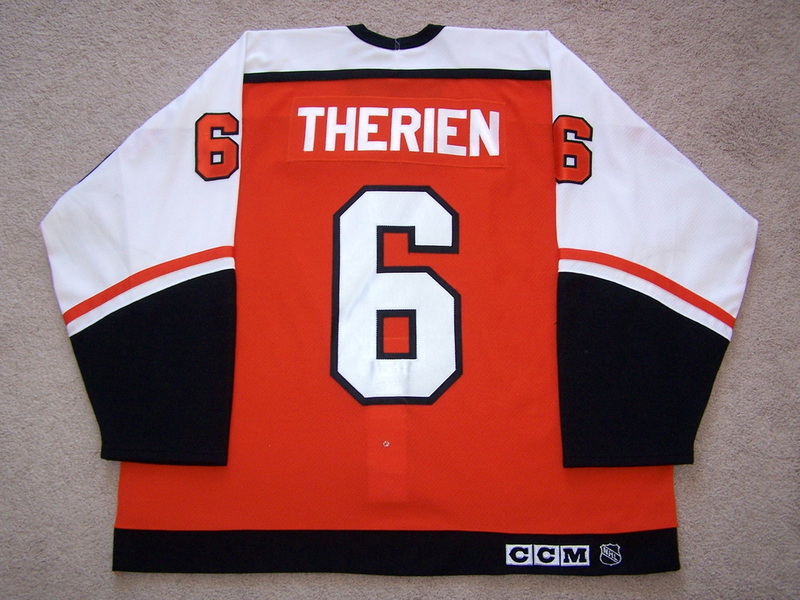 It was worn for eleven games during that stretch and Streit would earn two assists while wearing this jersey. 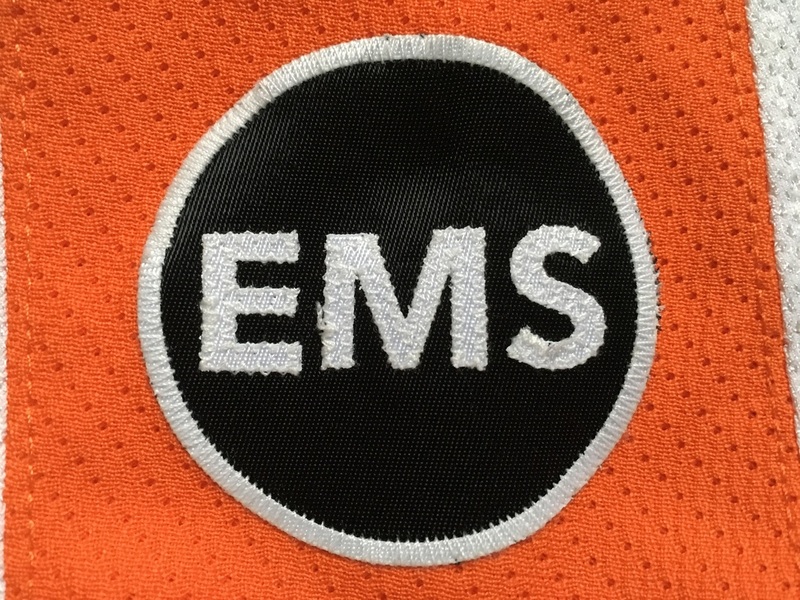 The Flyers honored legendary owner Ed Snider by affixing a "EMS" patch to the left upper arm of their home and away jerseys during the playoffs. 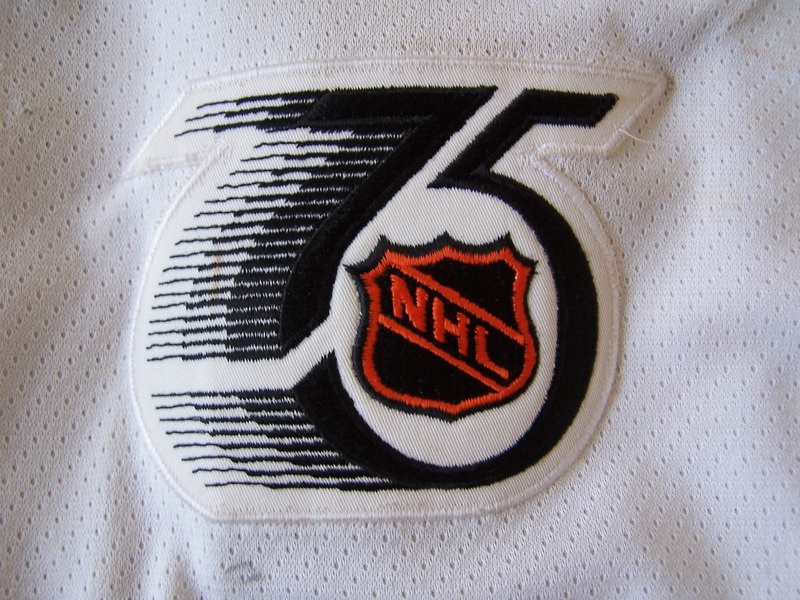 The front of this jersey exhibits the Alternate Captains "A" on the upper left chest, light crest puckering, and a small black marking under the crest. 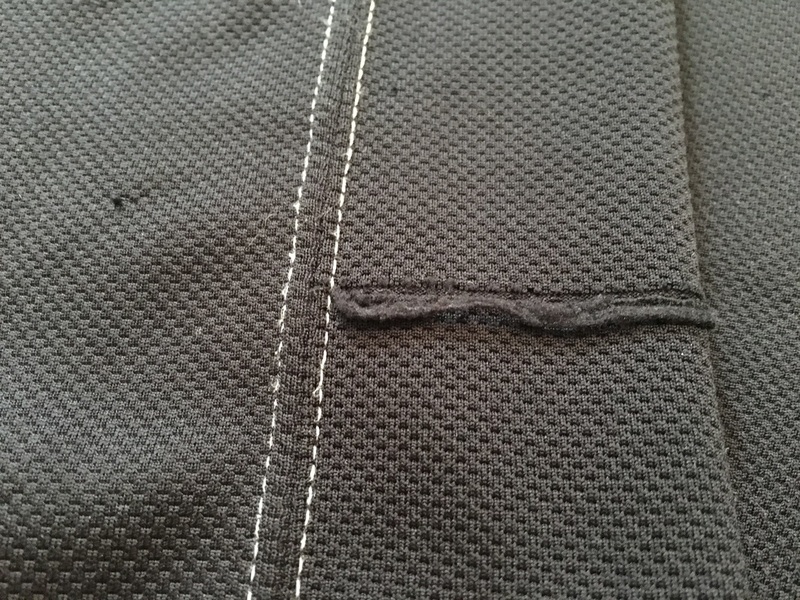 The right arm has a custom tightened cuff, one small black marking, a 1/4" board burn under sleeve #3, and a 1" un-repaired hole just above the black cuff area. 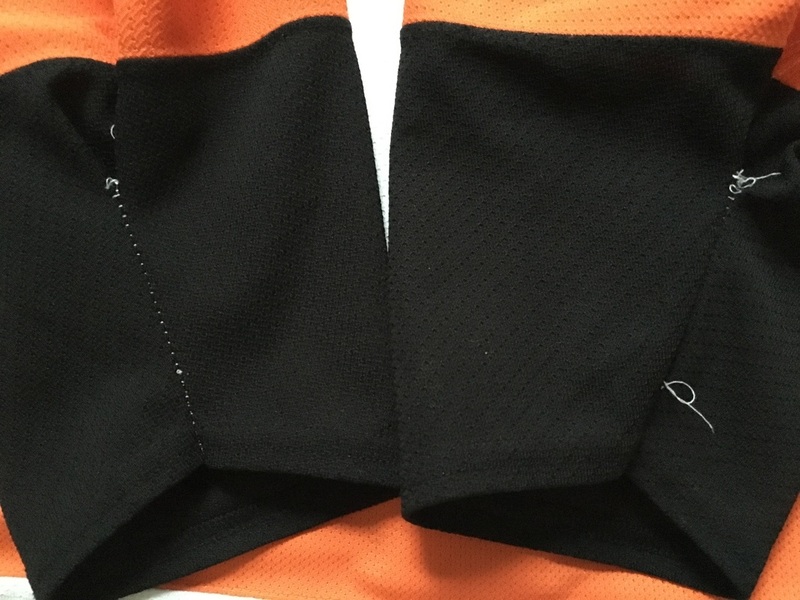 The left arm exhibits the "EMS" Ed Snider memorial patch, 3/4" black marking next to the sleeve #2, 1/2" board burn in the elbow area, and an un-repaired 1//4" hole under the arm, and a custom tightened cuff. 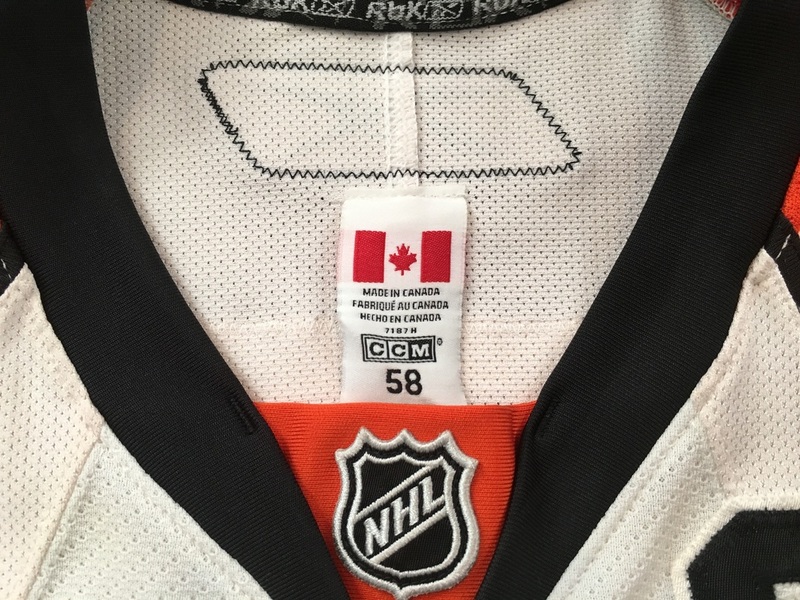 The rear of the jersey shows puckering to the nameplate and rear numbers. 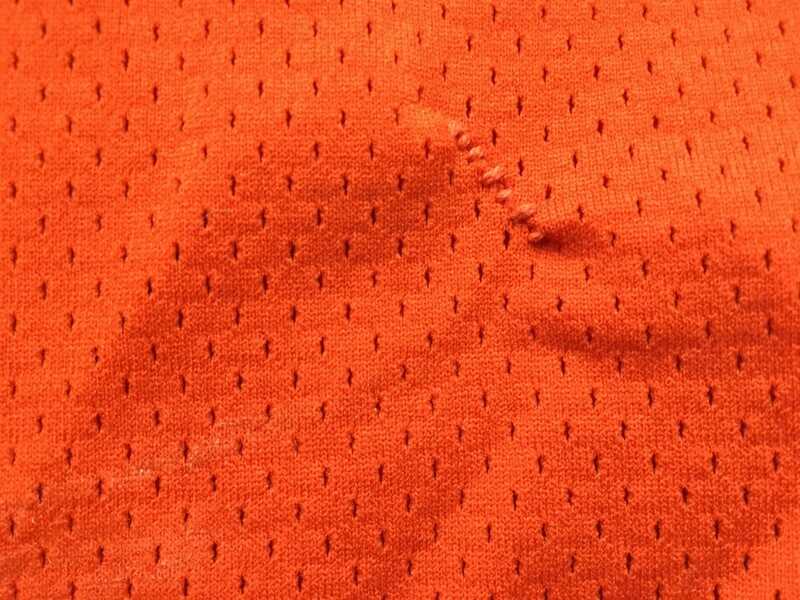 The inside of the jersey features numerous areas of pilling on the arm, back, and front areas proving this jersey saw plenty of ice time. Derian Hatcher 2005-2006 Home Jersey w/ "C"
This jersey was worn by Derian Hatcher at home during the middle part of the 05-06 season. He was named interim captain for the duration of Keith Primeau's absence on January 29, 2006. 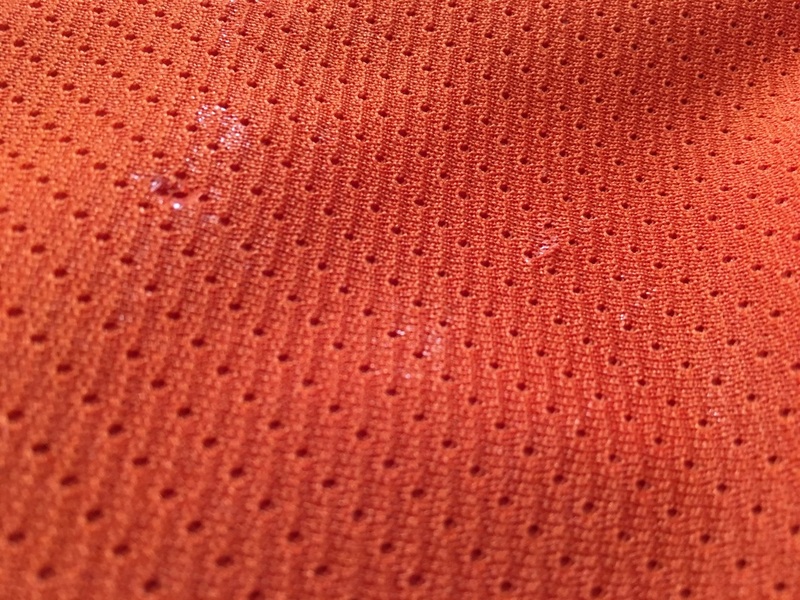 The jersey features lighter wear with the front showing a few marks on the crest and sweat staining in the neck area. 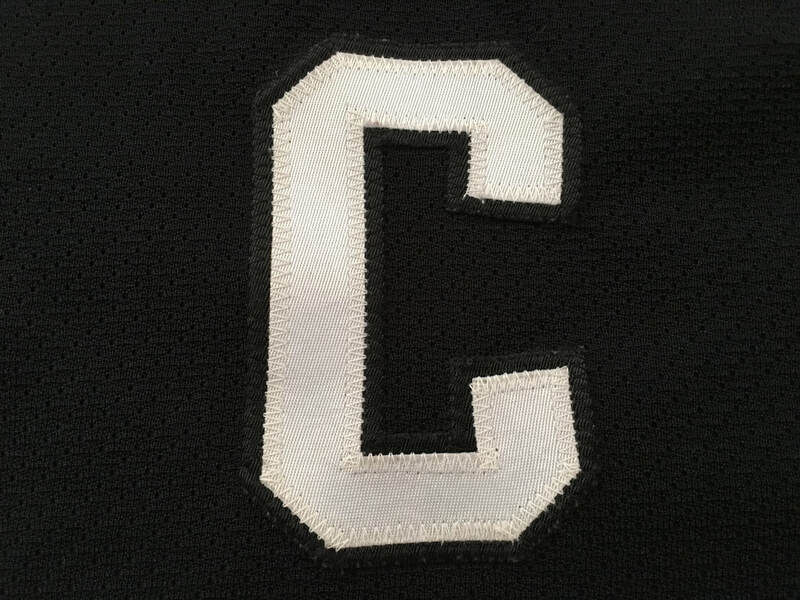 The white on black twill captains "C" is sewn on the upper left chest area. The right arm shows two board burns in the cuff area, sleeve extensions, and brownish stains throughout. The left sleeve has a light board burn in the cuff area, sleeve extensions, and more staining. 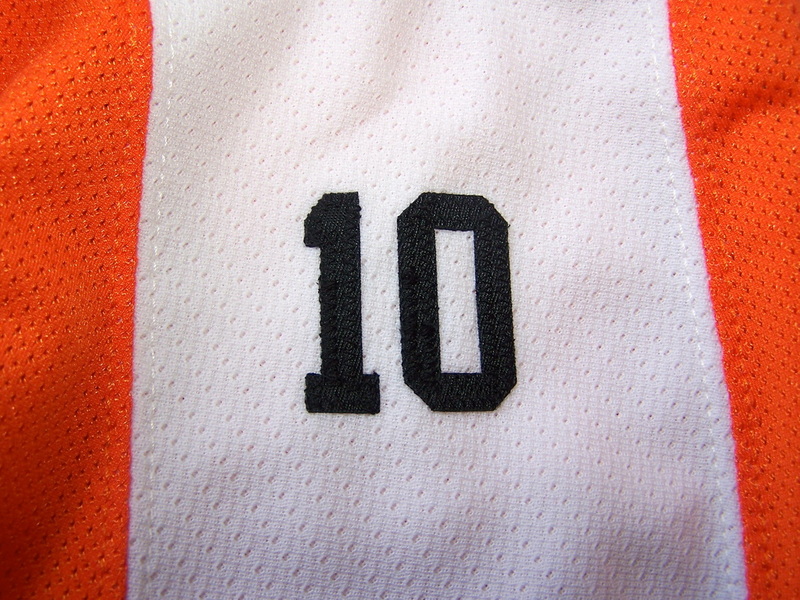 The rear of the jersey has two white markings. 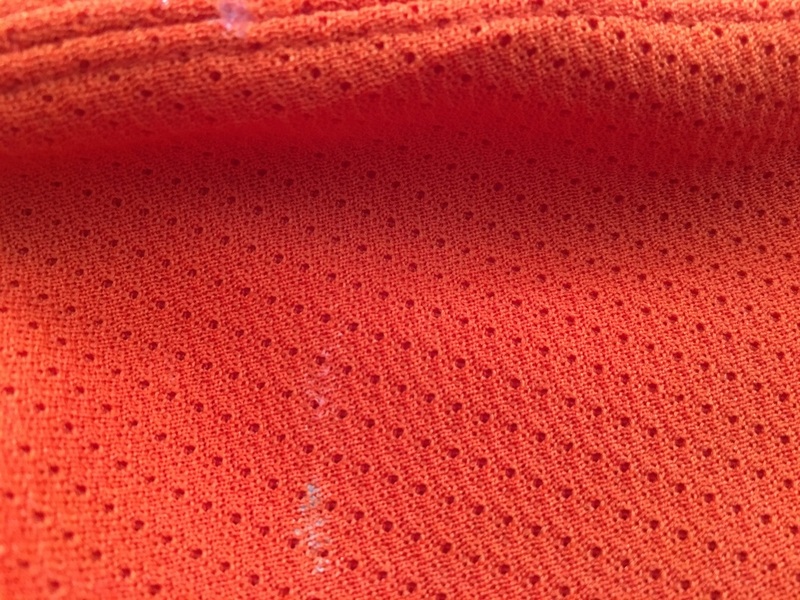 Inside a size 58 tag resides in the neck area and MeiGray tagging is on the inside rear hem. 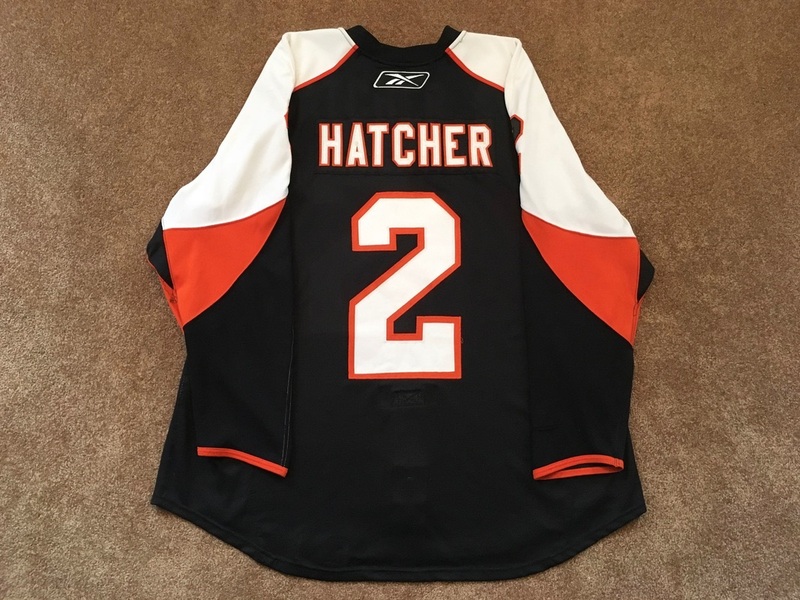 Derian Hatcher 2006-2007 Road Jersey w/ "A"
This jersey was worn by the former Flyers captain during the middle part of the 06-07 season. 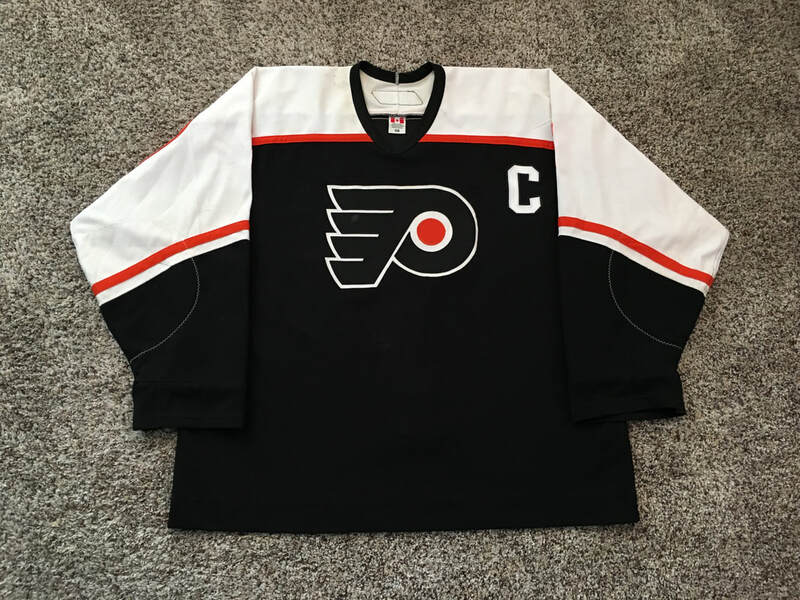 The jersey has decent wear with the front showing five black markings, fabric pulls, and loose threads to the alternate captains "A" that has been sewn on the upper left chest area. 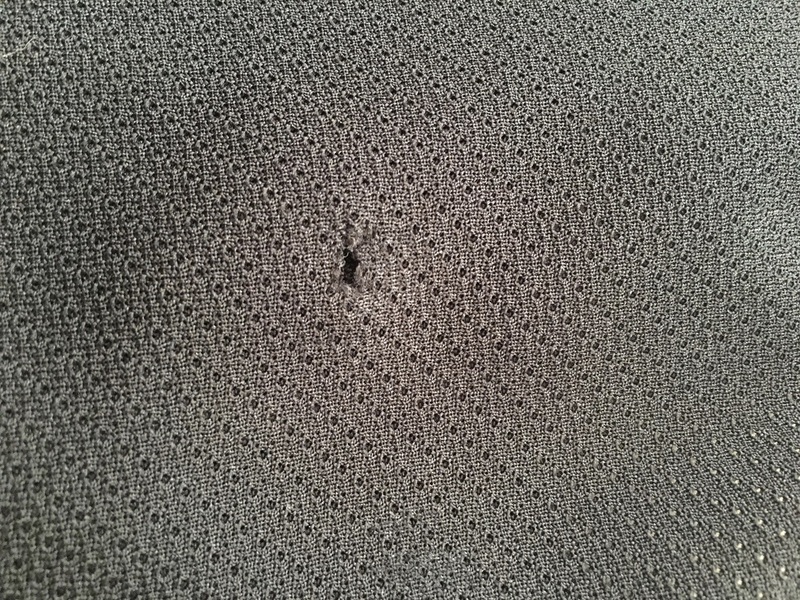 The right arm has three un-repaired holes, six board burns, an addition board burn in the shoulder area, and two black markings. The left arm exhibits three more un-repaired holes and eight board burns throughout. 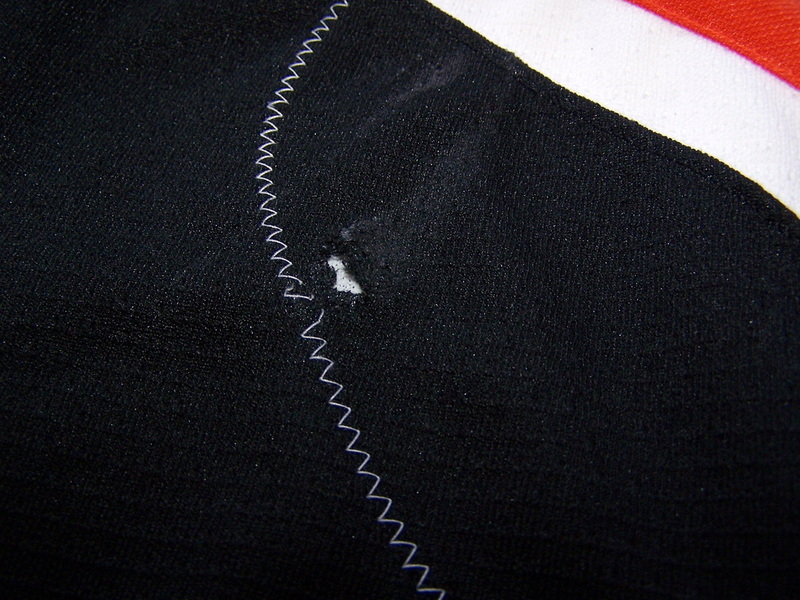 The rear shows five black markings and a loose thread to the rear #2. 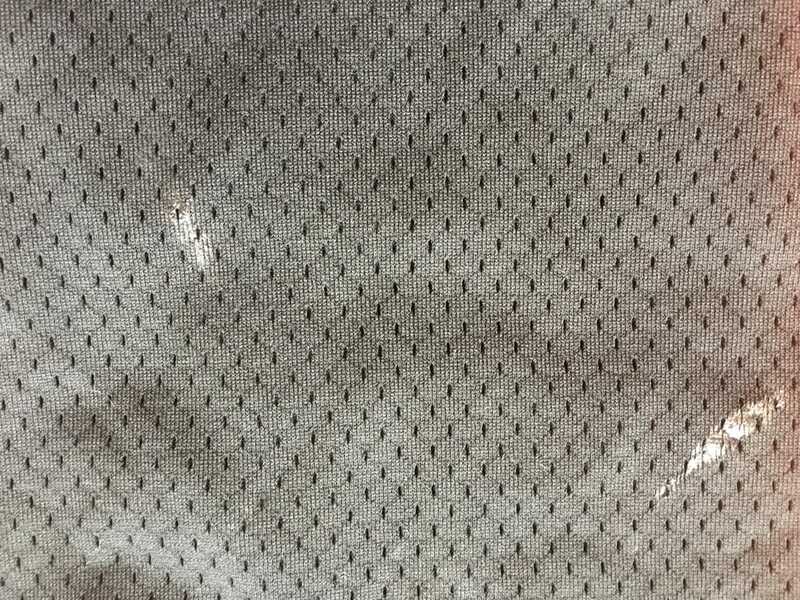 Inside a size 58 tag resides in the neck area and there is light fabric pilling on the chest and arm areas. 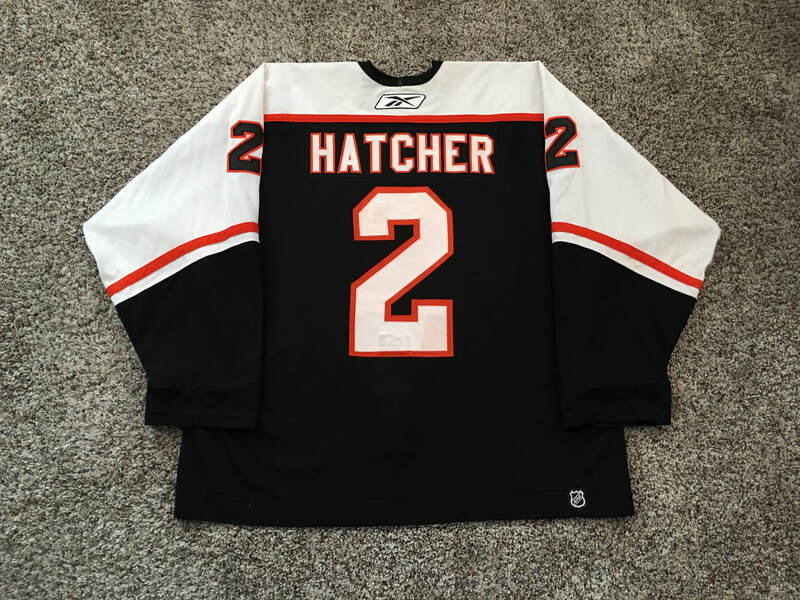 Derian Hatcher 2007-2008 Home Jersey w/ "A"
This black home set 3 jersey was worn by Hatcher for two games during the regular season and five playoff games as the Flyers took a run for the Stanley Cup. 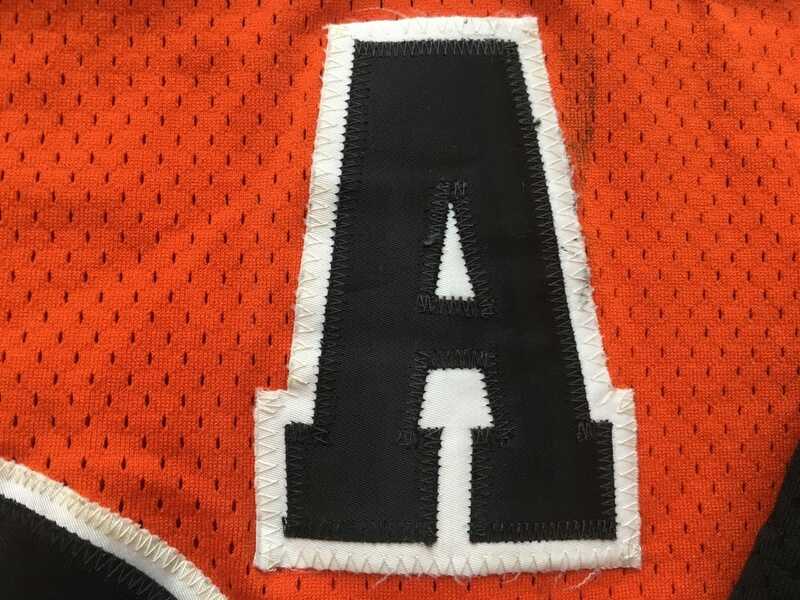 It has nice wear with the front showing fabric pulls and a hand sewn "A". The neck has popped threads from fight abuse. 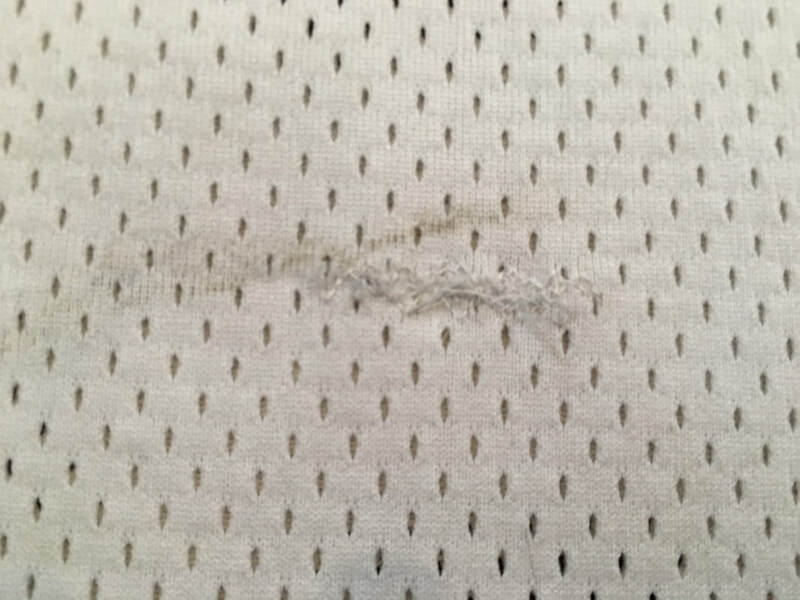 The right sleeve has a few board burns in the elbow area, numerous marks and un-repaired holes on the forearm and cuff areas, and some loose threads to the sleeve #2. The left sleeve exhibits a 2" black stick mark, board burns in the elbow area, cuts, pulls, and board burns on the forearm and cuff areas. 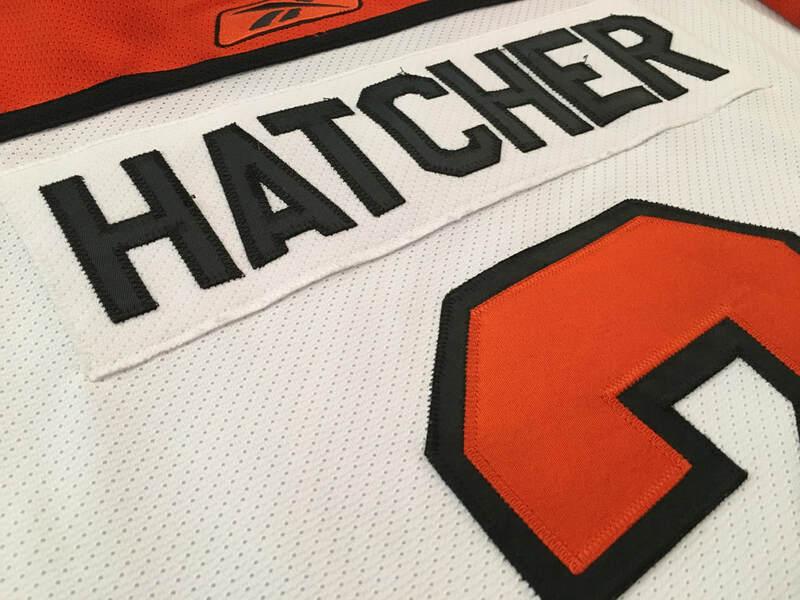 The rear of the jersey shows even wear with "Hatcher" sewn on a matching stretch mesh material. 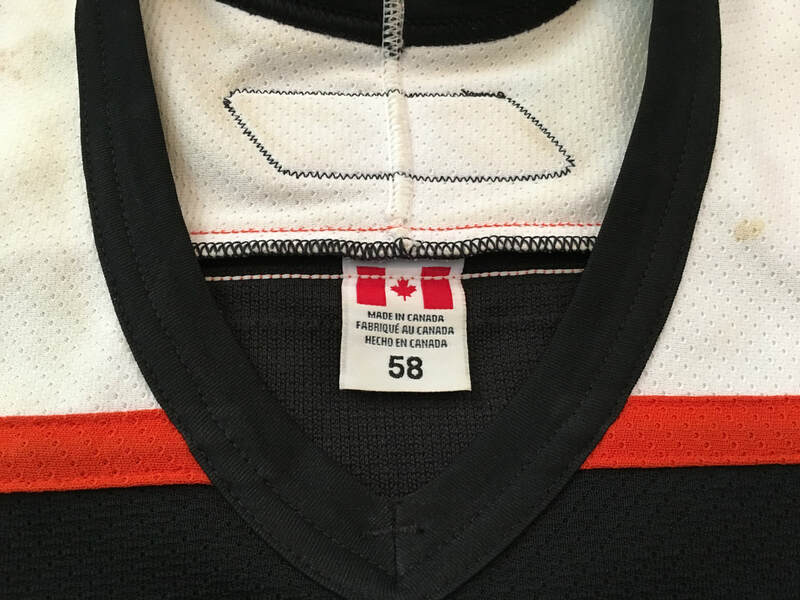 The inside of the jersey has a Reebok neck tagging present (out of the norm), size 58+ tag, and MeiGray inventory tagging. 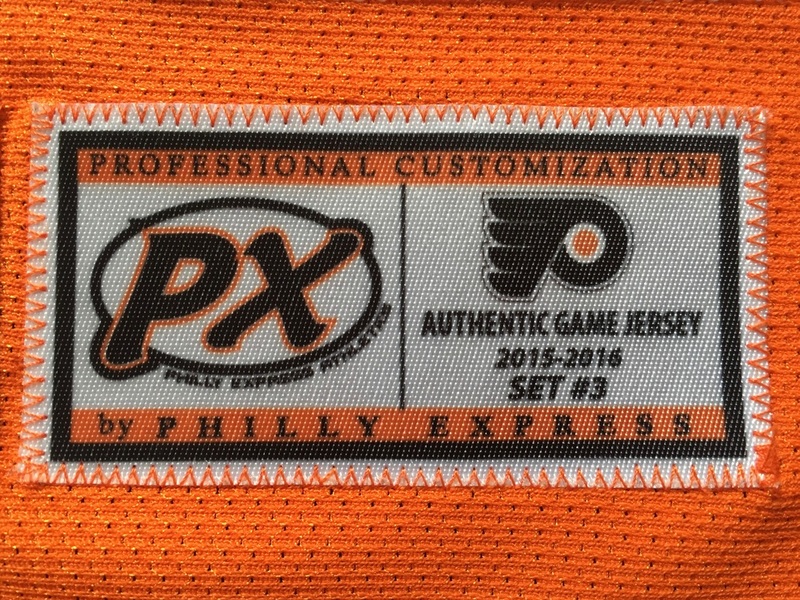 The jersey has inner pilling and the fight strap has discolored from washings. 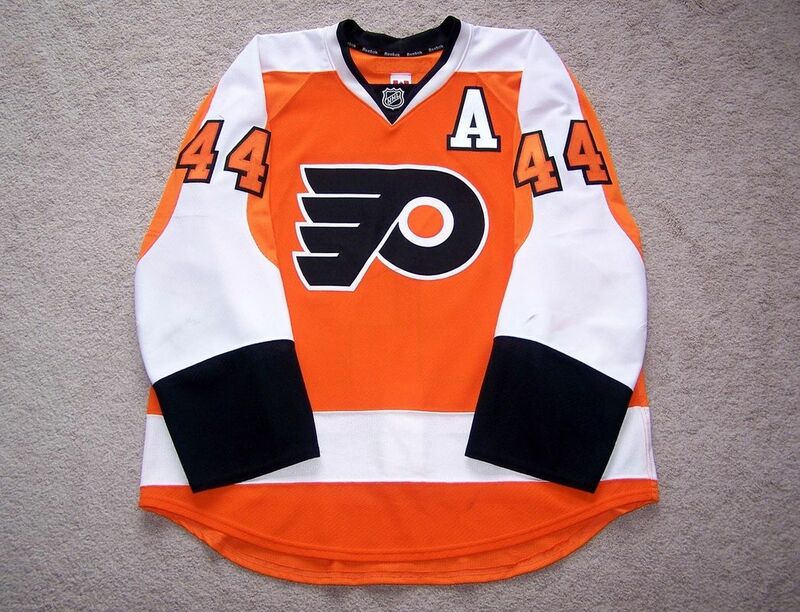 A great jersey from a memorable and unexpected Flyers Cup run in 07-08. 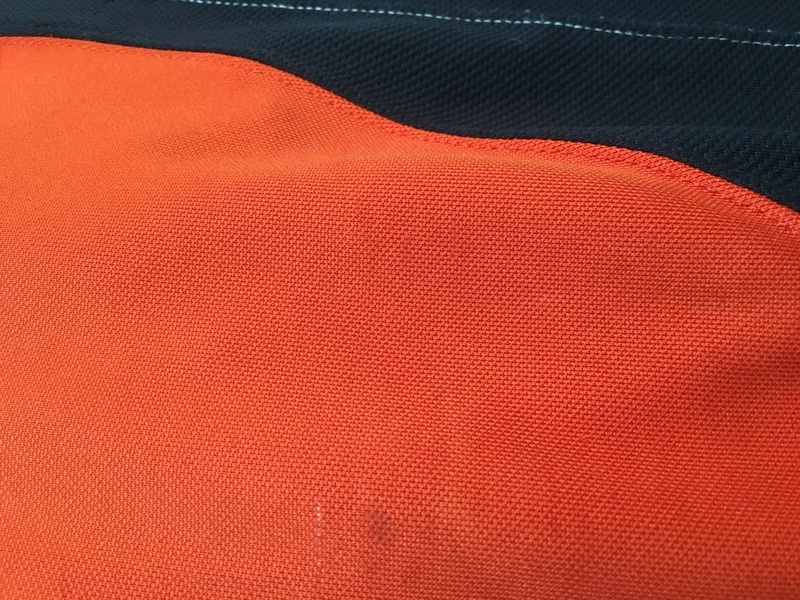 Fight strap sewn through rear number 5 with a few stick/puck marks on the sleeves and front of the jersey. 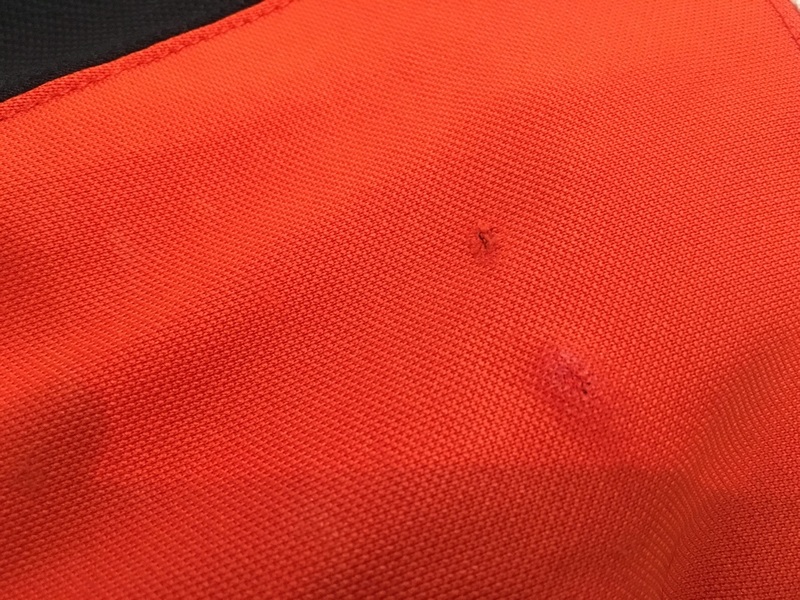 Inside has light pilling and sweat stains on each shoulder. J.J. undoubtedly recorded one of the most famous Flyers goals of all time in Game 6 vs. Edmonton at the Spectrum during the 1987 Stanley Cup Finals. The game winning goal would force a Game 7 back in Edmonton. 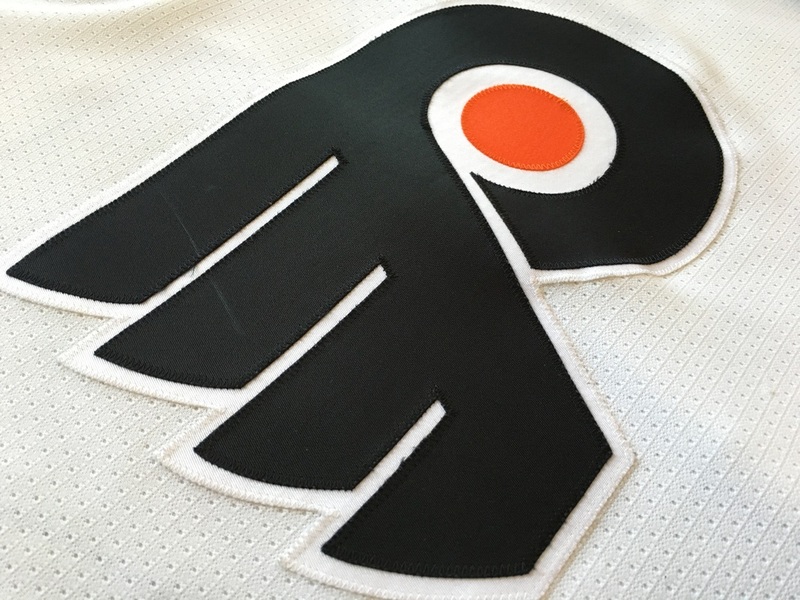 It was reportedly one of the loudest moments ever at the Spectrum and voted the 8th greatest moment in Philadelphia Flyers history, according to fan voting. 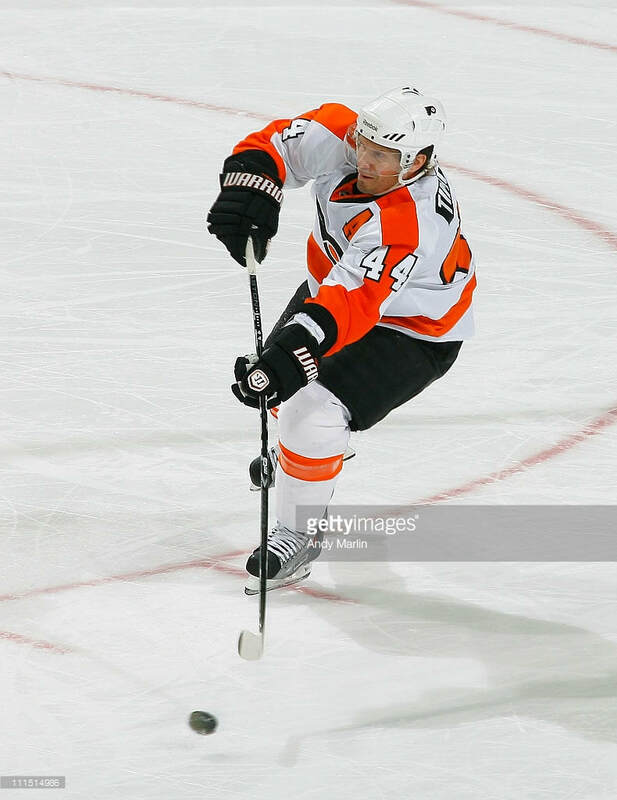 J.J. played 77 games that year scoring 6 goals and adding 16 assists for 22 points. 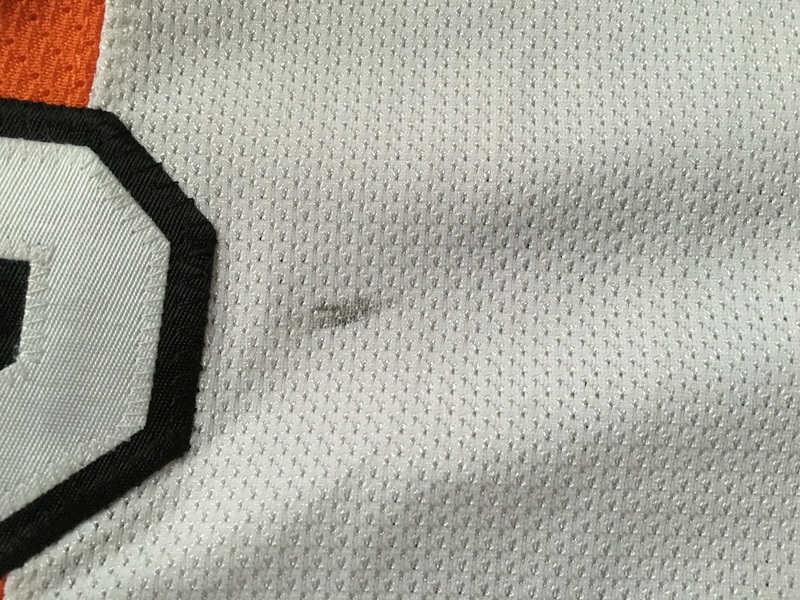 Jersey shows nice wear with fabric pulls, stick and puck marks, and a nice slash mark through the crest. 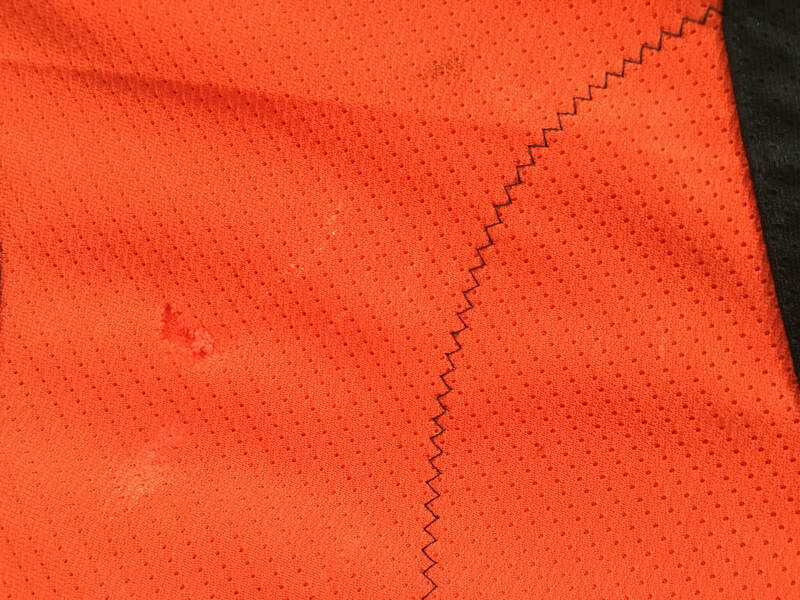 Neck stitching is also ripped in the front. Fight strap still in tact. 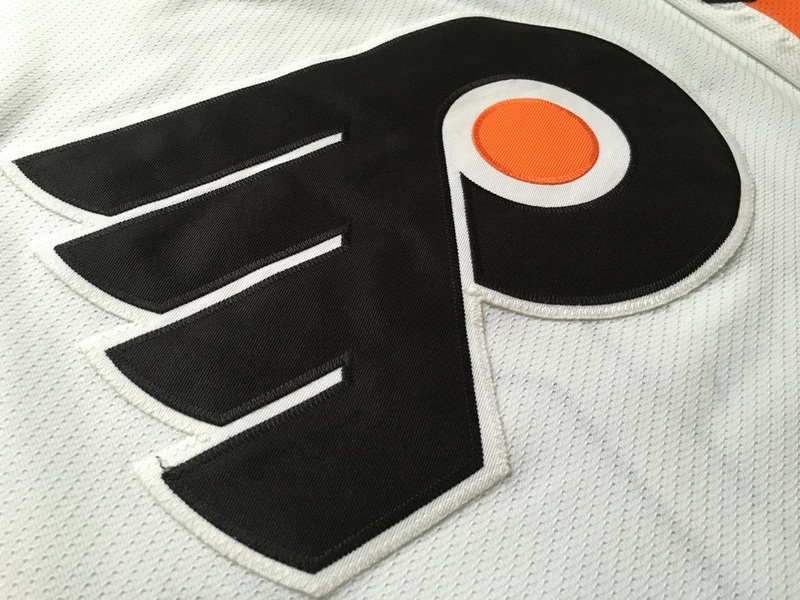 This jersey was worn for one game on 2/11/2012 vs. the New York Rangers and features very light wear with only some fabric pulls on the rear tail of the jersey in the fight strap area. 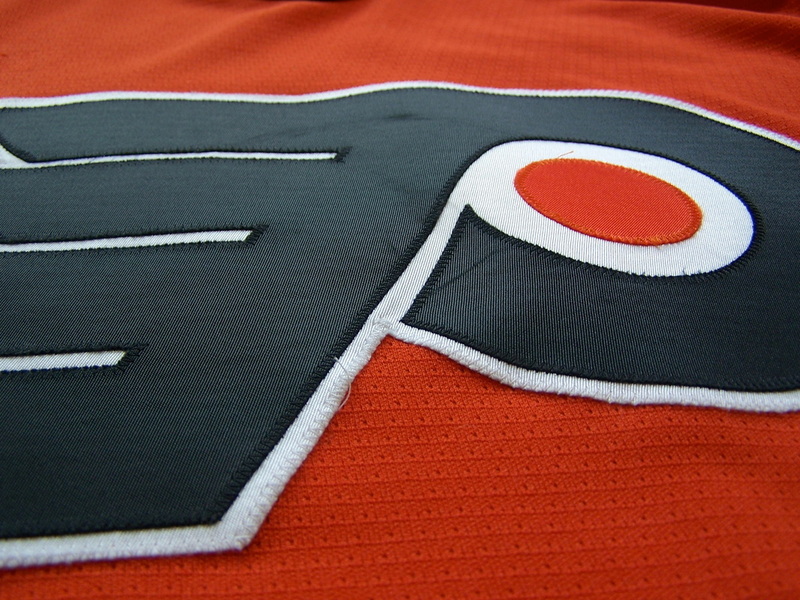 The Flyers would go on to lose that Saturday afternoon 5-2. 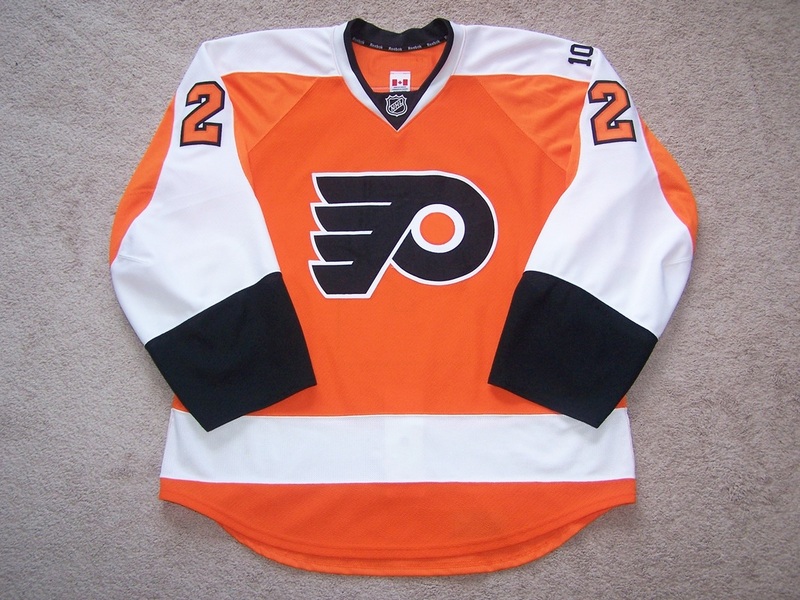 Meszaros logged 20:04 ice time, earned 2 PIM, and assisted on Wayne Simmonds' 1st period goal while wearing this jersey. 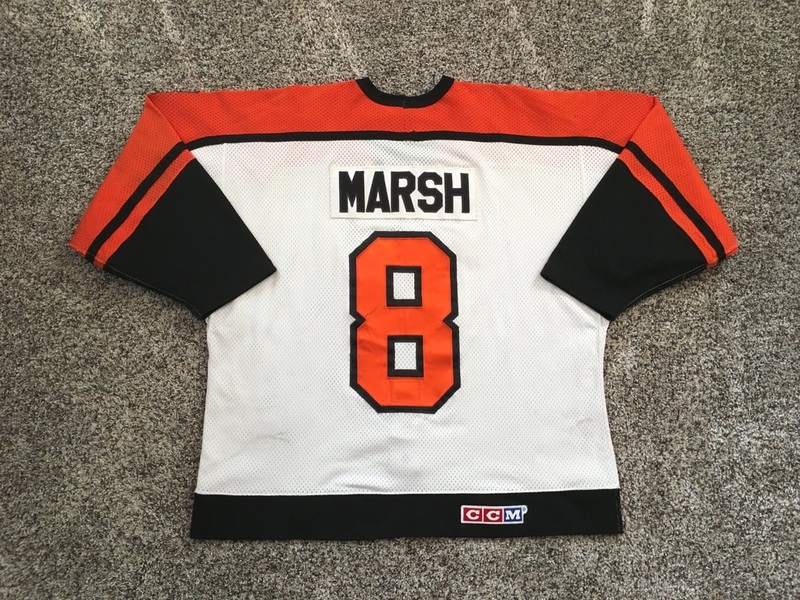 This jersey was worn by Brad Marsh during the 1983-84 season. 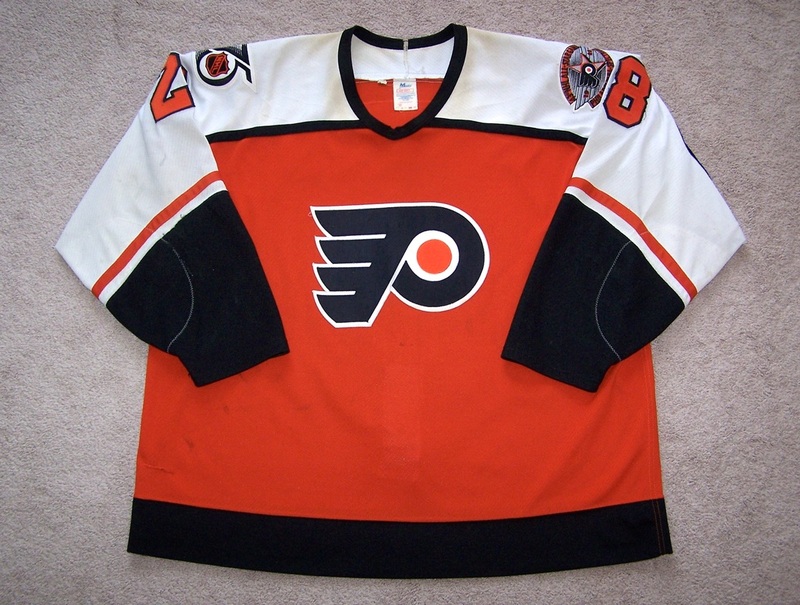 It features good wear with the front showing black markings on the body/crest and two team repairs of the lower left side. The right arm shows light wear with a board burns near the elbow area and a couple of black marks. 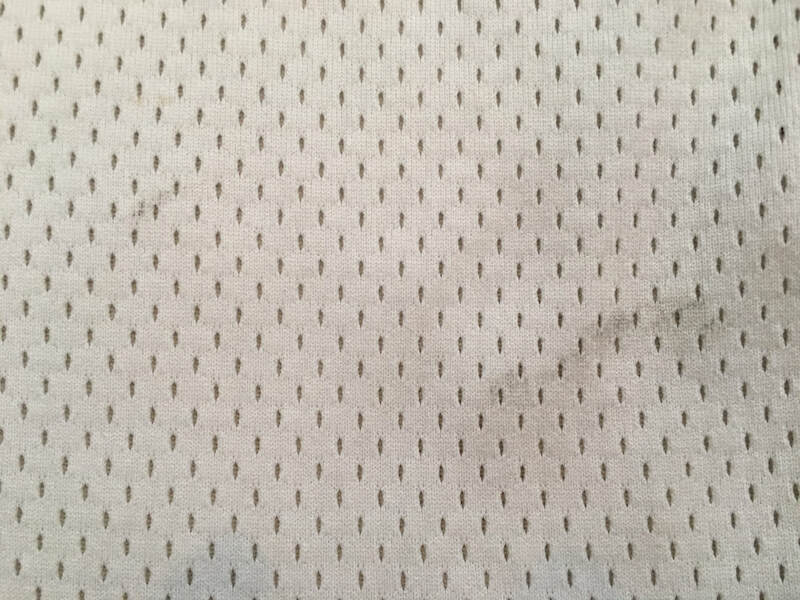 The left arm has similar markings with a black mark on the sleeve number 8. 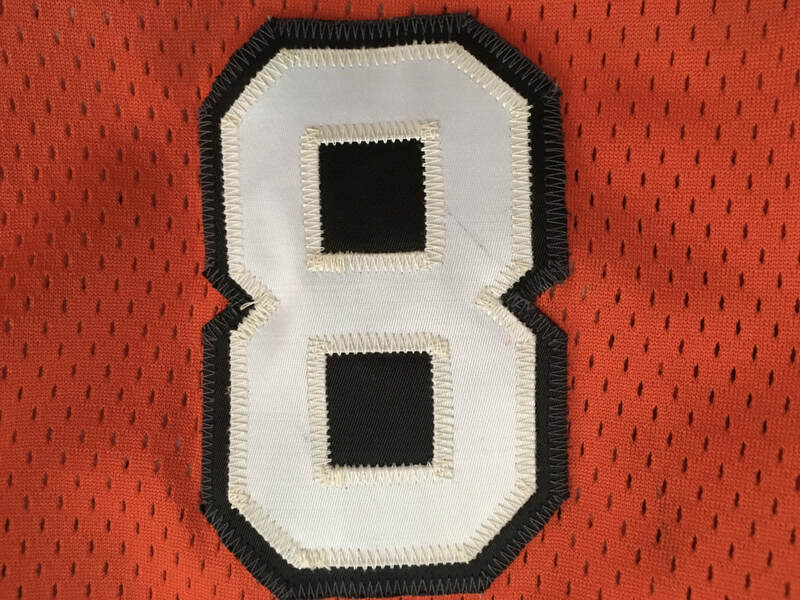 The rear of the jersey shows even wear with "Marsh" sewn in black twill to a matching mesh nameplate, another nice team repair on the lower right side and some black slash marks to the rear number 8. 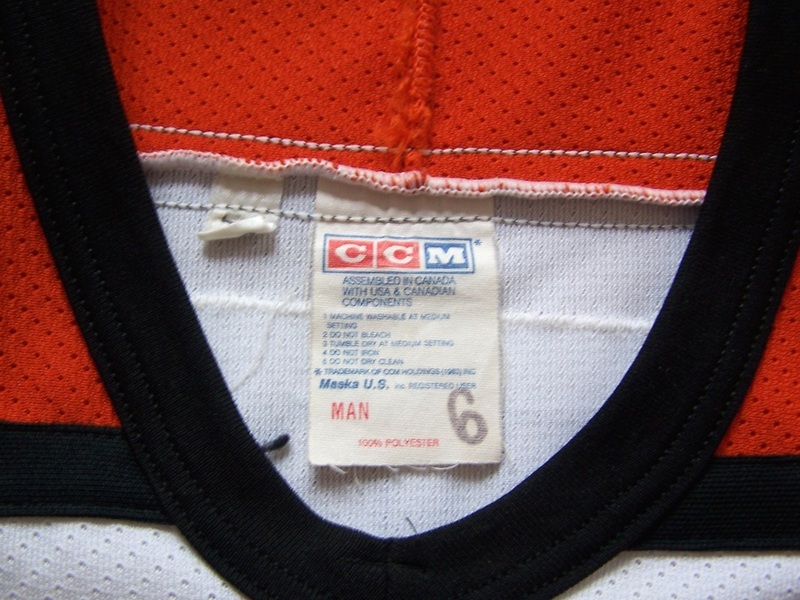 The inside of the jersey shows evidence of a large neck seam repair from fight abuse and the original fight strap sewn directly through the rear number 8. 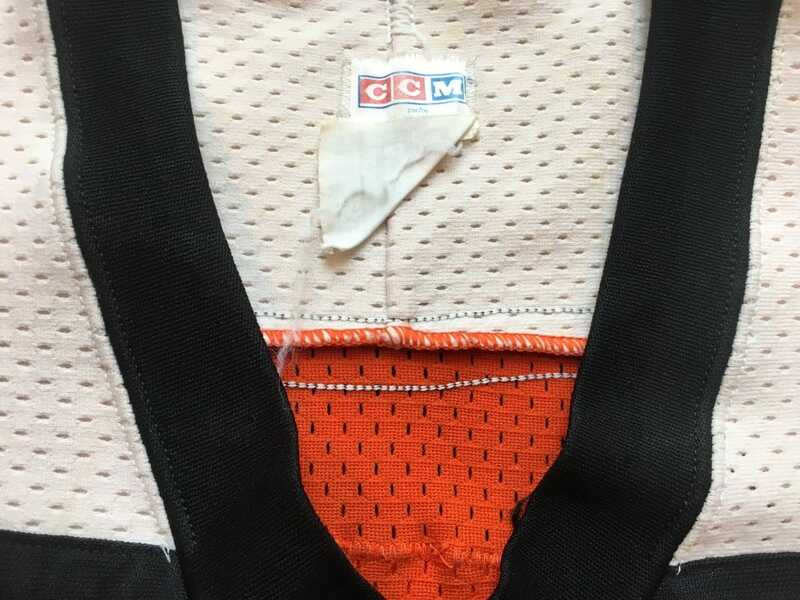 An awesome first year CCM mesh gamer from one of Philly's favorite alumni. 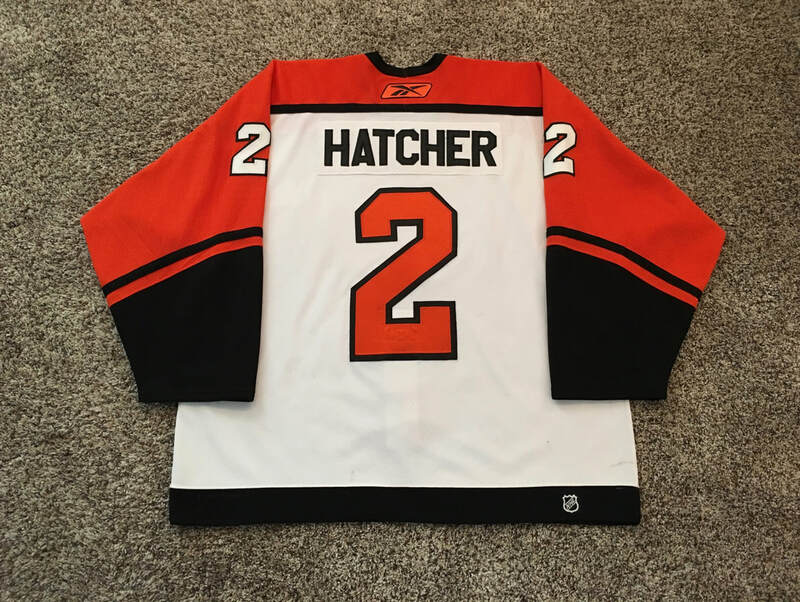 Regular season game worn jersey. LOA from Spivak and Kraut. 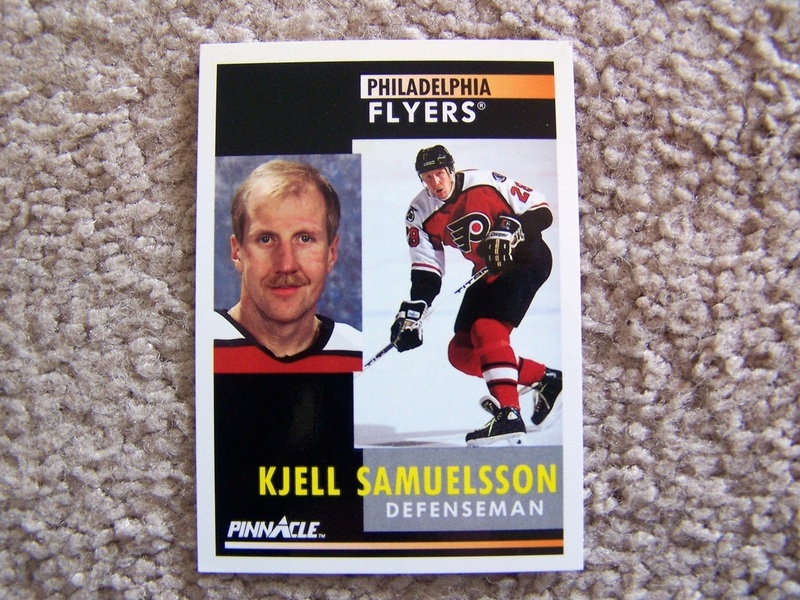 1988-89 Kjell Samuelsson home gamer. LOA from Spivak and Kraut. 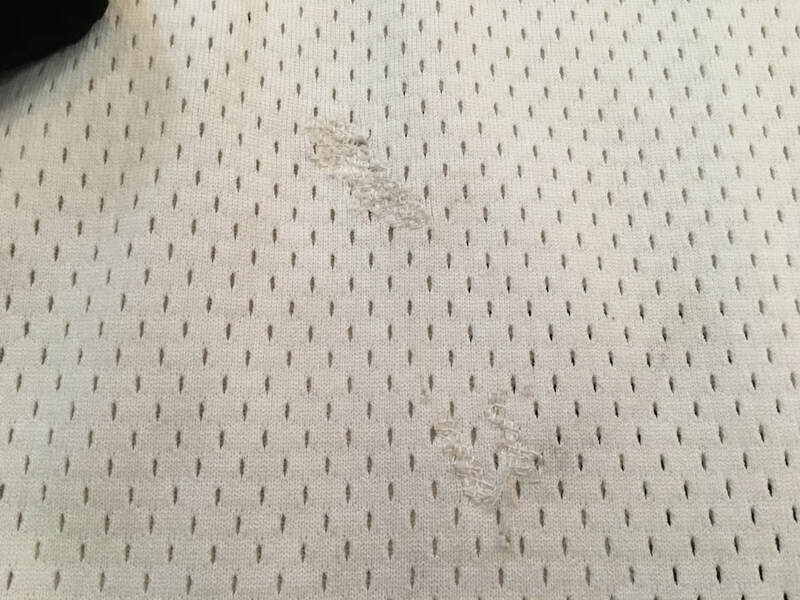 Very nice wear with sick marks, unrepaired holes, and board burns on the elbows. The inside has pilling under the arms, elbows, and upper back. The numbers and crest are puckered quite a bit. 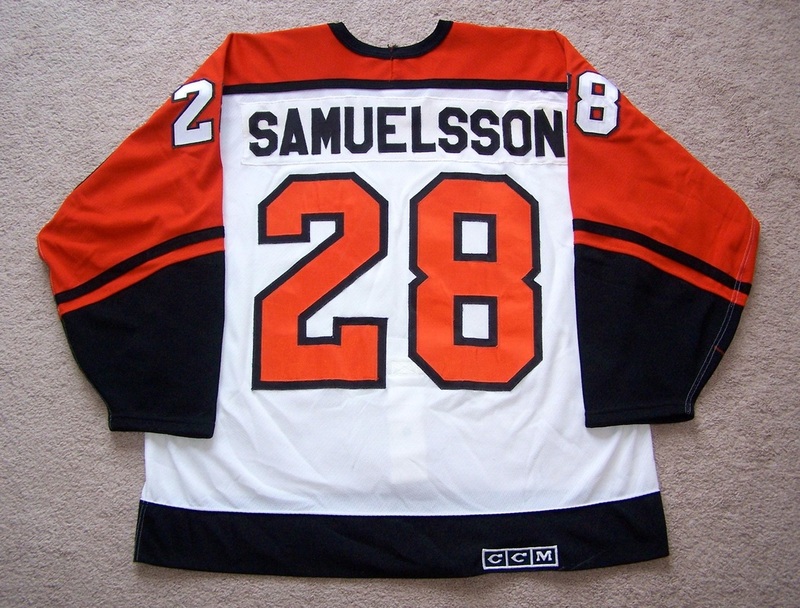 The nameplate and white parts of the jersey are slightly yellowed due to age. 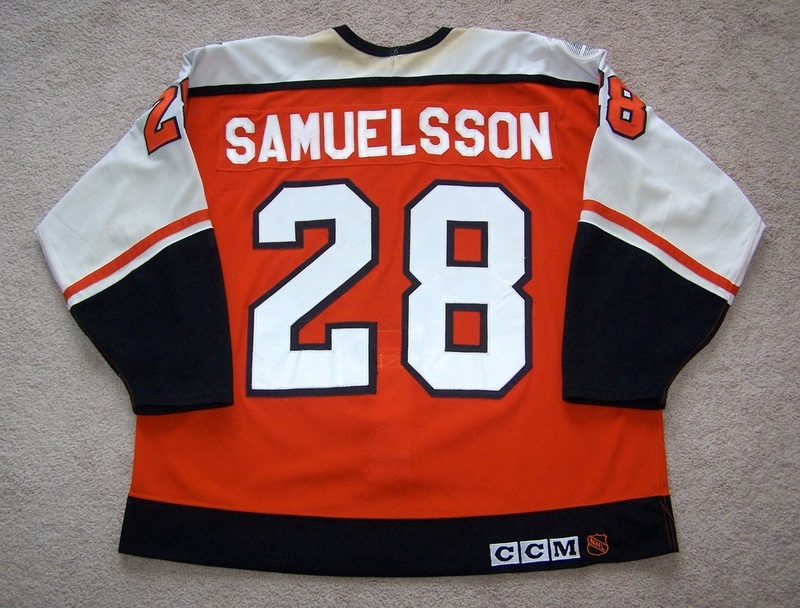 This jersey was worn by Kjell Samuellsson on the road for the first half of the 1991-92 season. 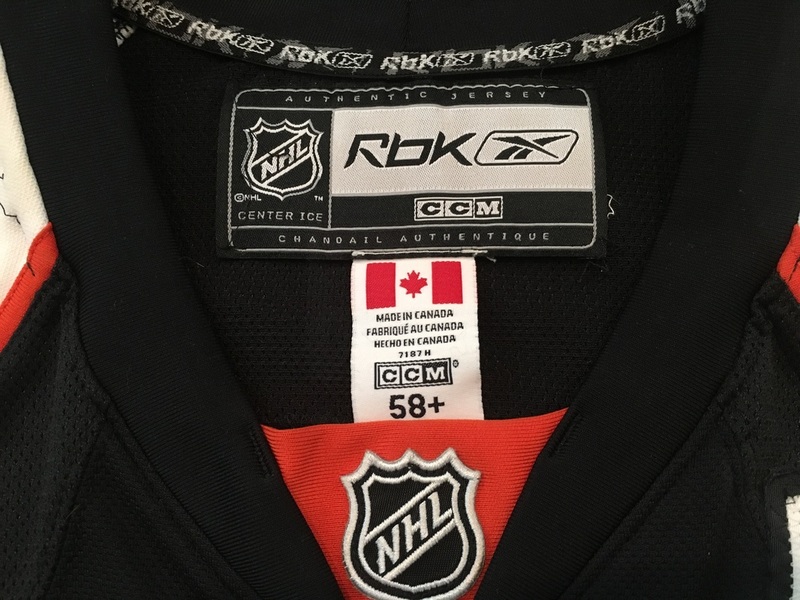 It features the much sought after 43rd All Star Game patch which was worn on the road set up until the all star game making these jerseys a tough find in todays collectors market. 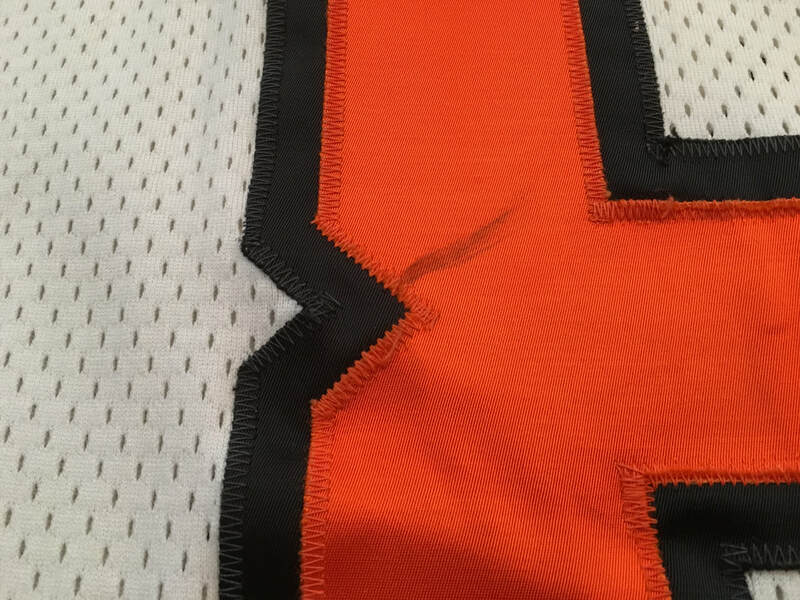 The wear is moderate with the front of the jersey showing approximately 10 black markings, two slash marks on the crest, and a 1 and 3/4" loop style repair on the lower right side. 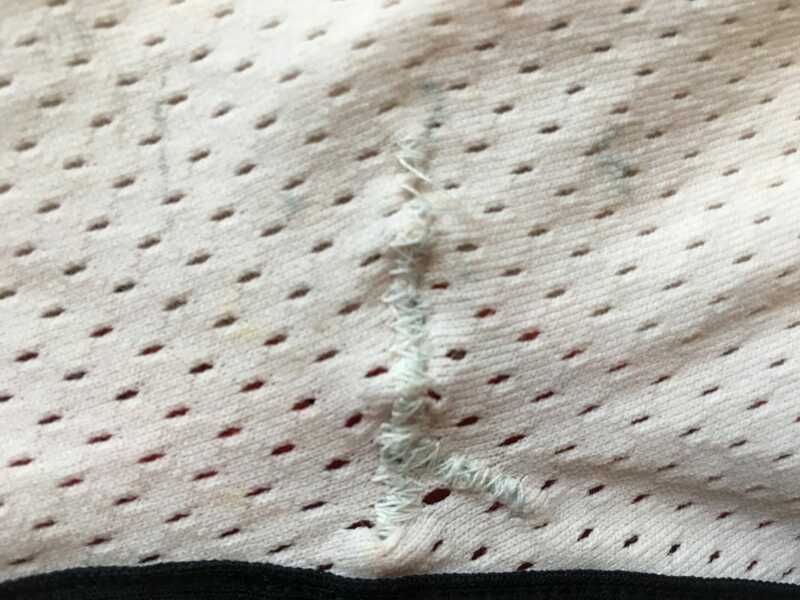 The right arm features numerous black markings, loose threads on the arm #8, a 1" repair near the elbow area, two un-repaired holes, and six board burn marks in the cuff and elbow areas. The left arm has numerous markings throughout, some loose threads on the #8, a board burn on the #2, three un-repaired holes in the cuff and elbow area, and four small board burns. 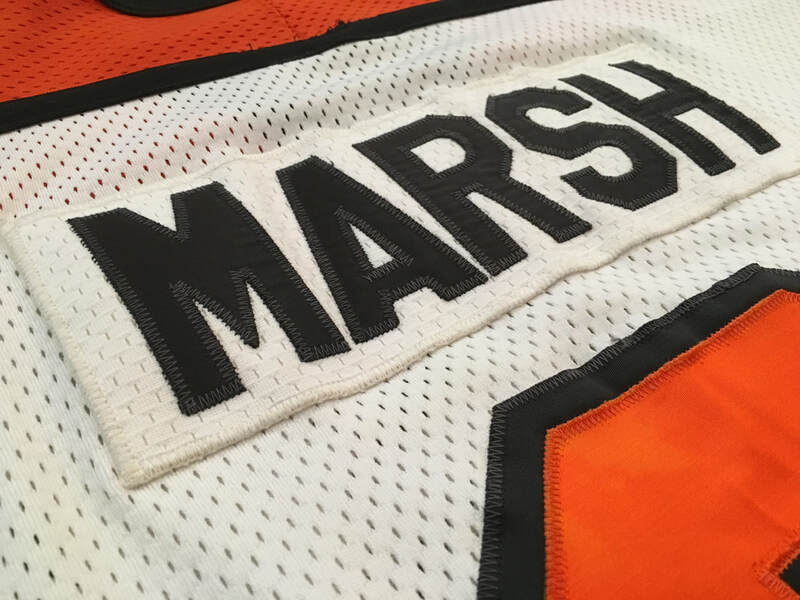 The rear of the jersey shows even wear with yellowing of the letters on the nameplate, a 4" slash mark through the nameplate, a 1" slash on the rear #2, and a few black markings on the lower left side. 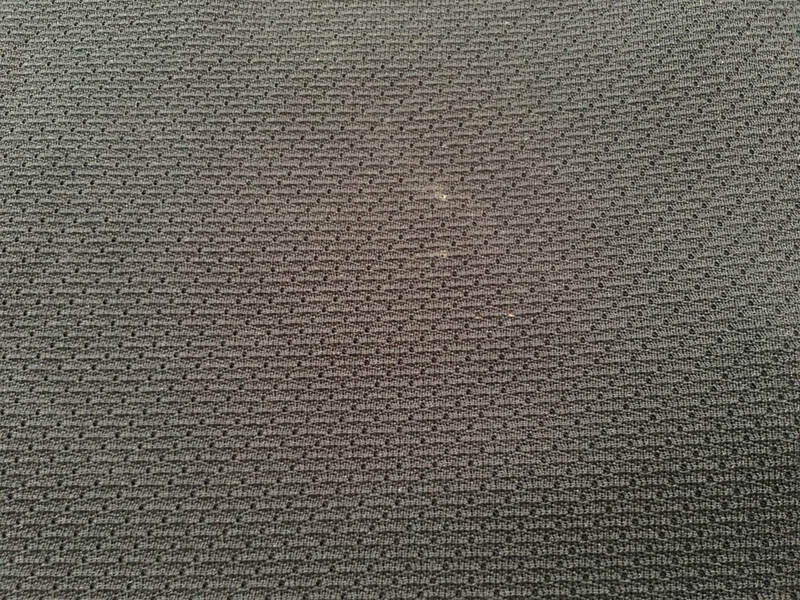 There is a lot of sweat staining around the collar and good salting in the fight strap. The fight strap has also been signed by Kjell with 91/92 added designating the season this jersey was worn. 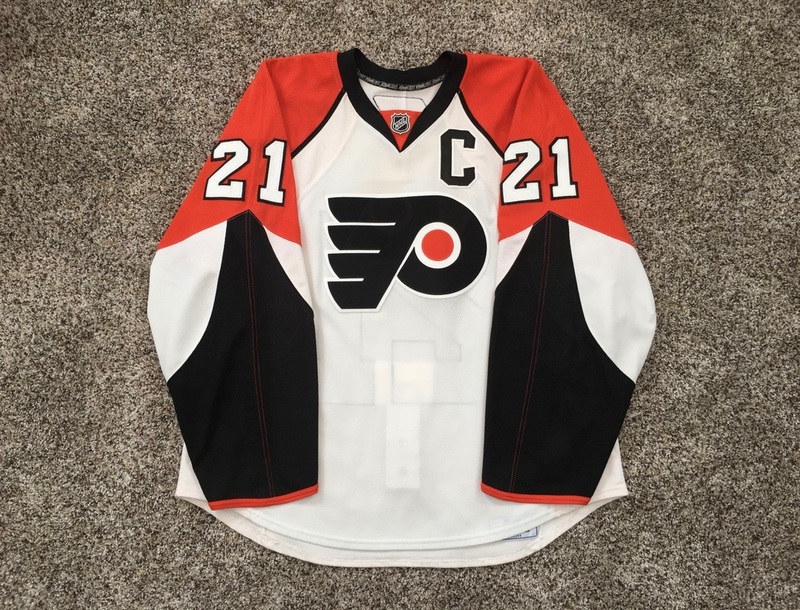 Jason Smith 2007-2008 Road Jersey w/"C"
This jersey was worn by Flyers captain Jason Smith towards the end of the regular season and during an interesting Stanley Cup Playoffs run during the 07-08 season. 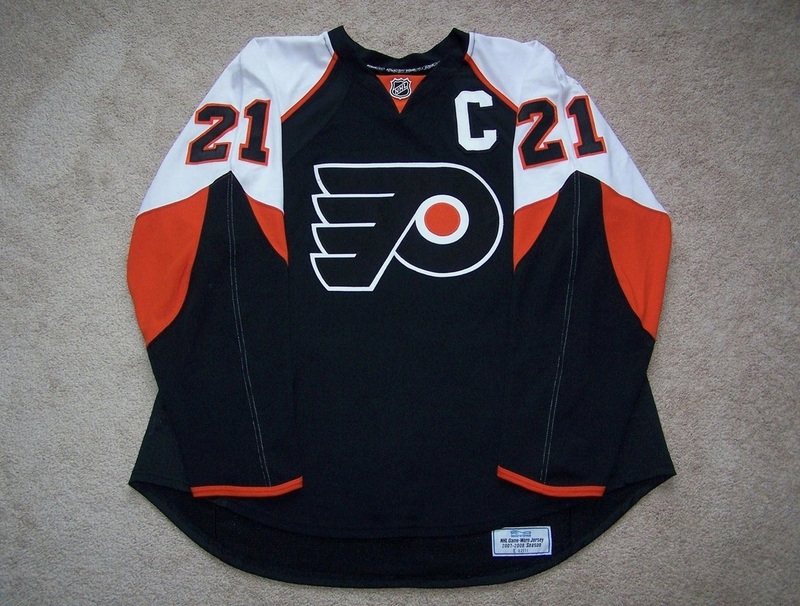 The front of the jersey has the captains "C" sewn to the left upper chest and black markings on the lower right hem. The left arm exhibits numerous board burns in the shoulder area, three board burns in the elbow area, and a 1/4" un-repaired hole in the cuff area. The right arm has four board burns in the shoulder area and black marks in the elbow area. 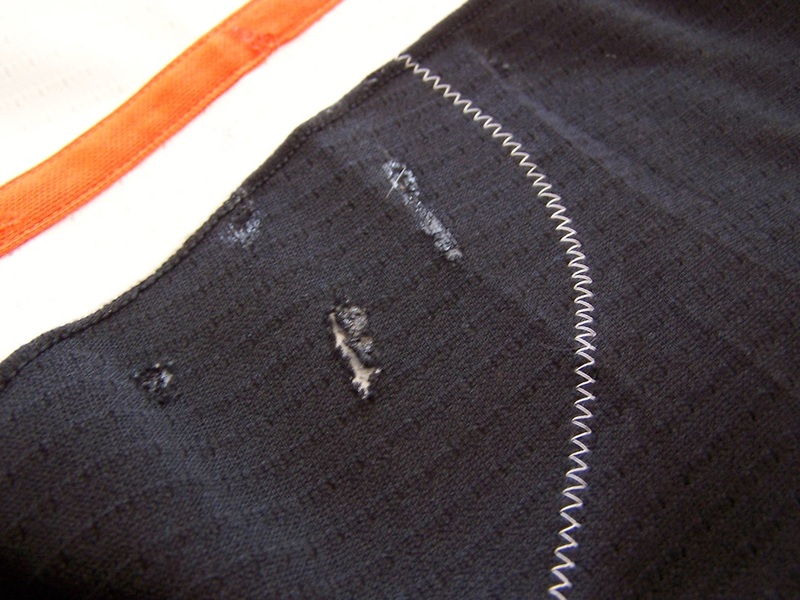 The rear shows two black markings at the lower tail of the jersey. 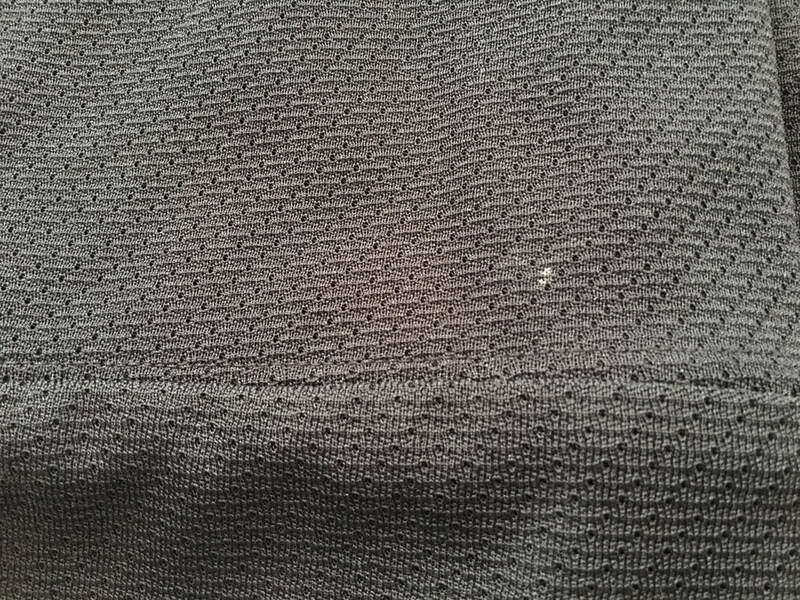 The inside features pilling to the fabric near the fight strap area most likely from the velcro and a size 58 size tag. 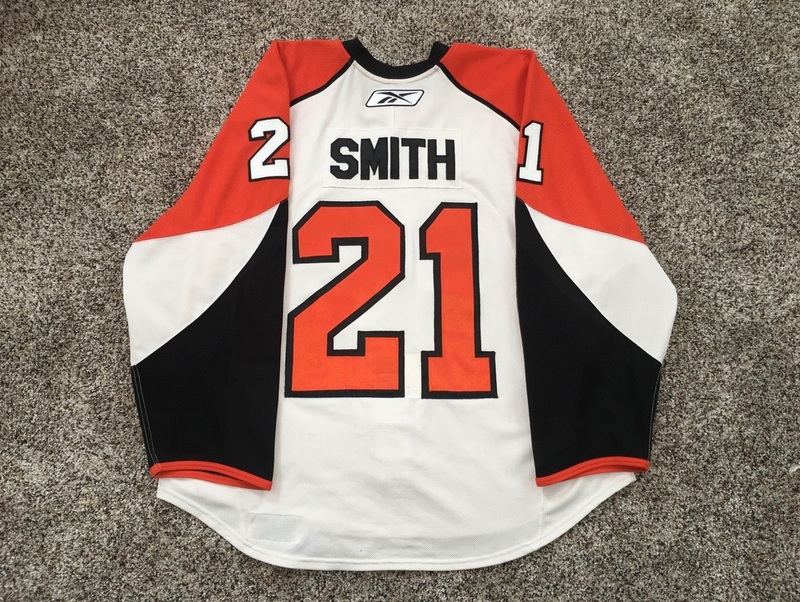 Jason Smith 2007-2008 Home Jersey w/ "C"
This first set jersey shows decent wear with red board paint and a board burn on the right cuff. The left arm wear consists of a 1 1/4" inch repair above the arm numbers and more red board paint. 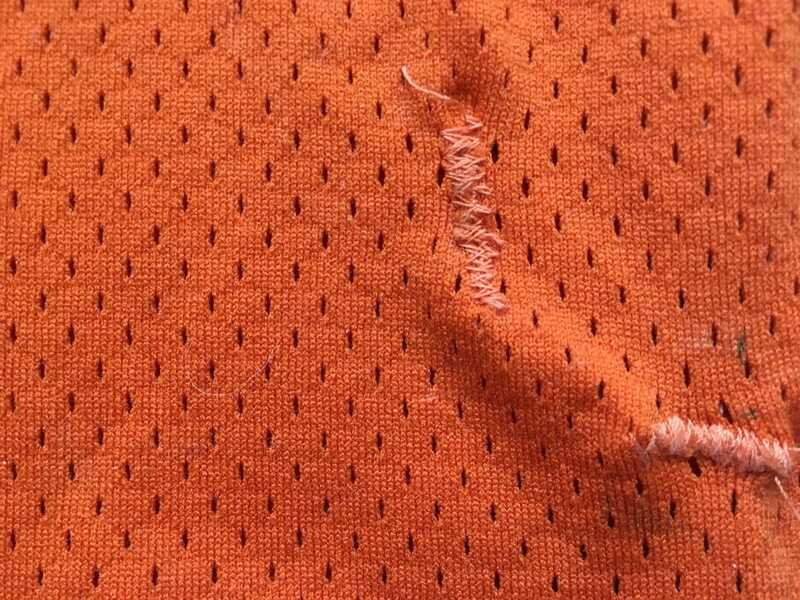 The front of the jersey shows some even wear with numerous fabric pulls. 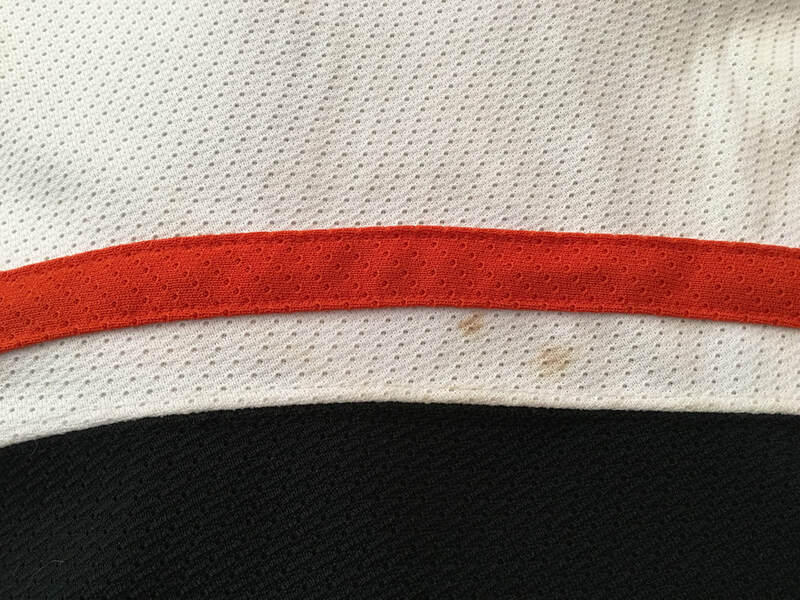 The back of the jersey has a white stick tape mark on the right shoulder blade area. 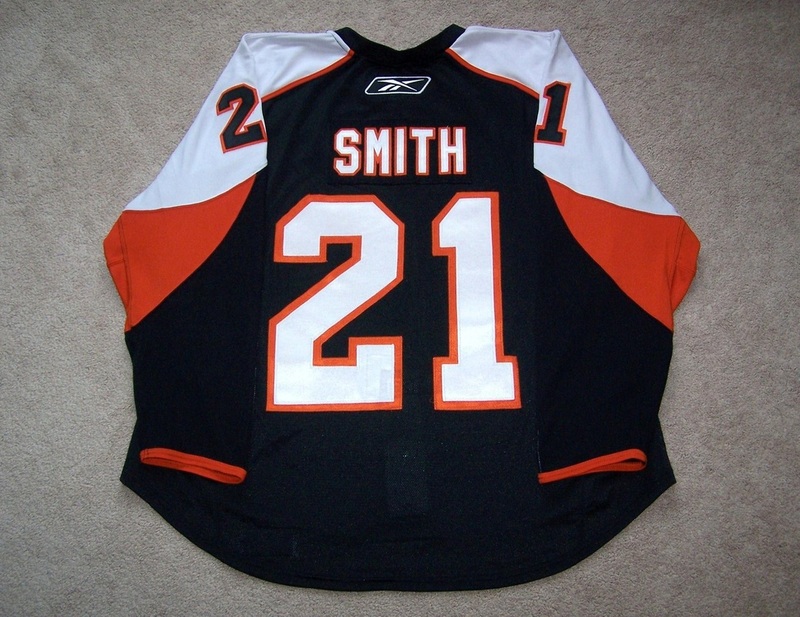 The threads around the collar are popped due to a couple of fights Smith had while wearing this jersey. 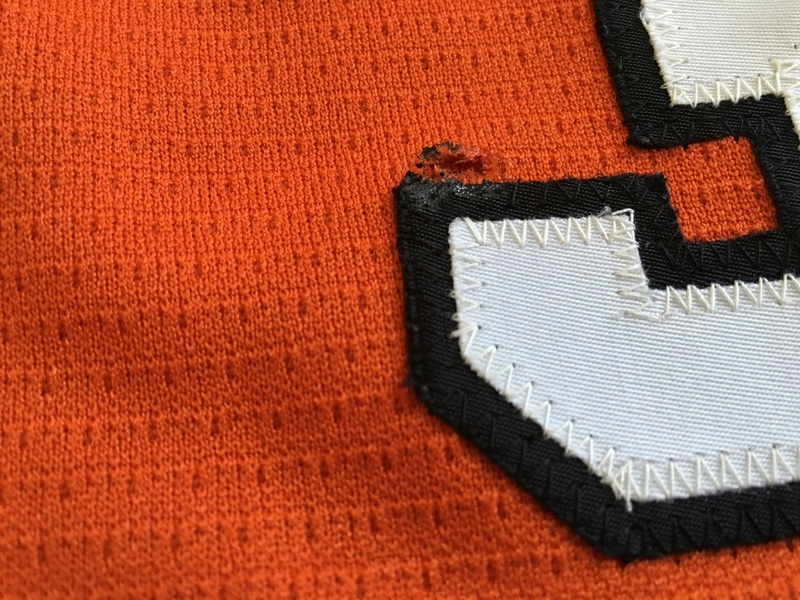 Small amount of glue residue remains to the left of the bottom portion of the "C" from the removal of the alternate captains "A" that was worn in the pre-season. 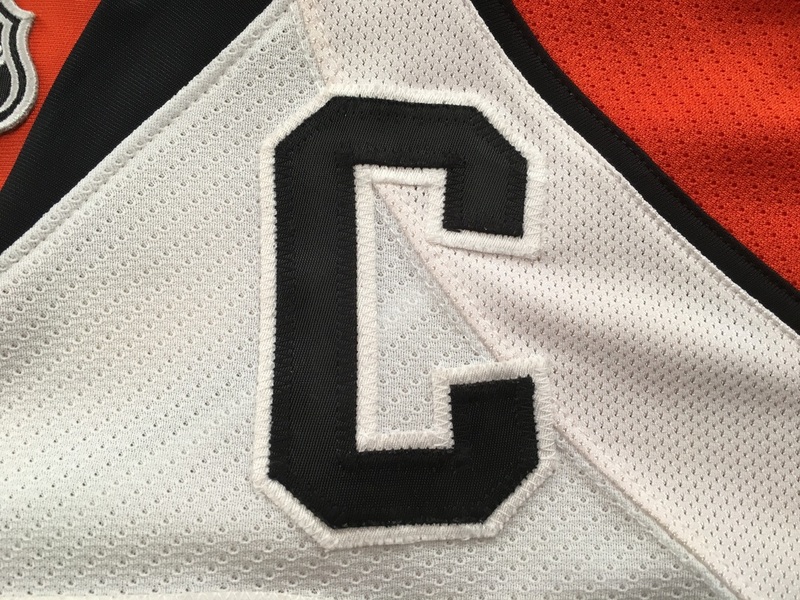 The captains "C" replaced the "A" when Smith was named as the 16th captain in Flyers history. 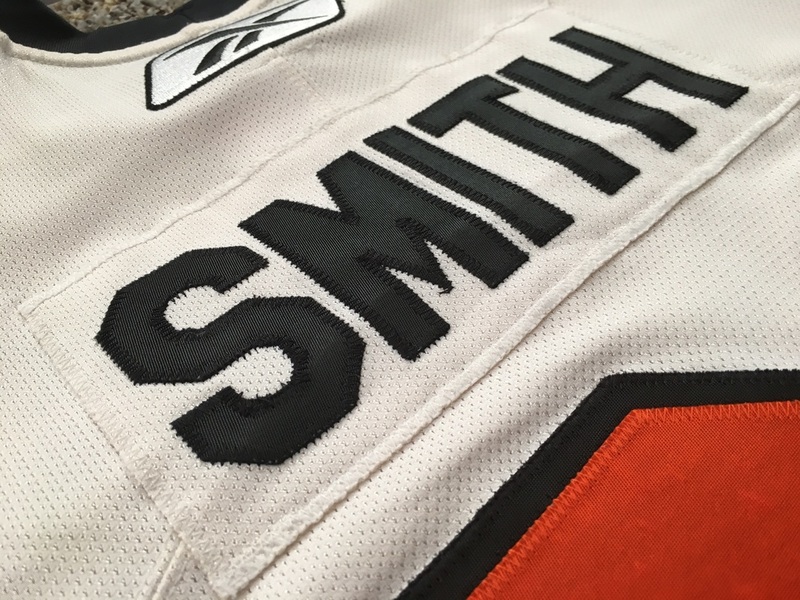 Smith scored his only goal of the season and added an assist while wearing this jersey for 13 games. Photomatched to the repair on the left arm. 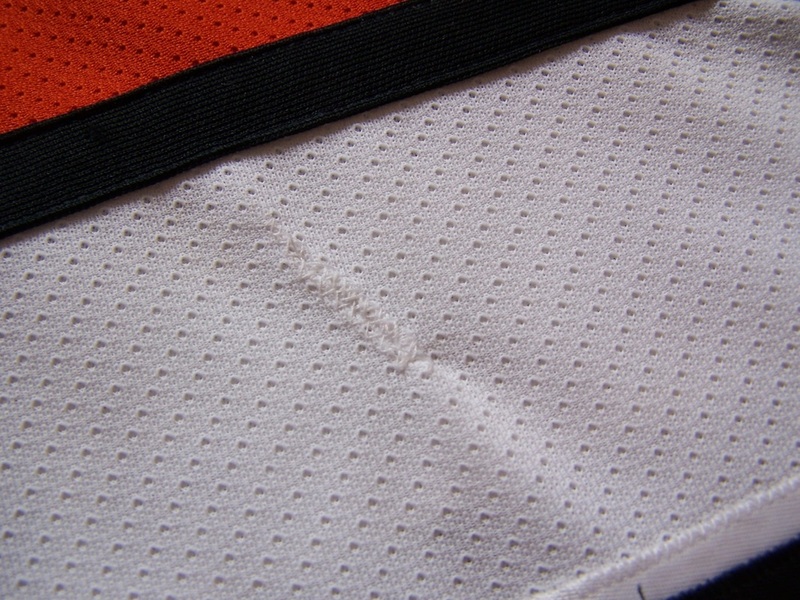 This jersey shows moderate wear with blood staining and black markings throughout the front of the jersey, a 1 1/4'' repair above the crest, and white stick marks on the crest. 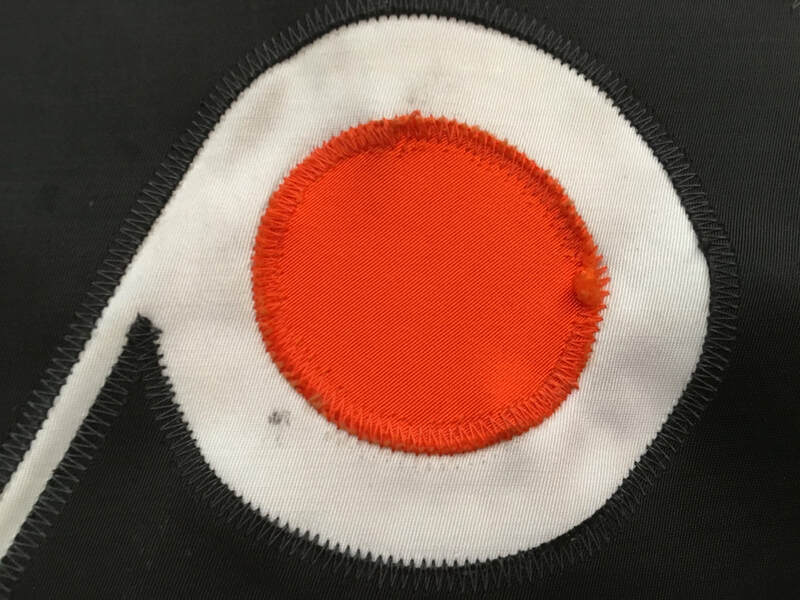 The right arm has two board burns in the cuff area, red dasher paint in the elbow area, and black markings in the orange part of the sleeve. The left arm has about five board burns in the elbow area and three light burns in the cuff area. 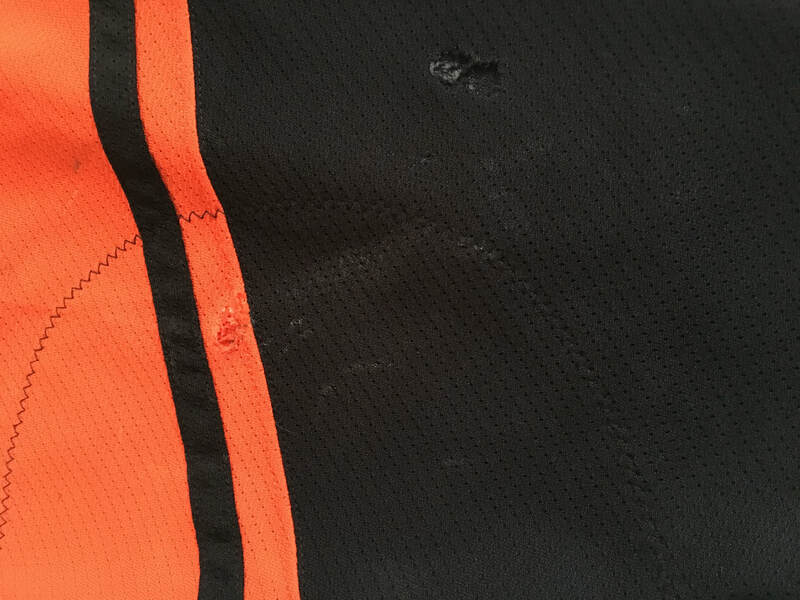 The rear of the jersey has an un-repaired hole on the upper right shoulder area, some areas of staining, and five decent black slash marks. 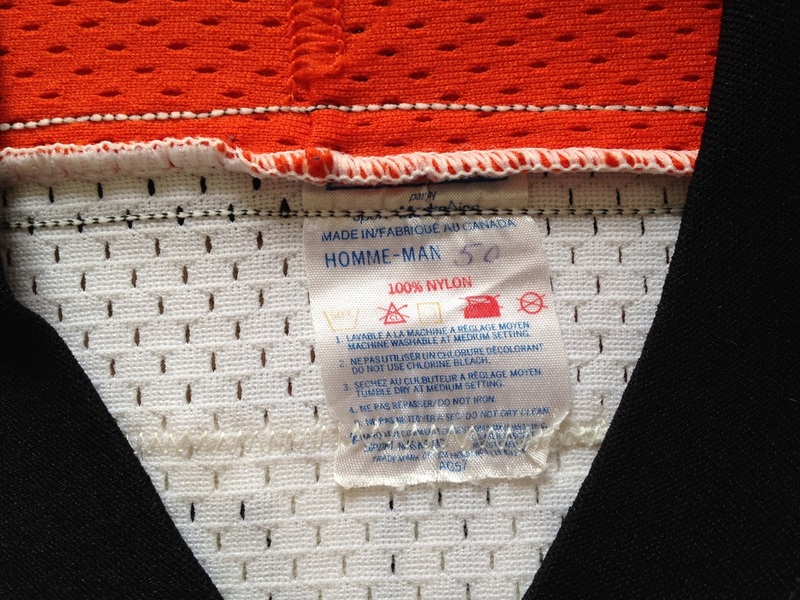 The inside of the jersey has some light pilling, a faded 6 in black sharpie on the CCM neck tag, and a salted fight strap with the Byrons Hockeyland inventory tag still attached designating 95/96 as the season this gamer was worn by Therien. 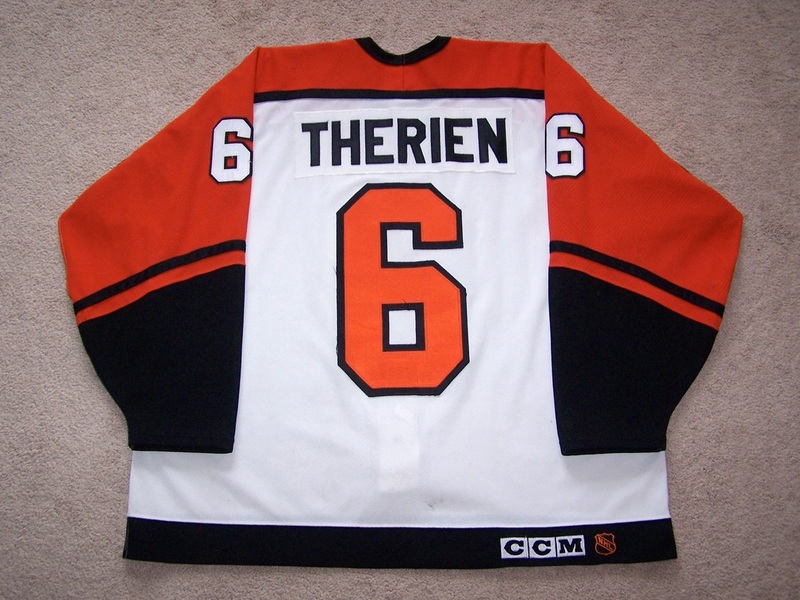 This jersey was worn by Therien during the 1998-99 season. 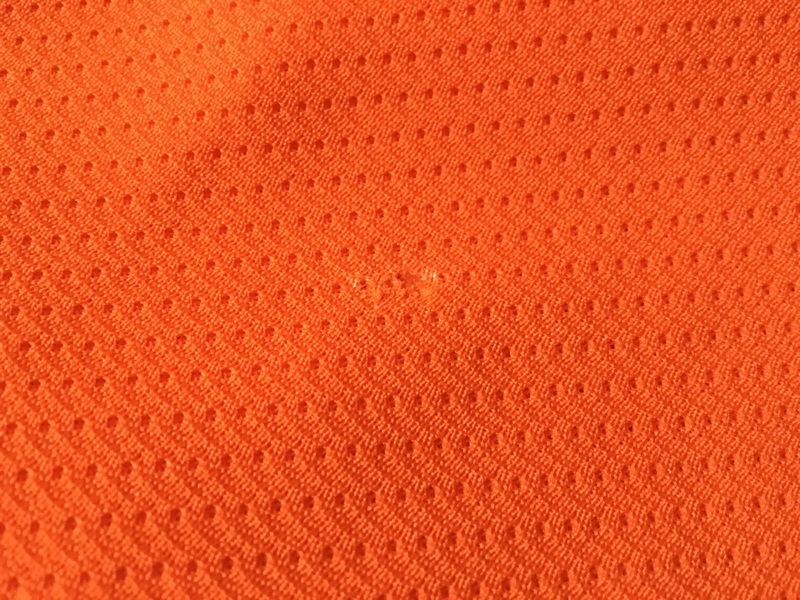 It shows good wear with the front of the jersey showing a 3" slash mark under the crest, and a white stick mark on the crest. 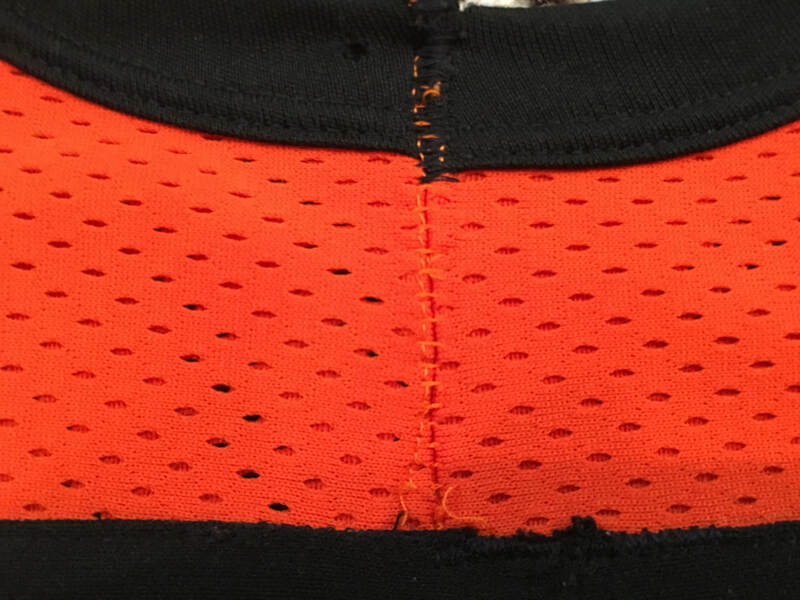 The right sleeve features 2 un-repaired holes next to the #6, board burns on the #6, 7 black markings, 2 un-repaired holes in the cuff area, and 7 board burns in the elbow area. 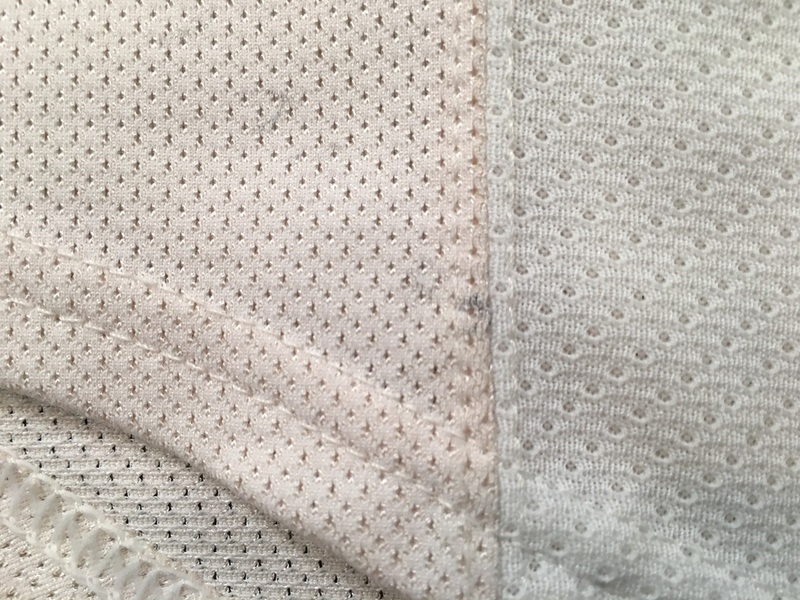 The left sleeve has a 1" un-repaired hole next to the #6, a large board burn on the #6, 5 black markings, 2 board burns in the elbow area, and one board burn on the cuff. 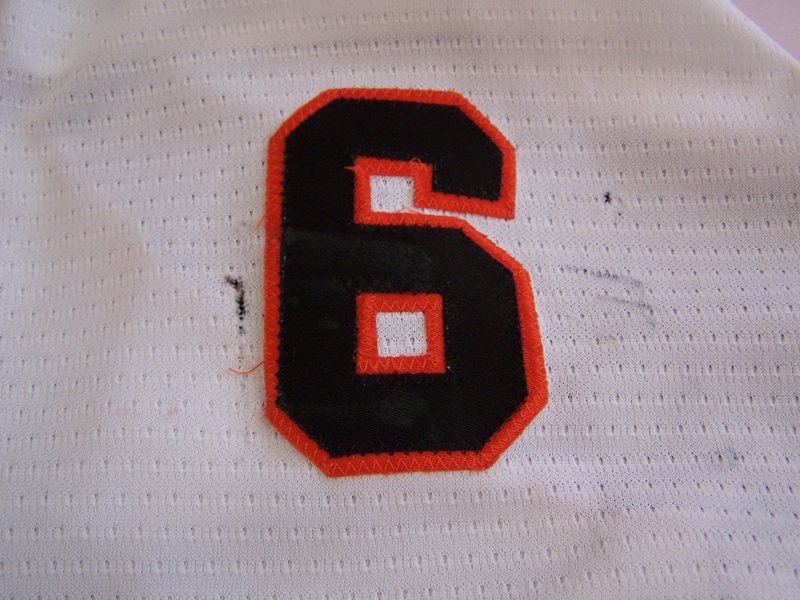 The rear of the jersey shows puckering to the #6, and loose threads on the nameplate letters. 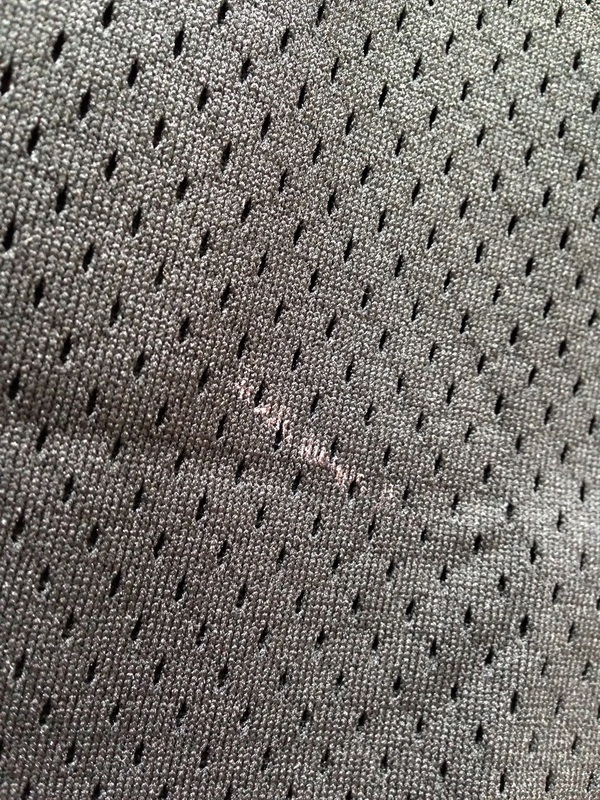 Inside there is a fair amount of pilling under each arm and a 6 is penned on the Nike tag in black sharpie. Gamewornauctions.net LOA. 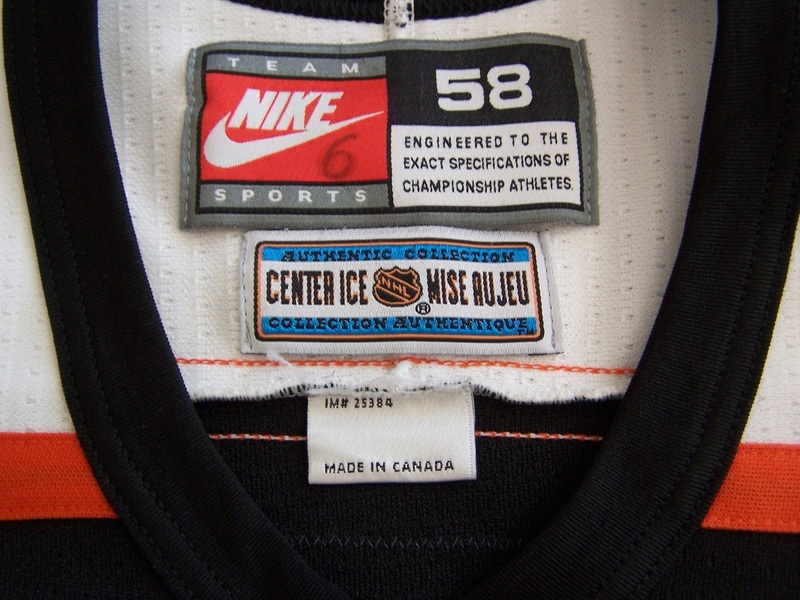 Worn during the 99-00 pre-season. Minimal wear with light stick and puck marks. 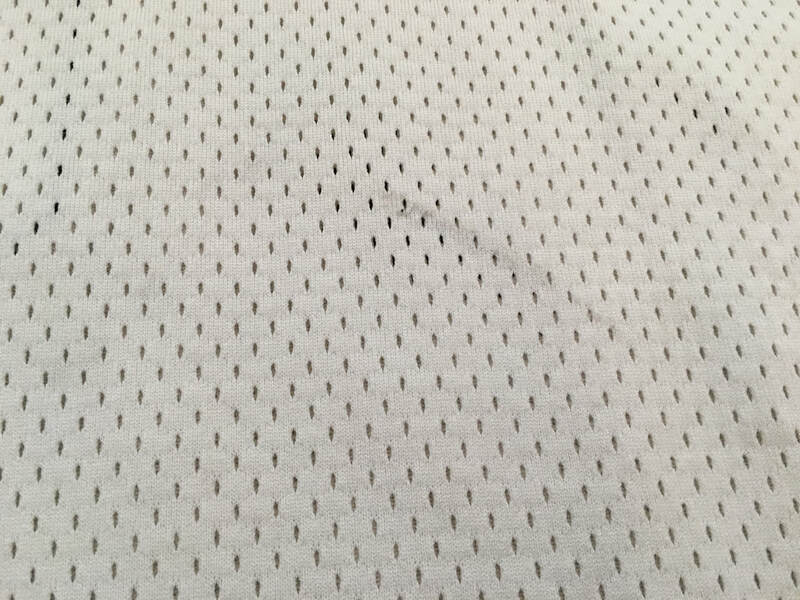 Some board paint on the sleeves. 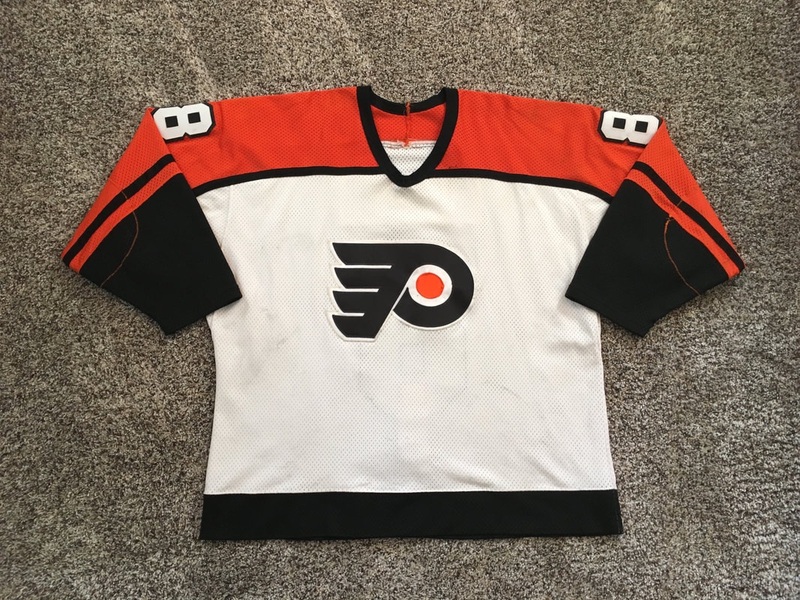 I determined this jersey to be from a pre-season set as the 2000 patch was never applied to the jersey. 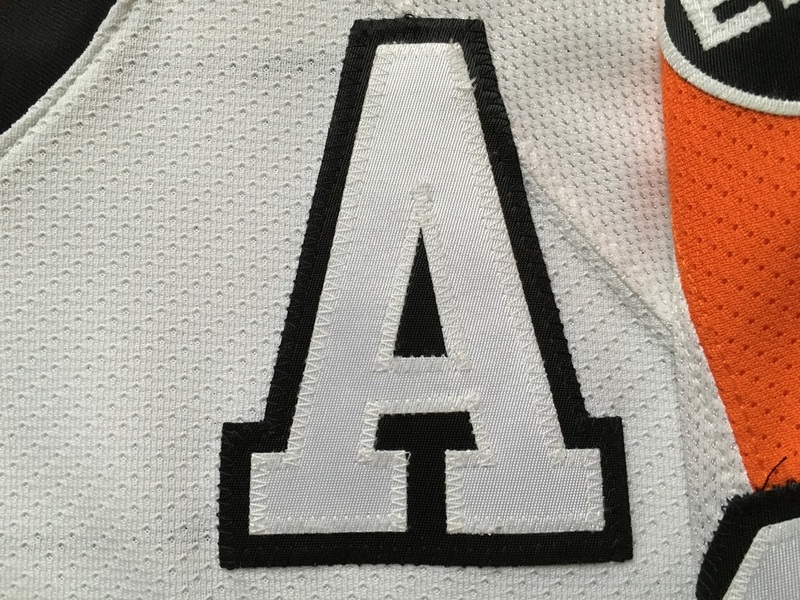 It also appears that there was an alternate captain's "A" that has been removed. Good wear consisting of board burns on both elbows. 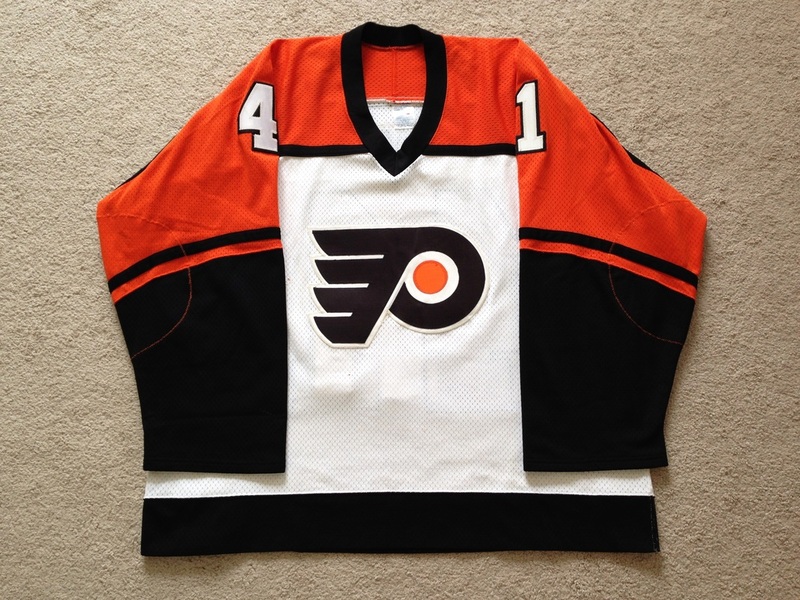 The flyers would only wear this style for a limited number of years. Note the three layered name and numbers. 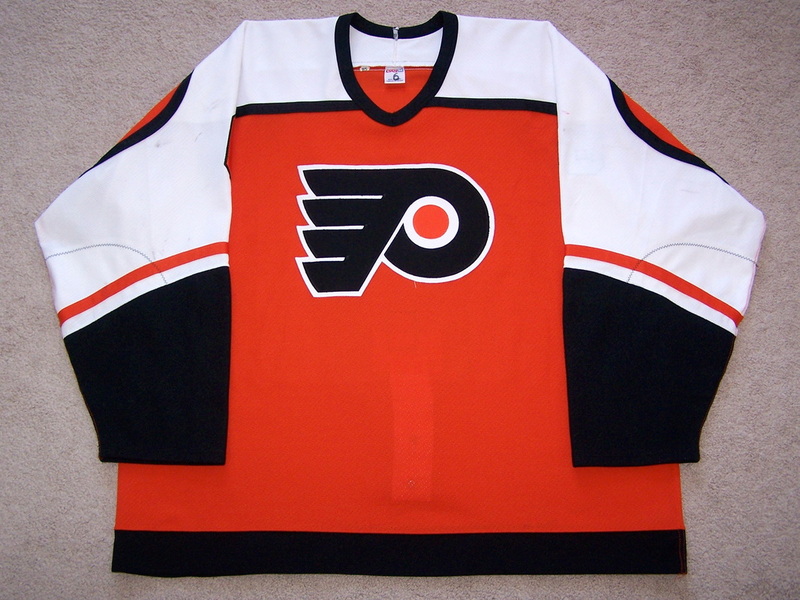 The metallic flying P on the front was re-styled for this new third jersey for the 2002-2003 season. LOA Classic Auctions November 2010. 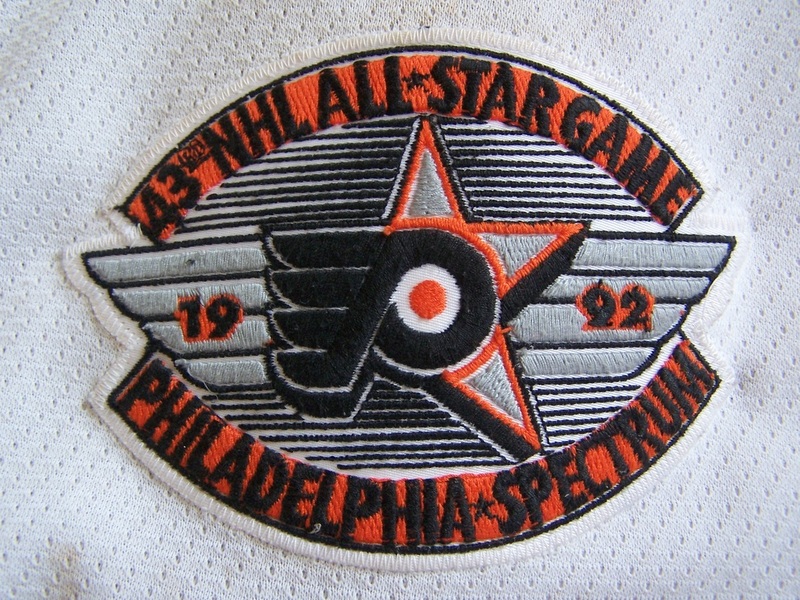 White home gamer from either the 1994-1995 season or the 1995-1996 season. 24 Penned on CCM/ Maska tag in neck. 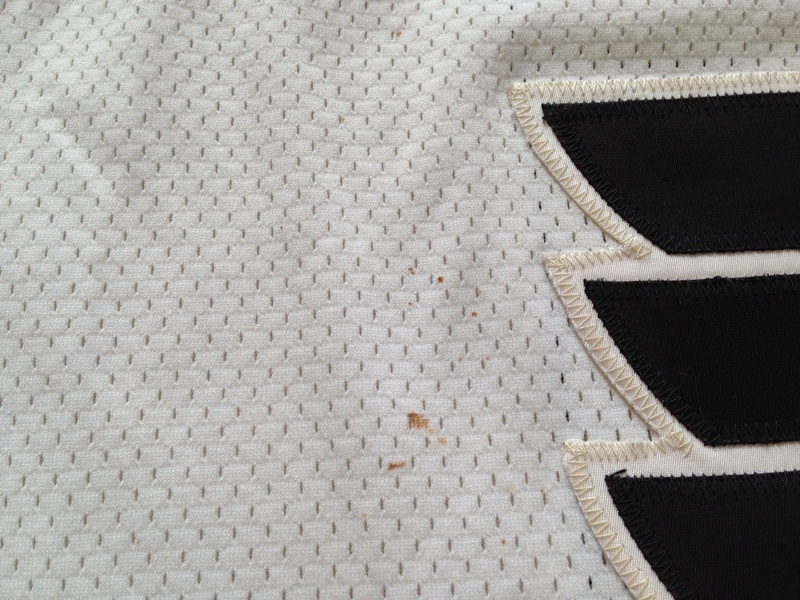 Jersey shows great wear with numerous repairs on the sleeves, fabric pulls, and a ton of blood on the front. Inside shows pilling under the arms and around the fight strap. 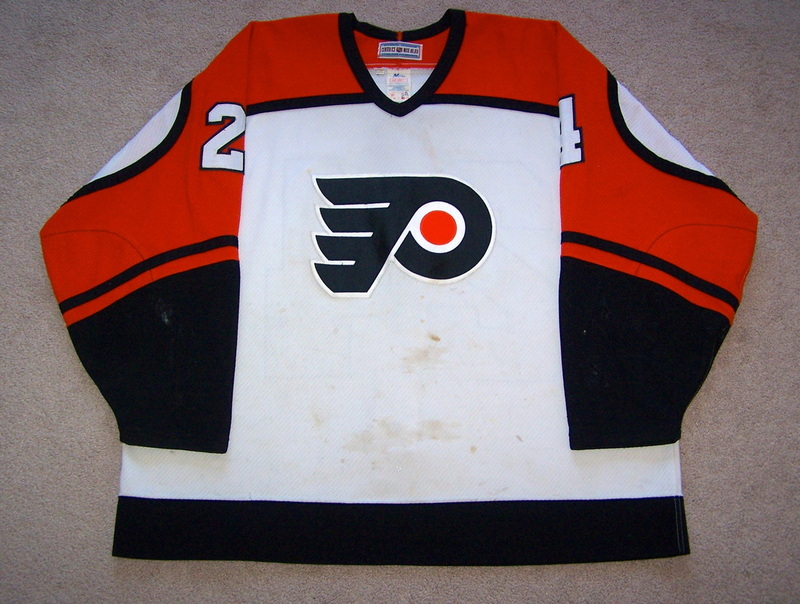 This jersey was worn by John Stevens during the 1986-87 season. He was called up for 6 games that year to fill in on defense. Two of those six games were at the Spectrum. 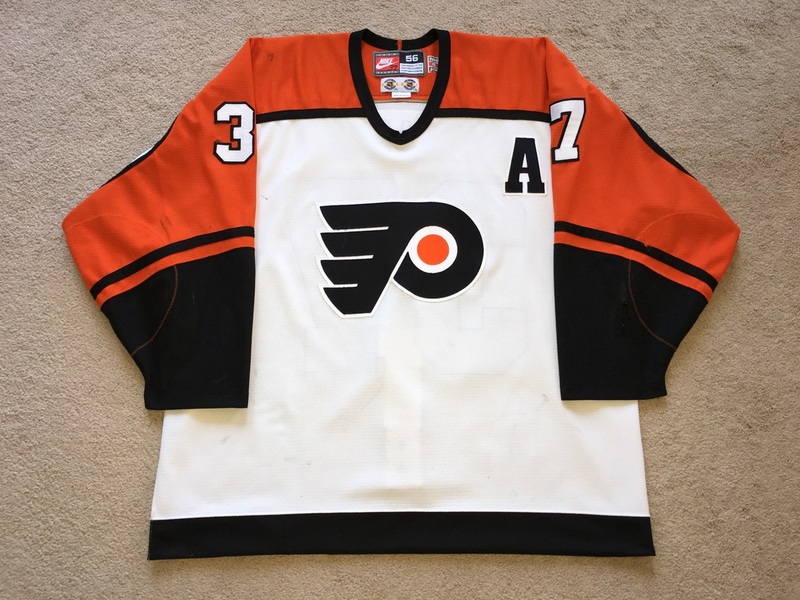 This jersey was worn on 1/29/87 in a 5-3 win over Pittsburgh and on 1/31/1987 in a 3-1 loss to the NY Rangers. 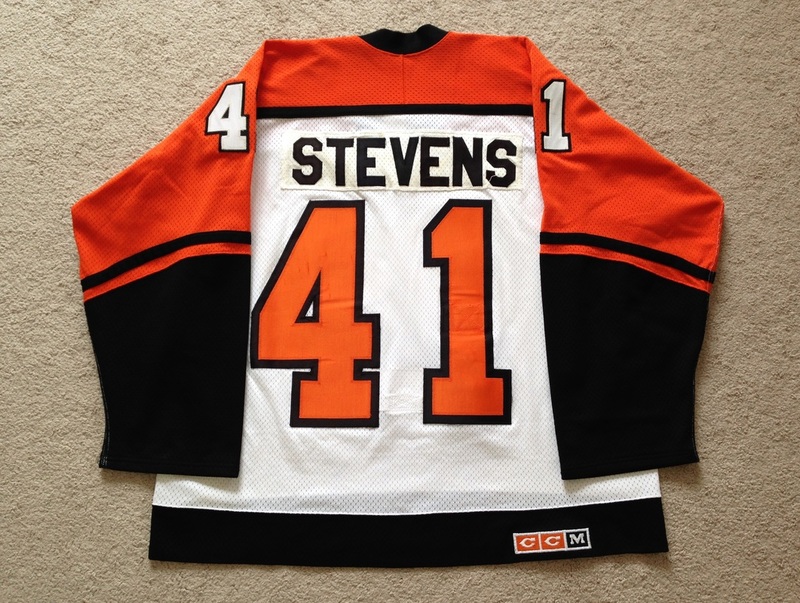 Stevens would get an assist during the Pittsburgh game on a Dave Poulin third period goal. 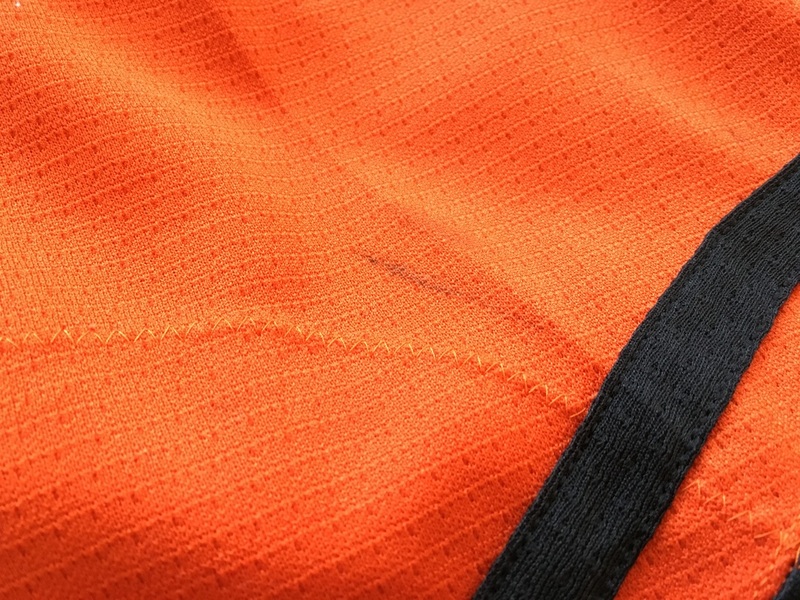 The jersey consists of light but evident wear with a small mark on the the right sleeve cuff area. There are a few dark brown stains to the right of and under the crest (possibly blood). 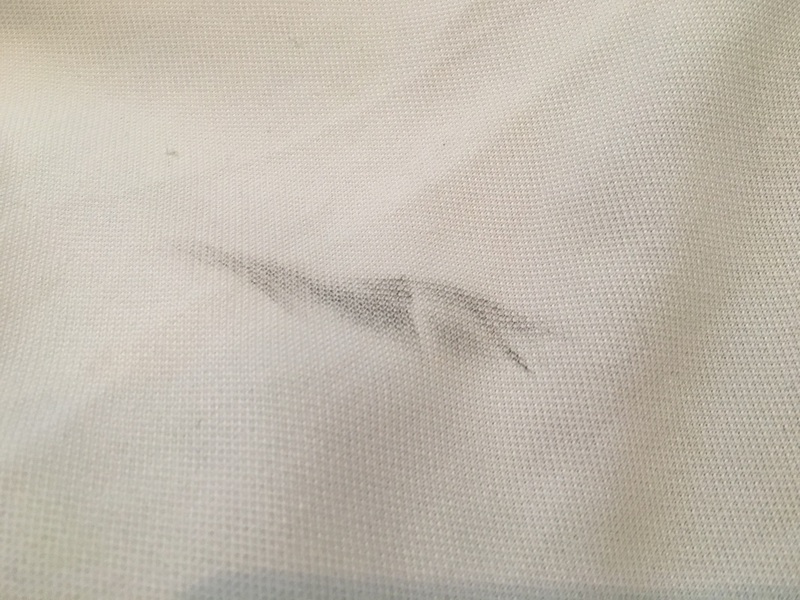 The left arm #1 has a black mark. 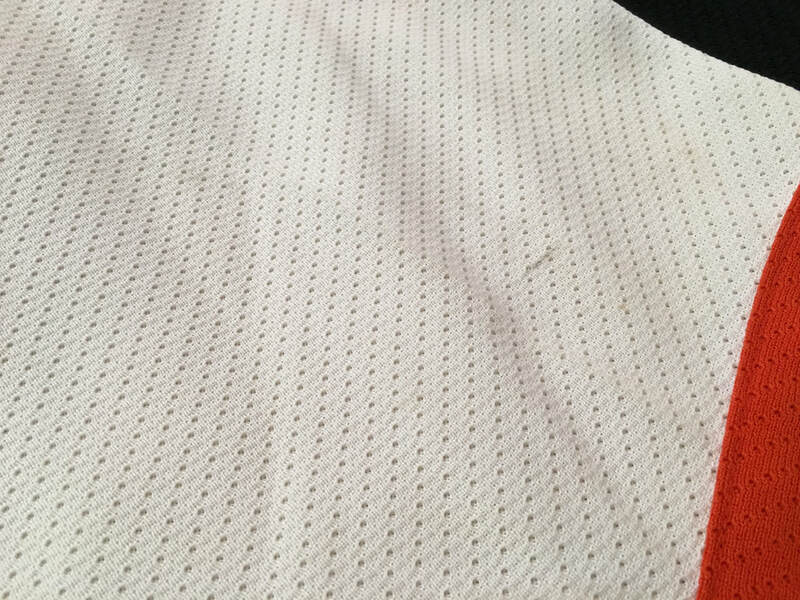 The rear of the jerseys shows nice even wear and the nameplate of matching mesh material seems to have yellowed over time. 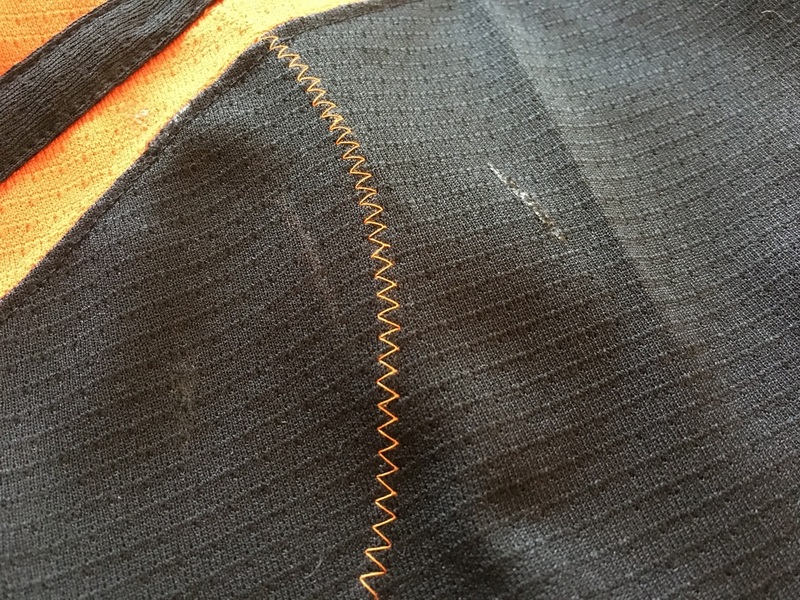 The fight strap which shows salting, has been attached through the rear #1. The original CCM fight strap was cut out by the team and the older style Eagle strap was used. 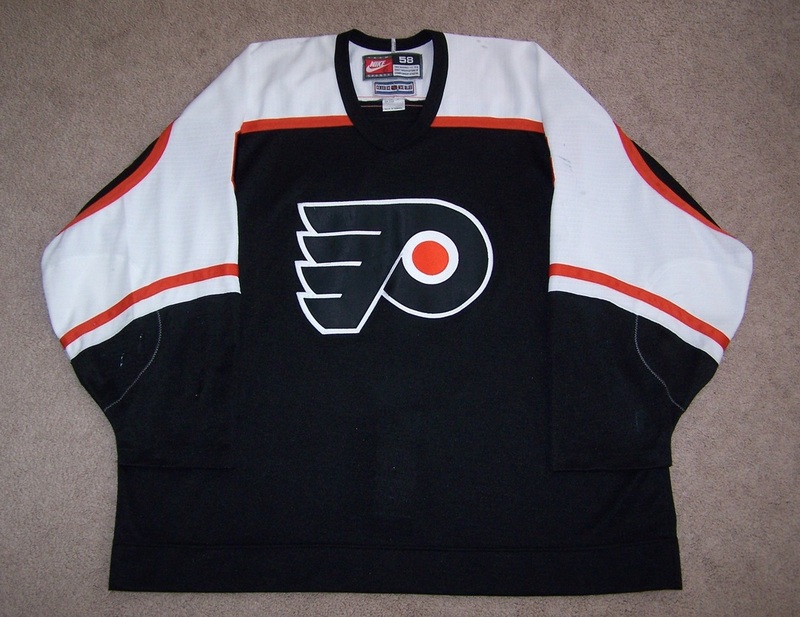 This was a common practice for jerseys in the home and road CCM sets with the long black cuffs. 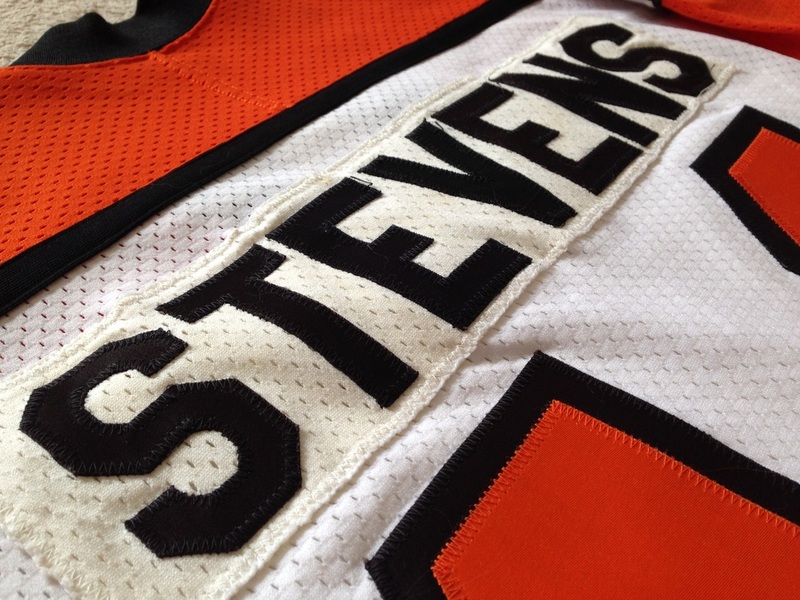 On 10/22/06, Stevens was hired as the new Flyers head coach. 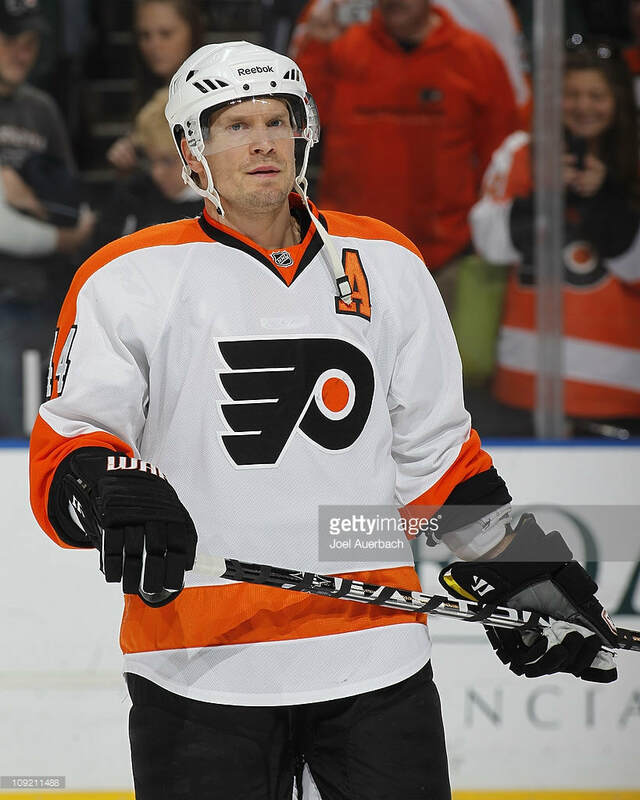 He was the 16th head coach in the history of the team that will be remembered for taking a team that was in the basement of the NHL at the end of the 06-07 season to the Conference Finals the very next year in the 07-08.